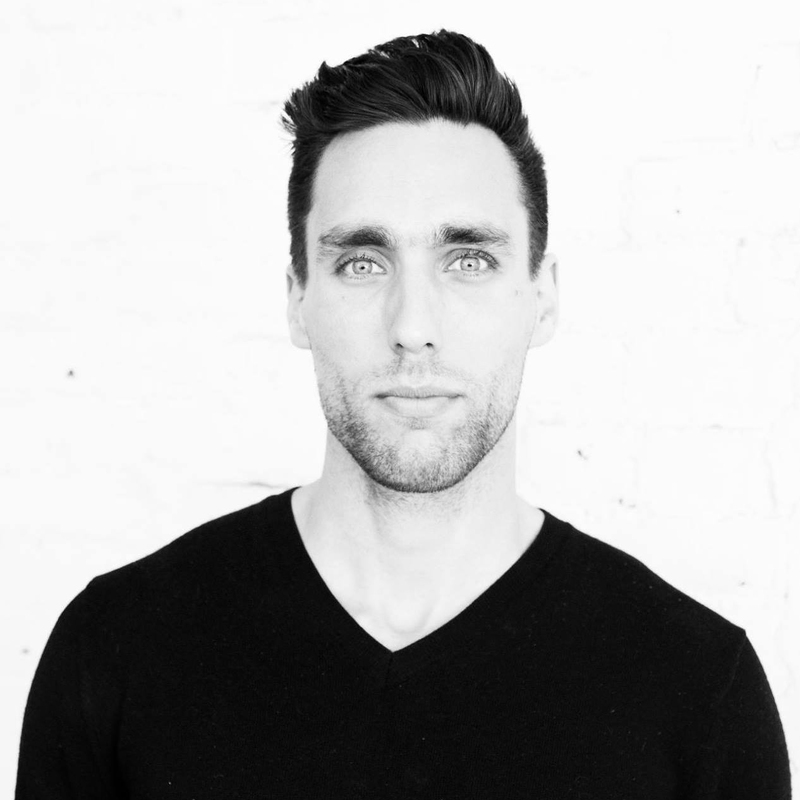 Adam Novack (BLA 2012 Landscape Architecture) has accepted a new job as project manager for design at Waterfront Toronto. 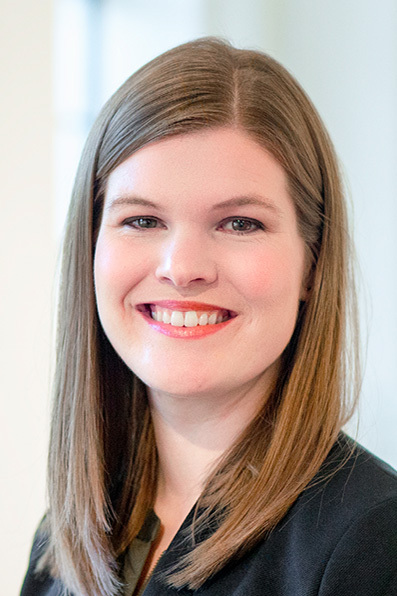 A. Elizabeth Ortner (BFA 1995 Interior Design), AIA, LEED AP, recently joined the Office of Capital Planning and Project Management at the University of Illinois at Chicago as assistant director for project management – architecture. 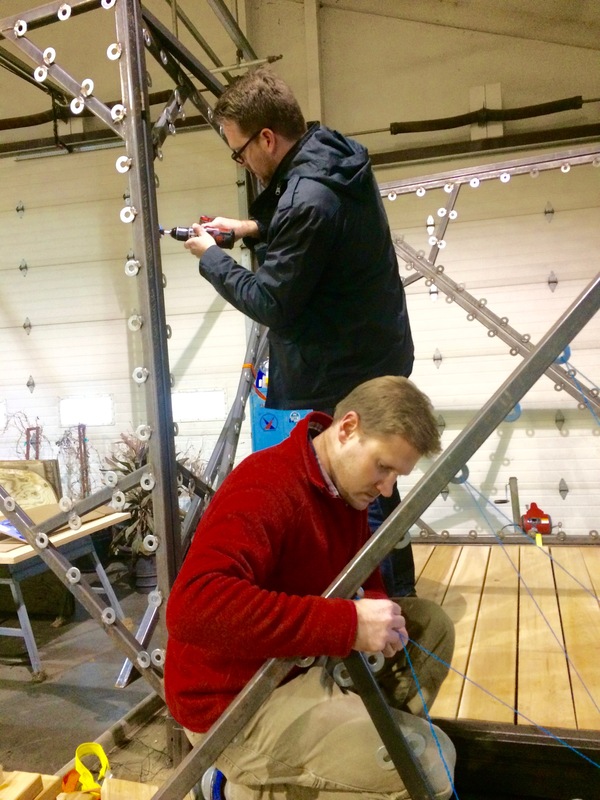 Ortner also is the Chicago leader for WiRE, Women in Restoration and Engineering. WiRE is a nonprofit providing leadership for women in the built world. Internationally renowned Chicago artist Theaster Gates, Jr. (BS 1996 Community & Regional Planning / MA 2005 Interdisciplinary Graduate Studies / Hon. Doctor of Humane Letters 2017), and Chicago Mayor Rahm Emanuel recently unveiled new works at the newly renovated CTA Red Line station at 95th Street. A pair of large tapestries by Gates, made entirely of old fire hoses, also went on display. “Social [Justice] Media,” a project by Folio and EUS+ Architects, was named a finalist in the universal design category of the 2019 Design that Educates Awards (DtEA). Bosuk Hur, (BArch 2005 / MArch 2006 Architecture), an Iowa State University lecturer in architecture, is a founder and partner of Folio. He collaborated on the project with former ISU architecture faculty member Jungwoo Ji and alumnus Suk Lee (BArch 2018 Architecture) of EUS+ Architects. The DtEA recognize, showcase and promote globally the best ideas and implementations of architecture and design that educate, providing an opportunity for a dialog between the user and the designer. A complete list of awards is available (PDF) online. 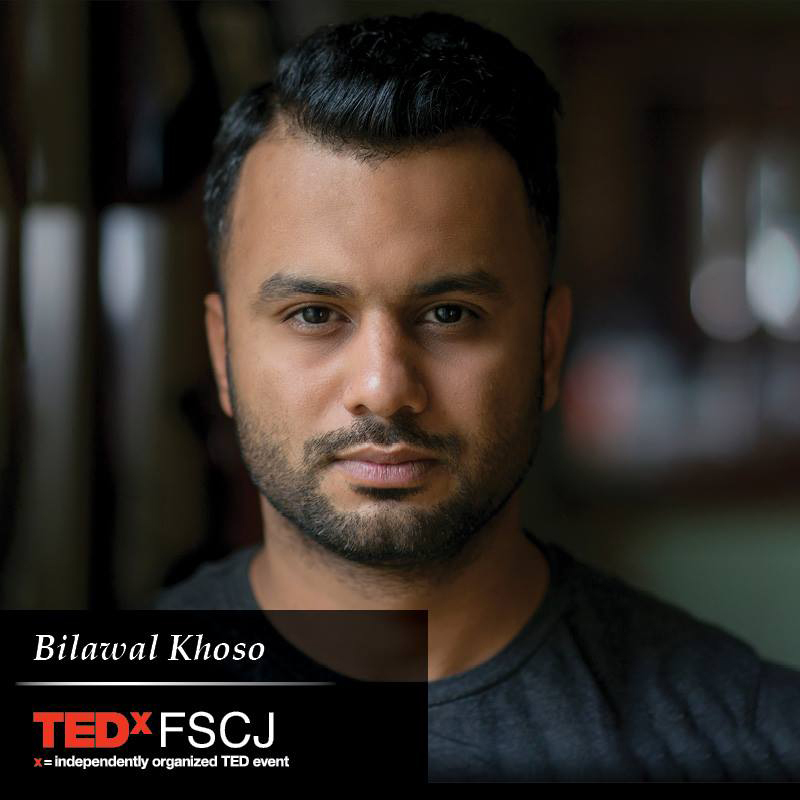 Bilawal Khoso (MFA 2018 Graphic Design) has been selected as a speaker at TEDxFSCJ Saturday, April 6, at FSCJ South Campus in Jacksonville, Florida. 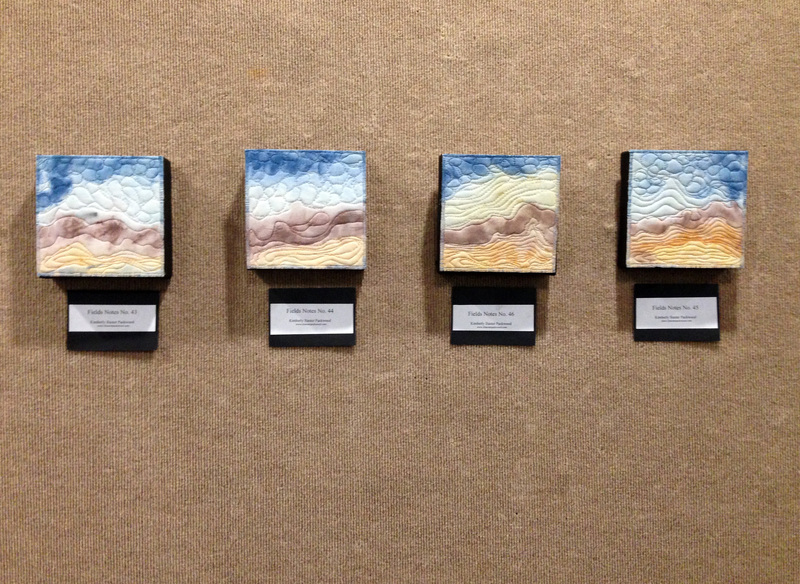 His mixed-media installation will also be on display at the GET Exhibit during the TEDx event. Digital marketing experts estimate we see 4,000 to 10,000 ads per day. Now imagine what would happen if we began using digital persuasion not to sell more goods, but to counter the racist narratives and hateful stereotypes that underwrite the global rise of extremism? That’s graphic designer Bilawal Khoso‘s vision. You can see his thought-provoking GET Exhibit, then hear his inspiring talk at TEDxFSCJ 2019: Reimagine the(Im)Possible. 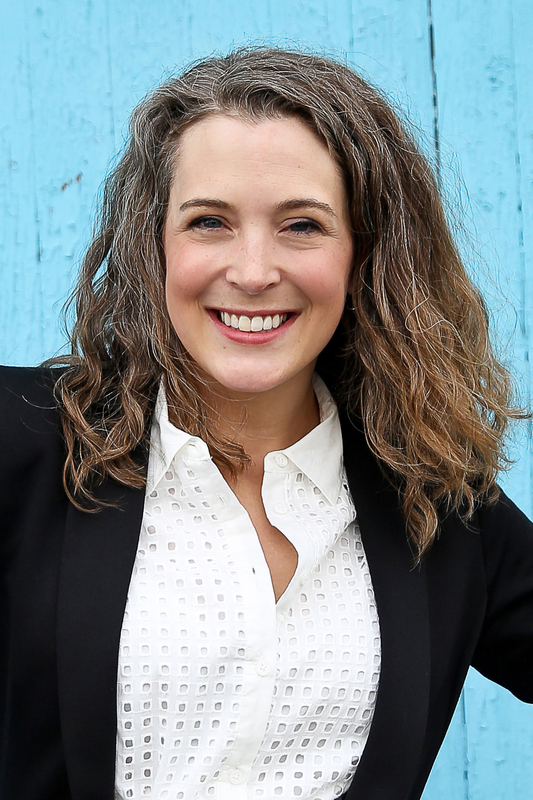 Anna Bogler (BLA 2001 Landscape Architecture) recently was recognized as a 2019 Boutique 18 Up-and-Coming Designer in the hospitality industry by Boutique Design. 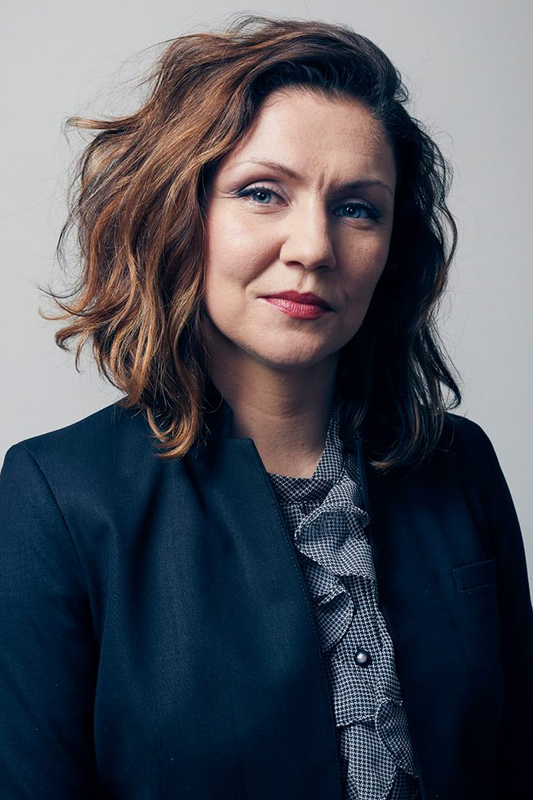 She was honored at an awards ceremony March 13 at the Globe Theater in Los Angeles and participated in a roundtable panel March 14 with peers discussing trends in the industry. Photographs by Kristine Heykants (BFA 1988 Art & Design – Drawing, Painting, Printmaking), Minneapolis, Minnesota, will be on display March 23 through June 23 in the Sioux City Art Center Selects exhibition at the Sioux City Art Center in Sioux City, Iowa. She is one of eight artists from the Upper Midwest selected for this regional juried exhibition and the only photographer represented. Curator Todd Behrens chose five portraits of women from Heykants’ “Uprooted” documentary project about her father’s hometown of Belmond, Iowa. An opening reception will be from 5–7 p.m. Friday, March 22, with artist talks and panel discussions beginning at 10:30 a.m. Saturday, March 23. 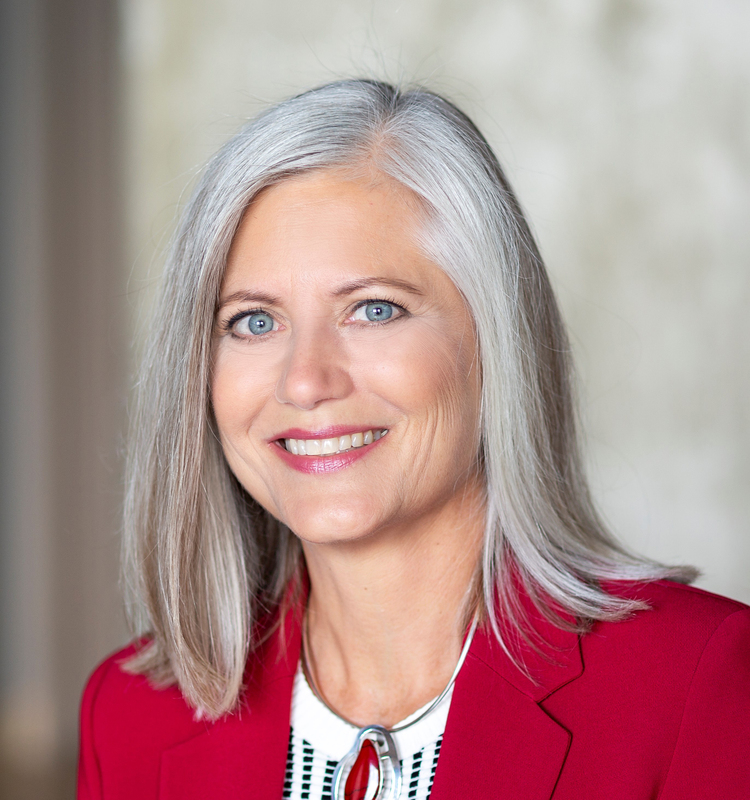 Lynn M. Ross (BS 1999 Community & Regional Planning), AICP, founder and principal of Spirit for Change Consulting, LLC, in Miami Beach, Florida, was selected as one of The Planner’s Women of Influence 2019. The Planner magazine, published by the Royal Town Planning Institute, issues its Women of Influence selections on March 8 every year for International Women’s Day. The purpose of the list is to celebrate the impact of women on the field of planning and planners. Ross is one of only two women from the US selected for the 2019 recognition. “Portrait of the Artist and His Mother” (graphite and acrylic mixed-media on panel) by Robert Jinkins (MFA 2018 Integrated Visual Arts) won first place and $3,000 in the 37th Bradley International Print and Drawing Exhibition. The show is on display March 9 through April 12 at the Bradley University Galleries. “The Lady in Green” by Robert Jinkins (MFA 2018 Integrated Visual Arts) has been accepted into the Wausau Museum of Contemporary Art’s WMOCA International Biennial Portrait Competition 2019. The show will be on display April 9 through June 29 in Wausau, Wisconsin. 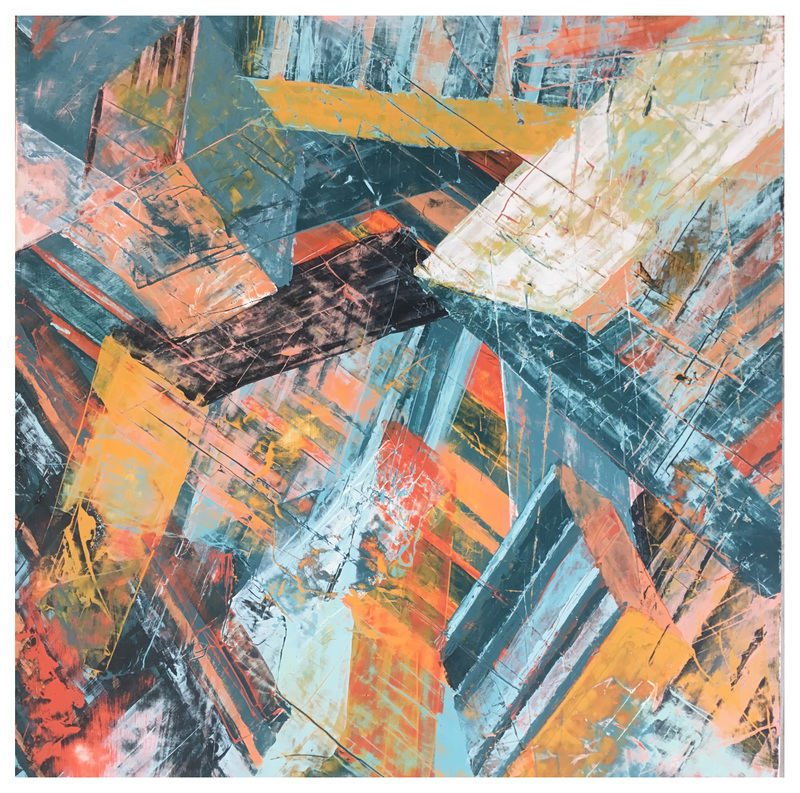 Not Quite an Architect, an exhibition featuring new paintings by Chris Vance (BFA 2000 Visual Studies), will open with a reception from 5-9 p.m. Friday, March 1, at Moberg Gallery in Des Moines. 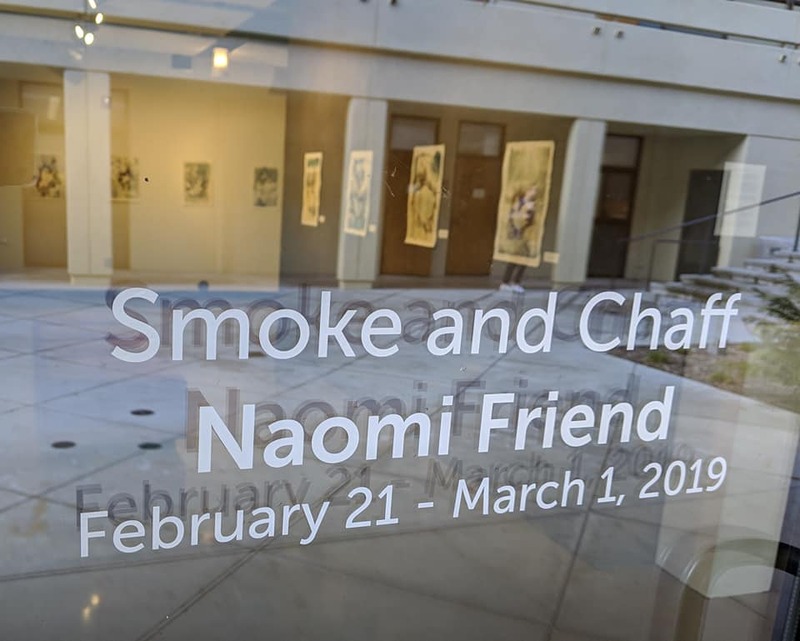 Smoke and Chaff, a solo exhibition by Naomi Friend (MFA 2013 Integrated Visual Arts), is on display Feb. 21 through March 1 at Westmont College in Santa Barbara, California. Layers on Layers: Screen Printed Posters by John Bosley, an exhibition by John Bosley (BFA 2003 Integrated Studio Arts), is on display Feb. 9 through March 25 at the Iowa State Memorial Union Gallery. 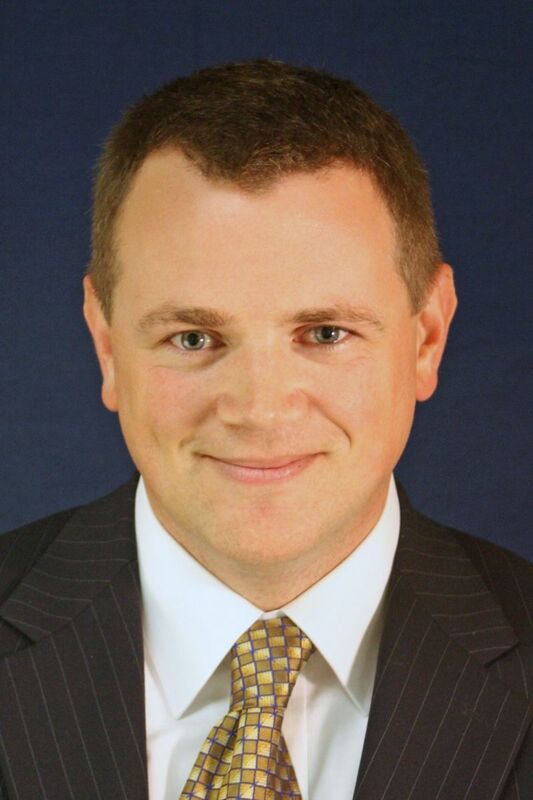 Ray Pruchnicki (BS 1989 Community & Regional Planning) recently became the in-house real estate counsel at InSite Real Estate in Oak Brook, Illinois, a build-to-suit retail and industrial real estate development company. 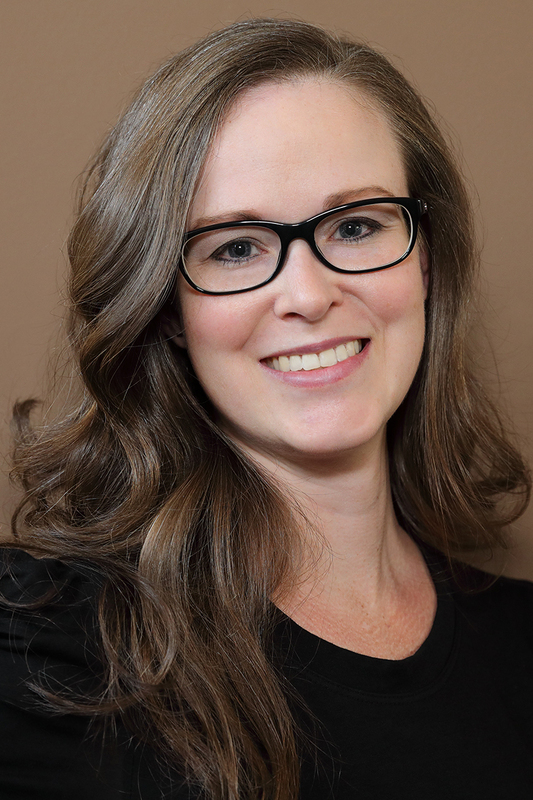 Rachelle Schoessler Lynn (BFA 1990 Interior Design), FASID, LEED Fellow, has been elected to the Council for Interior Design Accreditation (CIDA) board of directors. CIDA advances the interior design profession as the definitive source for quality standards and accreditation in higher education. 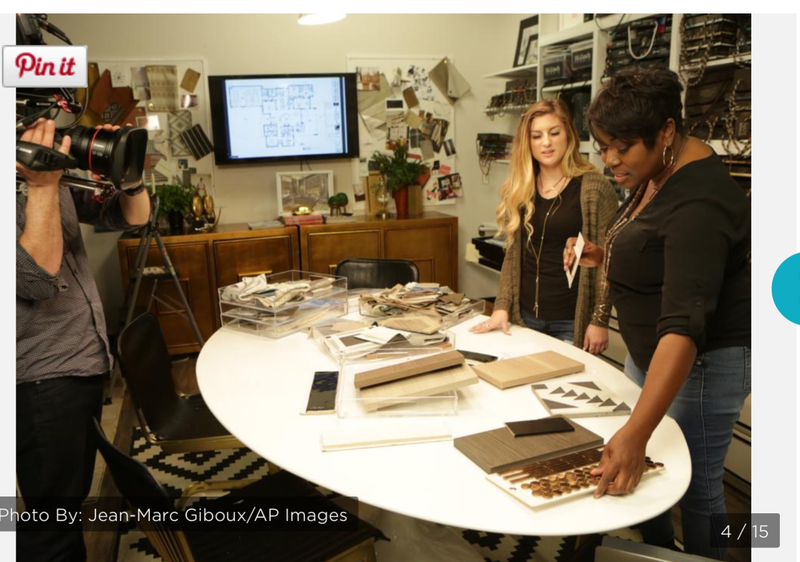 Interior designers are sought-after professionals because of their education and expertise in elevating the human experience in the built environment. The Iowa State University interior design program is accredited. Clark Colby (BArch 2011 / MS 2016 Architecture), lecturer in art and visual culture and ISU Extension and Outreach arts, communication and design 4-H youth program specialist, led a group of Iowa 4-H Camera Corps youth to the Professional Photographers of Iowa (PPI) Winter Convention. 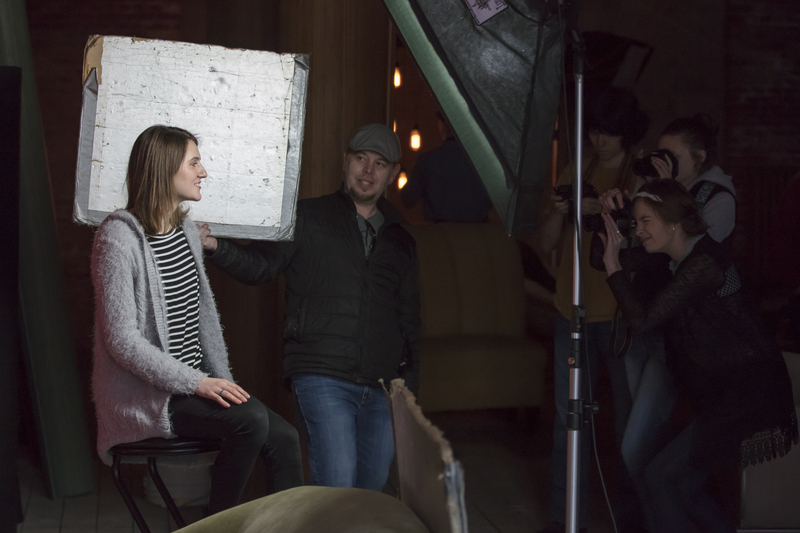 In a new partnership with PPI, youth attended the conference and took part in a hands-on portrait photography workshop session Feb. 3 in Cedar Rapids. Abby Luchsinger, senior in interdisciplinary design from Woodbury, Minnesota, helped run the event. Artwork by Brent J. Kastler (BA 1985 Graphic Design) is part of the Seeing God: 2019 Juried Exhibit of Sacred Art Jan. 28 through March 9 at St. Paul’s Monastery in St. Paul, Minnesota. The show consists of works that depict spiritual elements and connections to God representative of natural wonder or the abstract. 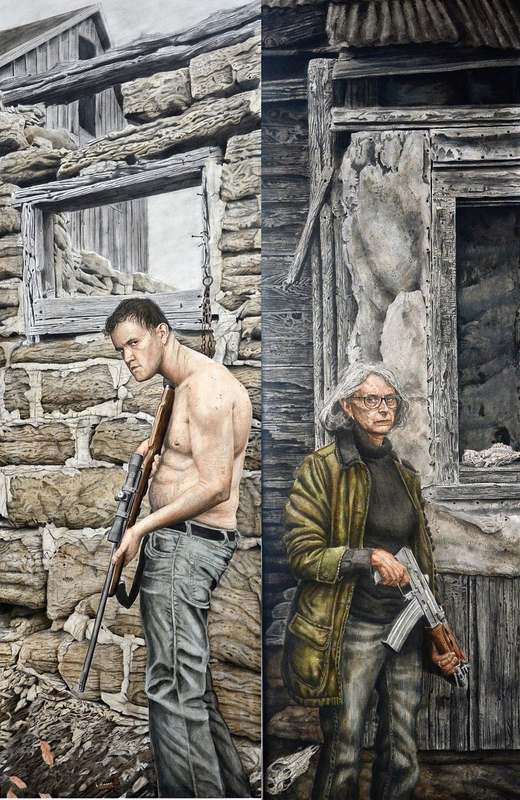 “Portrait of the Artist and His Mother” (diptych, graphite and acrylic mixed media on panel) by Robert Jinkins (MFA 2018 Integrated Visual Arts) has been accepted into the 37th Bradley International Print and Drawing Exhibition, the second-longest-running juried print and drawing competition in the nation. Julian Abele, Architect and the Beaux Arts, a book by Dreck Spurlock Wilson (BS 1971 Urban Planning), ASLA, NOMA, has been published by Routledge (January 2019). Wilson is a landscape architect with Landscape Consortium, Ltd., in Washington, DC, and formerly an associate professor of architectural history at Howard University. Leisure Suit Series, an exhibition of eight fiber artworks by Catherine Reinhart (BFA 2008 Integrated Studio Arts), gallery director and artist-in-residence at the Iowa State University Design on Main Gallery, will be featured Feb. 1 through April 30 at the Iowa Law Library as part of the Iowa Arts Council’s Art at the Library Series. Caregivers have a unique power to provide comfort, ease suffering and connect people. Through the repetitive manipulation of individual threads from a discarded polyester quilt, Reinhart seeks to mimic the ritual actions and deep consideration caregivers provide to their community, ultimately restoring value and breathing new life into a once forgotten object. The Power of Place considers profound understandings of place in the work 29 artists who received degrees from the University of Kansas. Each artist compels the power of hand making in some form and addresses the power of place, whether it be historical places; the spaces of a textile as place; sites or places of past or current distress, trauma, or violence; place as an abstract idea; or place as a visceral reality. The focus on place also explores the power of this place — the KU campus and community — in shaping students who make art. “Fallen” and “Awaken,” two oil paintings by Jeremy Caniglia (BFA 1993 Art & Design – Drawing, Painting, Printmaking), will be display in the Figuratively Speaking exhibition Feb. 19 through March 7 at Salmagundi Gallery in New York City. An awards reception will be from 6-9 p.m. Thursday, Feb. 28. His monoprint titled “Waiting Beauty” will be part of the SCNY Printmaking and Monotype Show Feb. 17 through March, also at Salmagundi Gallery. A closing reception will be from 6-9 p.m. Thursday, March 7. Work by Melanie Vote (BFA 1995 Craft Design) is part of Representing: Selected Works from Alumni and Faculty of The New York Academy of Art on display Jan. 26 through April 24 at the Artisan Lofts building in Tribeca, Lower Manhattan, New York. Shown at right is Vote’s “Summer 2018” (oil on paper on wood), an ironic depiction of how to save the earth. A public reception will be from 6 – 8 p.m. Tuesday, Feb. 5. A Woman’s Spirit: Internal and External Nature Explored, a solo exhibition of work by Roxane Hollosi (BFA 1985 Art & Design), is on display Jan. 10 through Feb. 28 at Ventulett Gallery, Holy Innocent’s Episcopal Church in Atlanta, Georgia. VI, an exhibition of work by Caleb Henkelman (BFA 2018 Integrated Studio Arts), is on display Feb. 1 through March 31 in the Pioneer Room on the third floor of the ISU Memorial Union. For viewing times between 8 a.m. – 8 p.m., call (515) 294-6848. A public reception will be from 6-8 p.m. Tuesday, Feb. 5, in conjunction with the exhibition Nuances of Freedom by Melynda Van Zee in the MU Gallery. Working in both painting and printmaking, Henkelman continually interprets the seemingly simple shape of a box. The artwork is anything but simple, from the physical printmaking processes and the layers of color to the combination of shapes and illusions of space. The show’s title, VI, references the number of sides in a box, a starting point for his art that reveals much more in the finished pieces. Michael Krause (BArch 2012 Architecture) recently won the International Rio Reimagined 2018 Ideas Competition hosted by the American Institute of Architects Phoenix Metro Chapter, Urban Land Institute Arizona and Arizona Forward. The winning proposal, ECO2, seeks to provide a resilient vision for future development along a 58-mile segment of the Rio Salado. As contemporary cities and deserts grow, a common issue around the region is how to repurpose underutilized land/resources for urban development. Located at the 19th Avenue Superfund landfill site, ECO2 combines state-of-the-art sustainable technologies with landscape principles for the in-situ removal of soil contaminants to mend the Rio Salado into an economic backbone for the region. 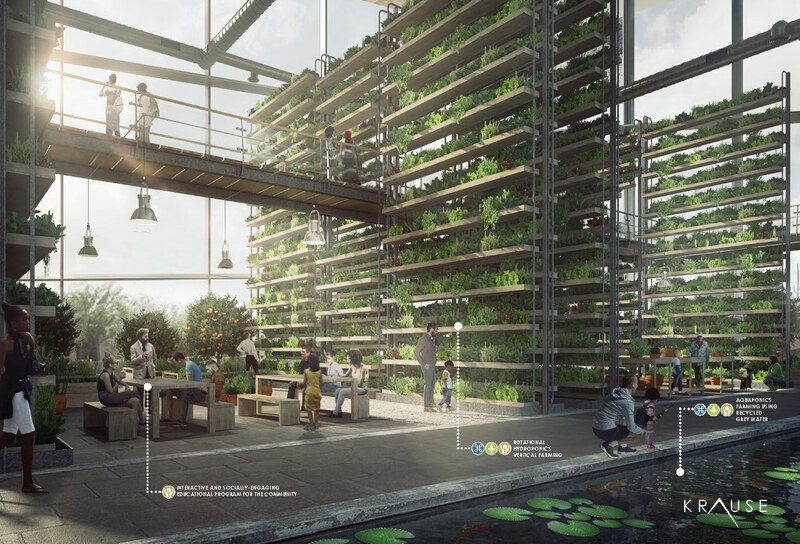 The proposal showcases how urbanity and agriculture can be interwoven to enhance the relationship between people and the land while showing solutions for a life beyond oil. 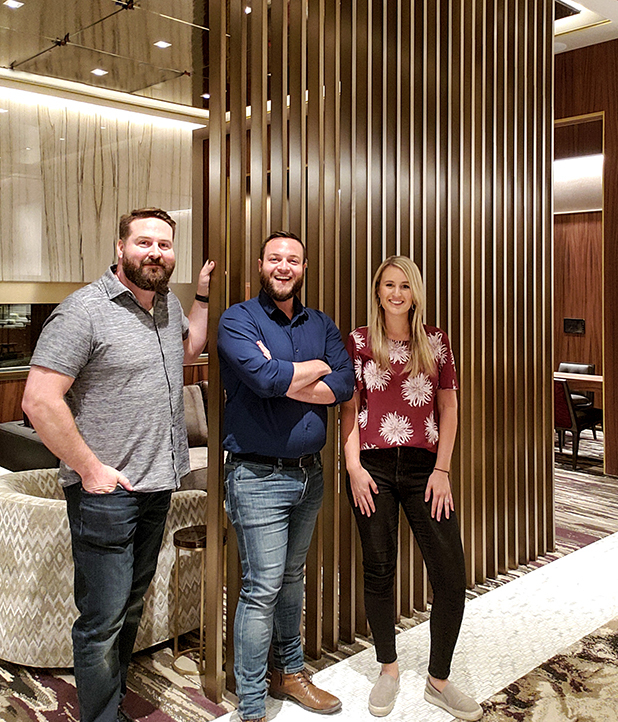 Jake Groth (BArch 2013 Architecture / Environmental Studies) and Dallas architecture firm 5G Studio Collaborative completed construction on the Resort Club Lounge, an interior architecture project within MGM’s ARIA Resort and Casino in Las Vegas. Described by the client MGM as the ‘Hotel’s Living Room’. It is a place for VIP guests to gather at a table or couch and visit with the Aria Concierge. Located right off the casino floor and next to the Aria Café, the venue’s visibility is centralized. As the project manager, Groth assisted with the design while executing the intent from conception to completion. 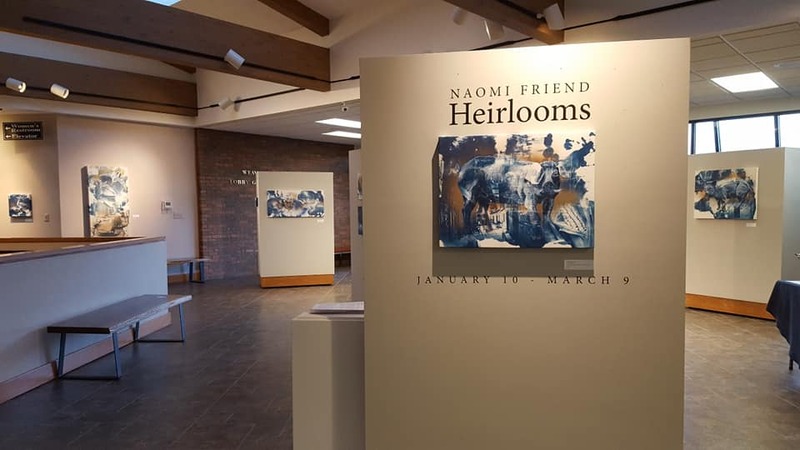 Heirlooms, a solo exhibition of work by Ames artist Naomi Friend (MFA 2013 Integrated Visual Arts), is on display Jan. 10 through March 9 in the Weaver Landing Gallery and McIlrath Landing Gallery at the Pearson Lakes Art Center in Okoboji, Iowa. “Smoke 1” (graphite, salvaged law enforcement paper targets shot through, housed in artist-made painted plywood enclosure; 2015) by Mitchell Squire, (BArch 1994 / MArch 2001 Architecture), an Iowa State University professor of architecture, is part of the Growing the Collection: Drawings and Collage, 1960 to Now exhibition on display Dec. 22, 2018, through Sept. 1, 2019, in Gallery 315 and 316 at the Minneapolis Institute of Art. “Fluid Urbanism: How Information Steered Architecture Might Reshape the Dynamics of Civic Dwelling,” an article by Sharon Wohl, an Iowa State University assistant professor of architecture and urban design, and Reny Revariah (MUD 2018 Urban Design), has been published by The Plan Journal, Vol. 3, Issue 2. The article highlights a project Revariah completed in an urban design studio co-taught by Wohl and Mira Engler, ISU professor of landscape architecture and urban design. The project examined the ways in which information technologies can change how we dwell in cities, and was framed in relation to complex adaptive systems thinking, Wohl’s research area. 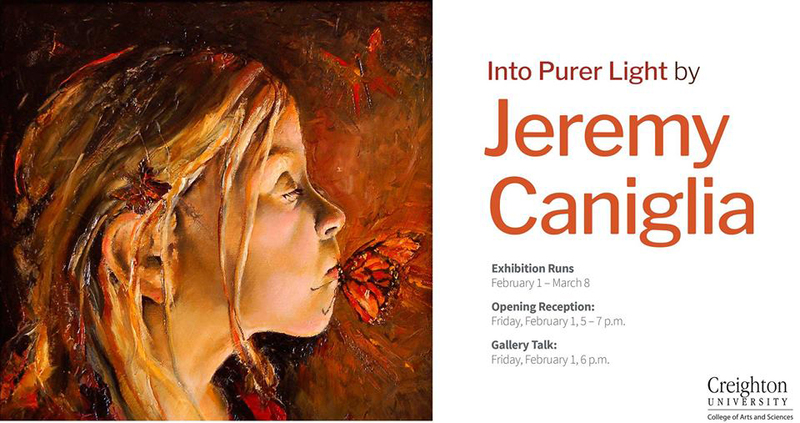 Into Purer Light, a solo exhibition by Jeremy Caniglia (BFA 1993 Art & Design – Drawing, Painting, Printmaking), will be on display Feb. 1 through March 8 in the Creighton University Lied Art Gallery. 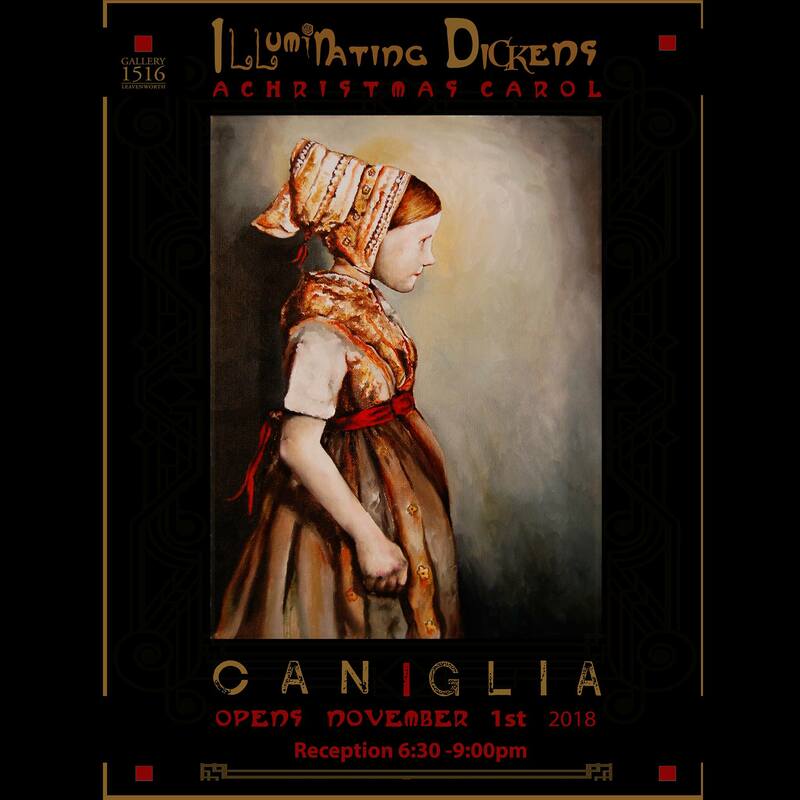 The show will feature all new paintings and drawings from Caniglia’s latest series of narratives as well as work created during his time with Odd Nerdrum at the Nerdrum Studio in Norway last year. An opening reception will begin at 5 p.m. Friday, Feb. 1, with a gallery talk by Caniglia at 6 p.m.
Photographs by Paula Streeter (BFA 1997 Art & Design / MA 2000 Art & Design / MFA 2011 Integrated Visual Arts), an Iowa State University senior lecturer in art and visual culture, are featured in New Letters Magazine, Vol. 85, No. 1. Streeter took the photos during a residency at the Scuola Internazionale de Graphica in Venice, Italy, in 2016. Pairings, a collaborative exhibition by Peter Goché (BArch 1991 / MArch 2005 Architecture), an Iowa State University assistant professor of architecture, and Mitchell Squire (BArch 1994 / MArch 2001 Architecture), ISU professor of architecture, with ISU architecture students Colleen De Matta, Christopher Perez, Sirina Reed, Zheng Yang, Zihan Yu, Hancheng Zhang and Wentao Zhong, will be on display from 6 to 10 p.m. Friday, Jan. 4, at Maple St. Construct, 5912 Maple St., Omaha, Nebraska. The show features work by both faculty members each paired with a selected student project from their fall 2018 design studios. 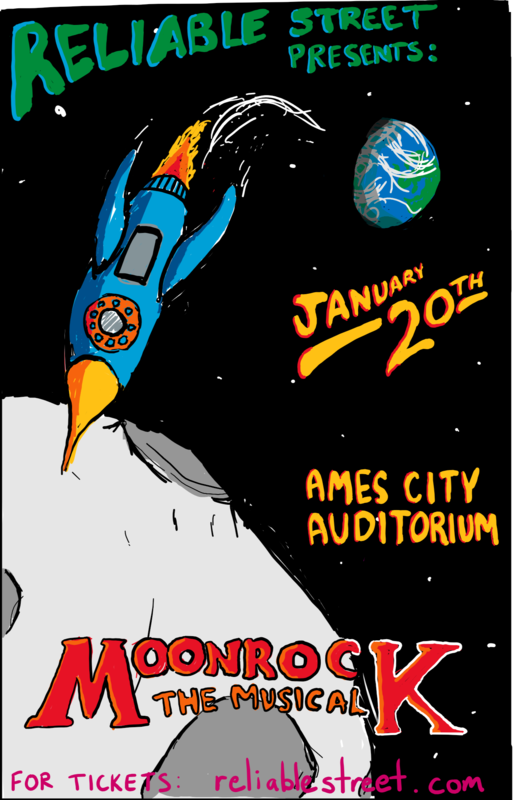 Ames artists Lyndsay Nissen (MFA 2015 Integrated Visual Arts) and Sascha Antropov, an Iowa State University senior in mechanical engineering, have written and produced Moonrock: The Musical, which will be presented at 5 p.m. Sunday, Jan. 20, 2019 — timed to coincide with the total lunar eclipse — at the Ames City Auditorium, 520 6th St. A group of people wake up from a collective dream and are inspired to travel to the moon. Guided by the once-legendary Captain Rocket, the crew journeys through space, unaware of the evil that lurks among them. Tickets are $20, general admission, and available through Reliable Street, Alluvial Brewing Company and Ames Vinyl Grind. 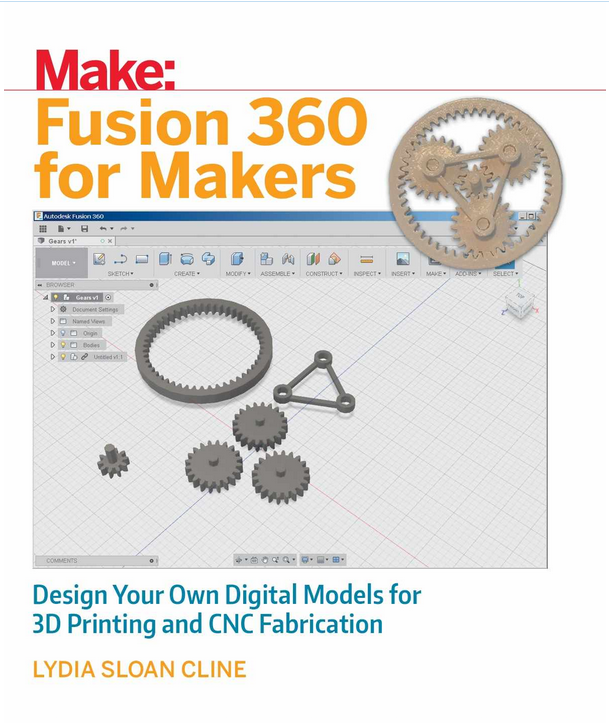 Fusion 360 for Makers, the latest title by Lydia Cline (BA 1982 Architecture), has been published by Maker Media. This is her eighth title. Some titles have gone into multiple editions and have been translated into different languages. 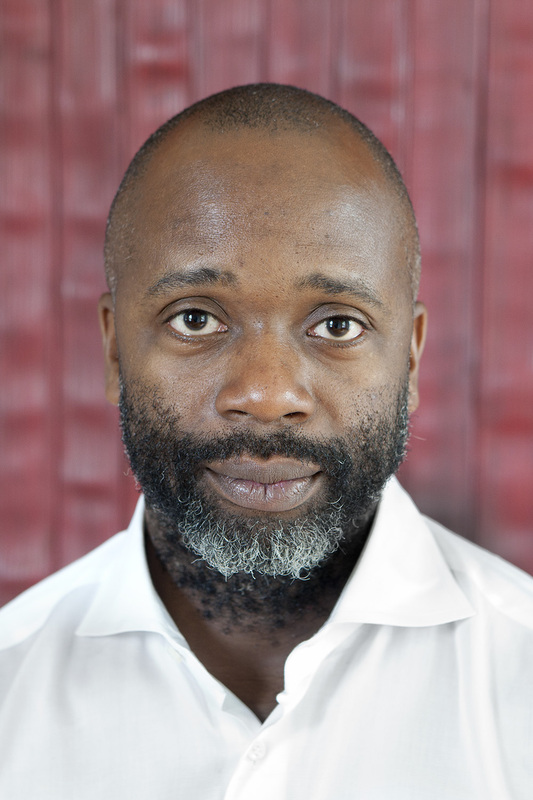 Theaster Gates (BS 1996 Community & Regional Planning / MA 2005 Interdisciplinary Graduate Studies) will receive an honorary Doctor of Humane Letters and present the Iowa State University undergraduate commencement address Saturday, Dec. 15, at Hilton Coliseum. The ceremony will begin at 1:30 p.m.; it is open to the public and will be livestreamed online. Gates is a world-renowned artist and innovator in urban revitalization and planning who has been recognized with the 2018 Nasher Prize for Sculpture, 2017 Legion d’Honneur, 2016 Kennedy Center Award for the Human Spirit and induction into the American Academy of Arts and Sciences in 2016, among many other honors. 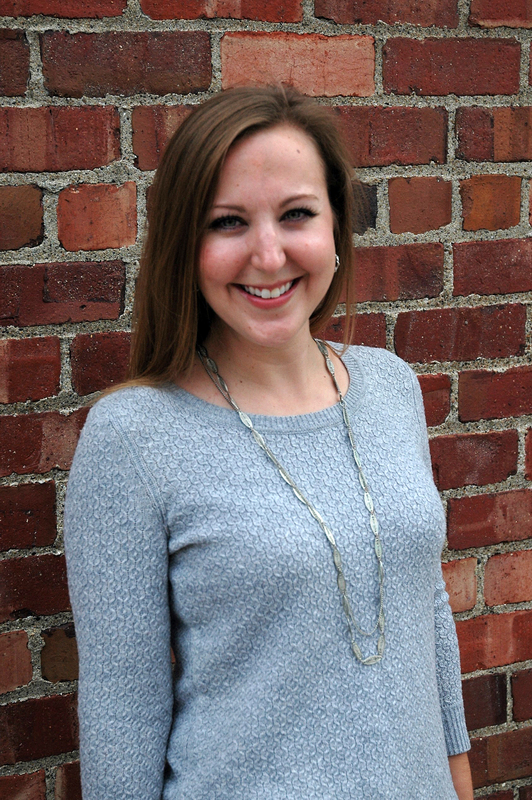 Adrienne Nelson, AIA, LEED GA (BFA 2009 Interior Design / MArch 2013 Architecture), was promoted to associate at Pickard Chilton in New Haven, Connecticut. 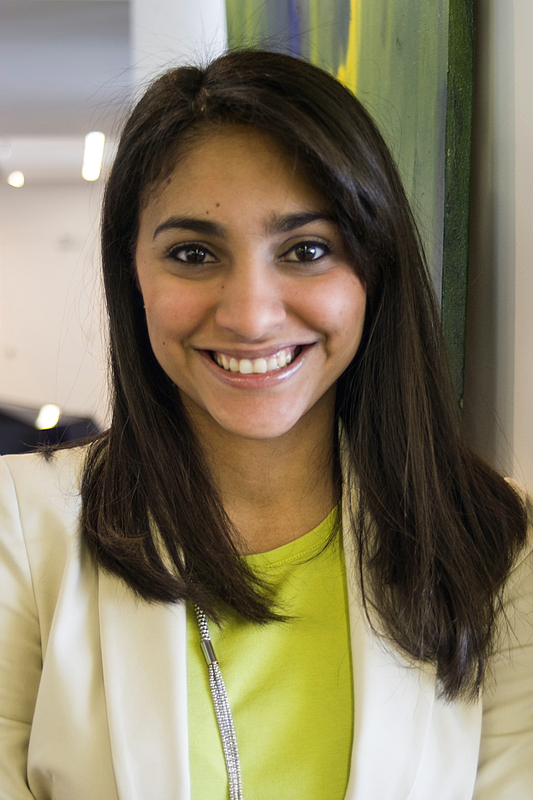 She currently serves as project manager for 325 Main Street, a corporate office tower in Cambridge, Massachusetts. Previously, she was a key contributor to 2+U, an office tower and public plaza in Seattle, Washington. 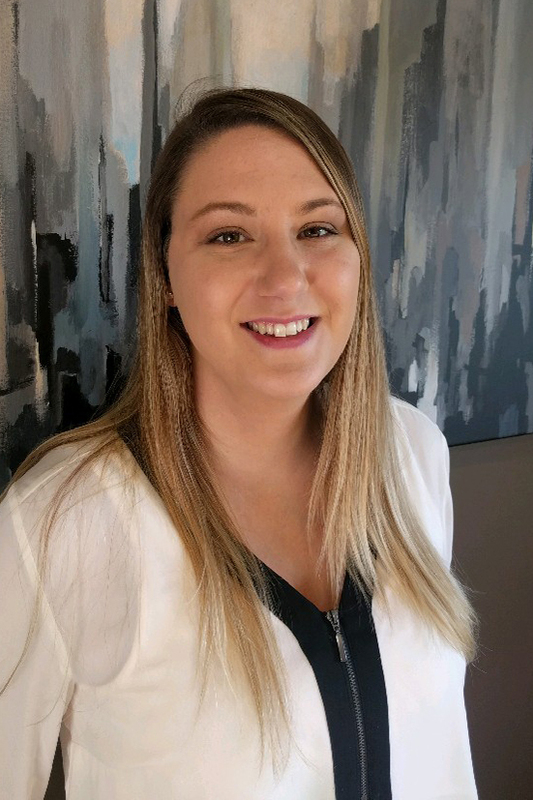 She was recently an AIA Connecticut board member and is the co-chair of the AIA Connecticut Emerging Professionals. Nelson is also a board member for the New Haven chapter of the ACE Mentor Program. 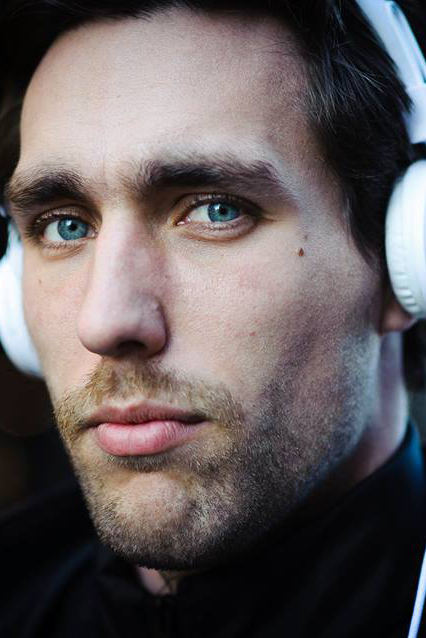 As a senior industrial designer with John Deere Dubuque Works, Troy Maddox (BID 2014 Industrial Design) is able to exercise his creativity and love of drawing to design beautiful, functional construction equipment that meets customers’ needs. 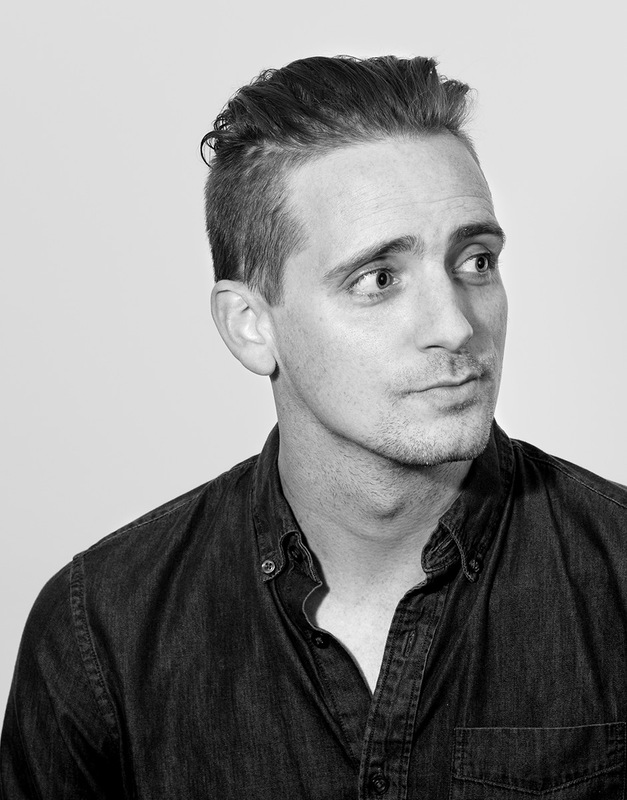 He is one of only a handful of industrial designers employed by John Deere worldwide. Read more and see video in the John Deere Journal online. The Art of Caleb Henkelman, an exhibition by Caleb Henkelman (BFA 2018 Integrated Studio Arts) focused on the repetition of form, will be on display Dec. 8-29 at Viaduct Gallery at the Des Moines Social Club. An opening reception with live music will be from 5 to 8 p.m. Saturday, Dec. 8. James Ian Killinger (BA 2008 Art & Design / Psychology) designed the Mesa sectional for Steelcase’s new West Elm Work collection. He holds a master’s degree in industrial design from Pratt Institute. Tam Vo (BFA 2014 Graphic Design), a junior art director with B O N D in Los Angeles, received a Gold Award at the 2018 CLIO Awards. She won in the Theatrical Print Special Use One-Sheet category for the poster she designed for the movie Incredibles 2. 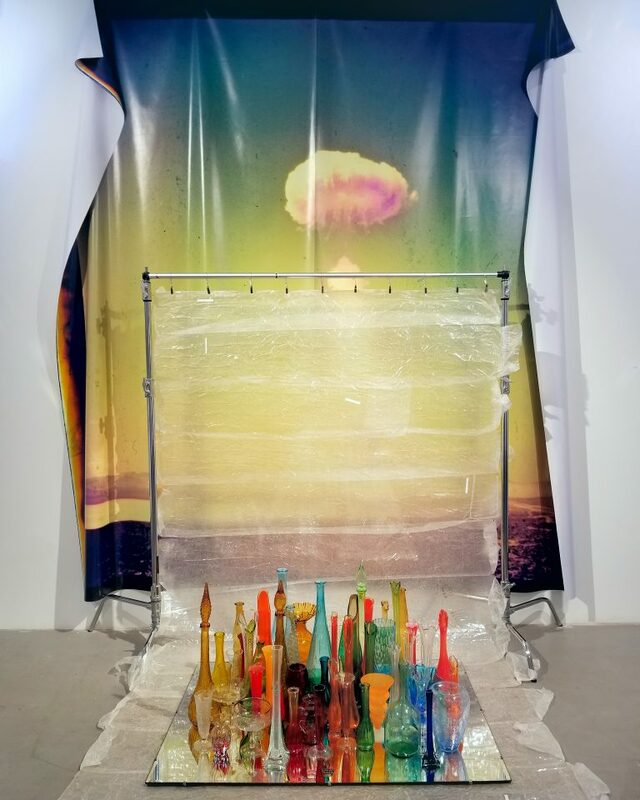 Robert Jinkins (MFA 2018 Integrated Visual Arts) has been awarded a $15,000 (Canadian) Elizabeth Greenshields Foundation Grant for emerging representational artists. 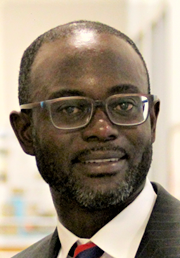 Nana Kusi Appiah (MCRP 2007 Community & Regional Planning), AICP, has joined the City of Mesa, Arizona, as its planning director. 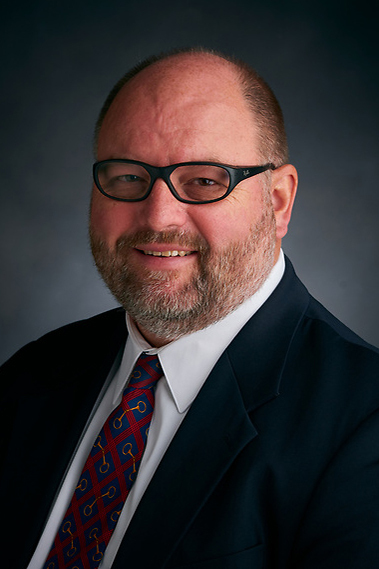 He previously served as the development services manager for Adams County, Colorado; city planner and planning supervisor for Denton, Texas; and staff planner in Polk County, Florida. Appiah has diverse educational and practical experience in community and regional planning, organization change management, program evaluation, public participation strategies, and strategic planning and management. He holds a bachelor’s degree from the University of Science and Technology, Kumasi, Ghana, a Master of Community and Regional Planning from Iowa State and a PhD in public affairs from the University of Texas at Dallas. He is a member of the American Institute of Certified Planners and has completed the Executive Education Program in Public Leadership at Harvard University’s Kennedy School of Government. 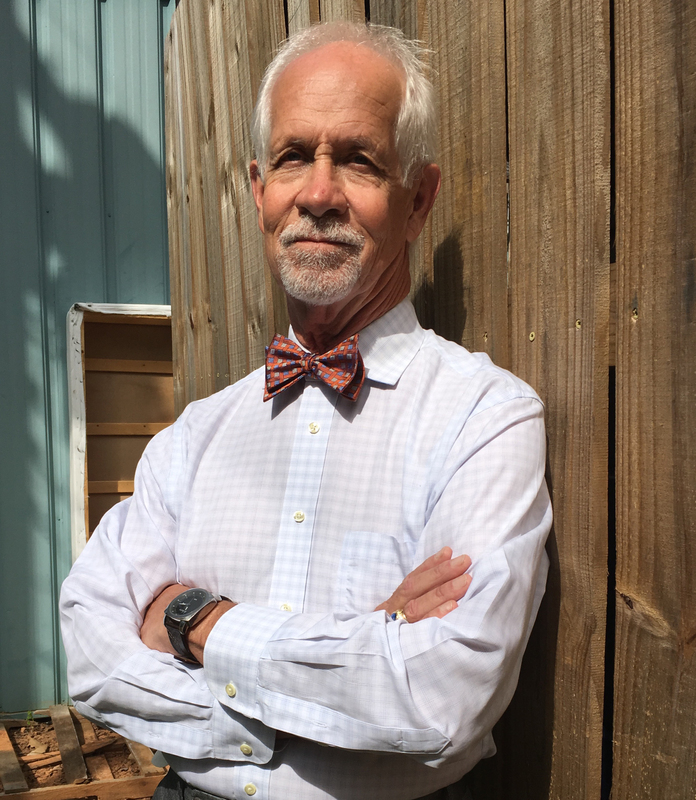 Robert Gunderson (1976 Landscape Architecture), president of SGA Group, Inc., has been elected to a two-year term (2018-2020) as secretary of the board of directors for the Council of Landscape Architectural Registration Boards (CLARB). 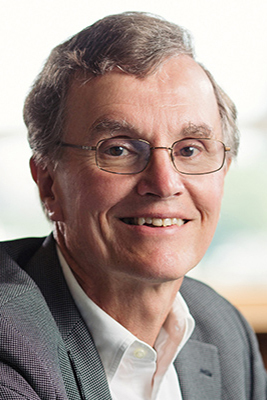 Gunderson previously served CLARB as a member of the Committee on Nominations (2015-2017) and as an invited speaker at the 2013 and 2016 CLARB Annual Meetings. 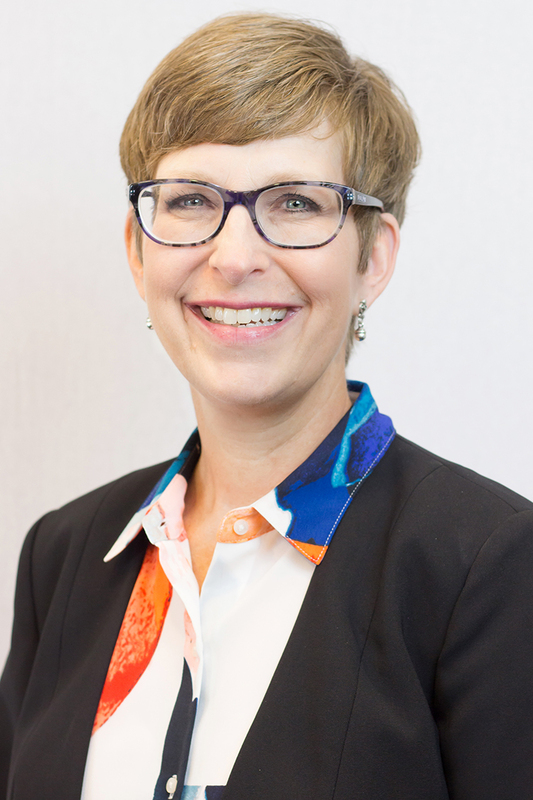 Additionally, Gunderson serves on the Minnesota Board of Architecture, Engineering, Land Surveying, Landscape Architecture, Geoscience and Interior Design. 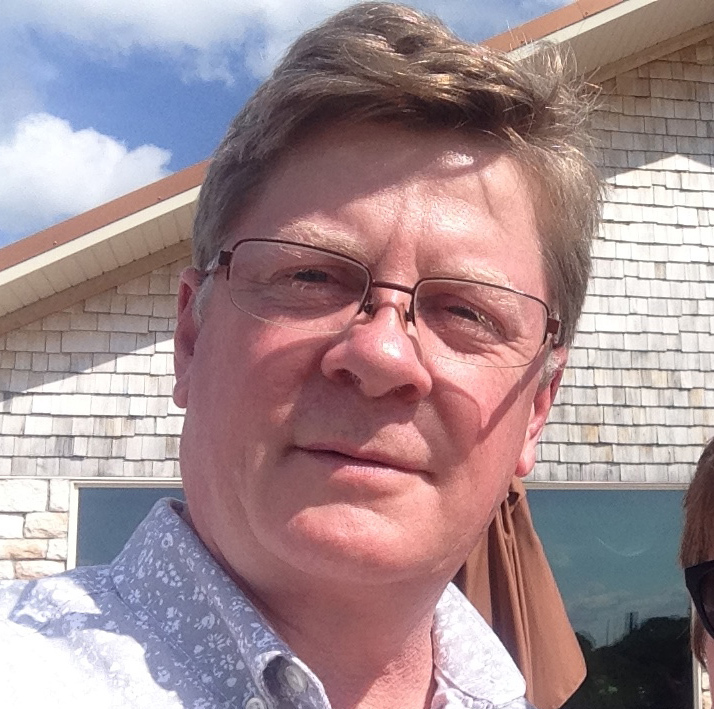 He is also a past president of the Minnesota chapter of the American Society of Landscape Architects (ASLA-MN). 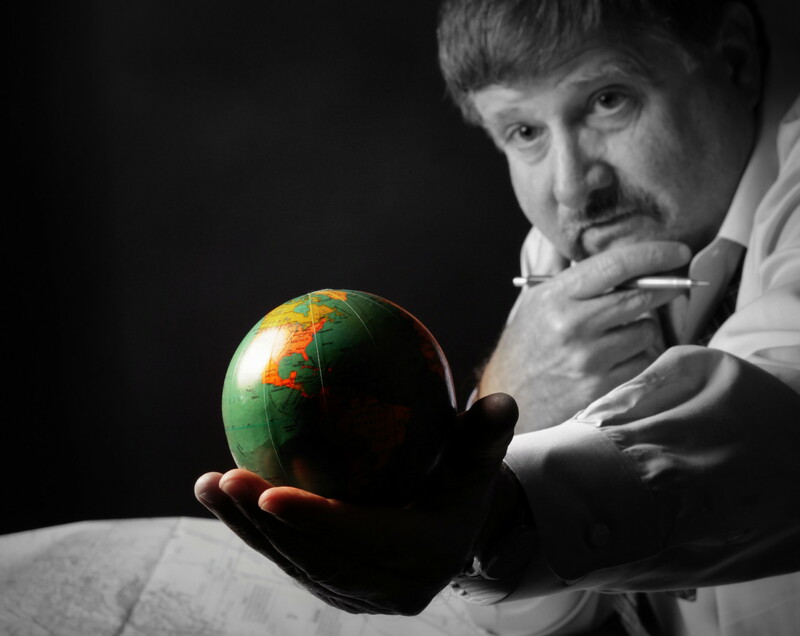 Since 1991, he has taught as an adjunct professor at the University of Minnesota. Gunderson is a retired Chief Warrant Officer 4 in the U.S. Army and was awarded the Bronze Star Medal, Meritorious Service Medal and the Combat Action Badge. He holds a Master of Landscape Architecture from the University of Pennsylvania and is a licensed landscape architect in Minnesota and South Dakota. Graham Hanson‘s (BFA 1989 Graphic Design) firm is the subject of a new 192-page monograph, 20/20 (Visual Profile Press), showcasing the 20-year legacy of Graham Hanson Design (now GHD Partners). The book, written by architect Roger Yee with introduction by design educator Jeff Bellantoni, illustrates 20 signature projects executed over the first 20 years of the firm, including work for Carnegie Hall, Google, American Express and Panasonic. The monograph is available at Amazon and other online book retailers. MADE for MADE, a ceramics exhibition by Jonathan Castro (BFA 2007 Integrated Studio Arts), will be on display at MADE Hotel in New York City for 10 weeks beginning Tuesday, Nov. 6. 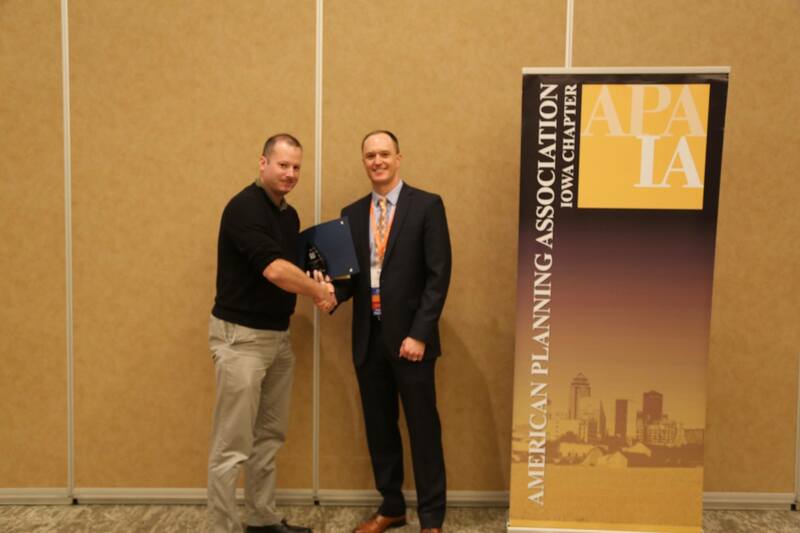 Joe Drahos (BS 2008 History / MCRP 2014 Community & Regional Planning / Certificate 2014 Geographic Information Systems), a transportation planner with the Iowa Department of Transportation, is a member of the team that received the 2018 Iowa Planning Best Practice Award from the Iowa chapter of the American Planning Association at the APA-IA Conference in Council Bluffs in October. The team was recognized for the IDOT Transit Stop ADA Compliance Application, which was developed to better focus limited resources on bus stops that could potentially prevent populations with disabilities from being able to access public transportation. 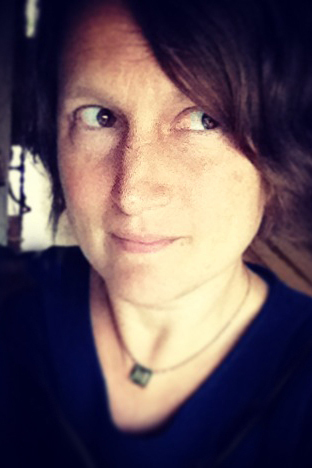 Cyndi Wiley (MFA 2012 Graphic Design / PhD 2014 Human Computer Interaction), currently an associate professor of art and design and department chair at Grand View University in Des Moines, will become the digital accessibility coordinator in information technology services at Iowa State University, effective Nov. 12. Three drawings by Jeremy Caniglia (BFA 1993 Art & Design – Drawing, Painting, Printmaking) are on display in the 28th Annual Holiday Miniatures Show Nov. 3-24 at ABEND Gallery in Denver, Colorado. This group exhibition features work from a wide range of printmakers, painters and draftsman from emerging to well-established, and spanning multiple genres. Joe Reddy (BFA 2017 Interior Design) has joined the HON Company as an integrated design solutions associate designer at the firm’s headquarters in Muscatine, Iowa. Illuminating Dickens: A Christmas Carol, a solo exhibition of the working drawings and final paintings by Jeremy Caniglia (BFA 1993 Art & Design – Drawing, Painting, Printmaking) for the Easton Press 2013 publication of Charles Dickens’ A Christmas Carol, will be on display Nov. 1 through Dec. 30, 2018, at Gallery 1516 in Omaha, Nebraska. An opening reception will be from 6:30 to 9 p.m. Thursday, Nov. 1. Caniglia will sign the limited edition books during the reception. 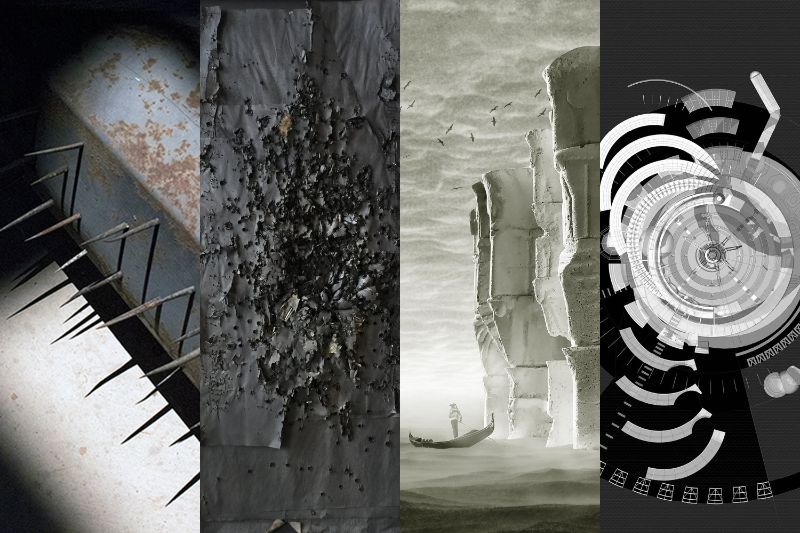 Valley of Ashes, an exhibition by Matthew Conradt (BFA 2005 Integrated Studio Arts) and Lizabeth Mitty curated by Suzanne Laura Kammin, will be on display Oct. 24 through Nov. 27 at Mueller Gallery at Caldwell University, Caldwell, New Jersey. David Cordaro (BArch 2017 Architecture) has accepted a new position as the Teen Fellows instructor at the Chicago Architecture Center. Todd Kennedy (BArch 1997 Architecture), principal with CCY Architects in Basalt, Colorado, received the AIA10 (Young Architect of the Year) award from the American Institute of Architects’ (AIA) Western Mountain Region, which includes Arizona, Colorado, Nevada, New Mexico, Utah and Wyoming. The AIA10 is open to architects who have been licensed for fewer than 10 years, recognizing individuals who have shown exceptional leadership in design, education, and/or service to the profession. Kennedy’s projects have garnered awards from the local and state chapters of the AIA and include community facilities, multi-family and custom residences, mixed-use developments, ranch compounds and boutique hotels. His projects have been published locally, regionally and nationally. Kennedy contributes to a variety of community nonprofits and serves on the board of directors for Aspen’s 10th Mountain Division Hut Association. La Vita in Italia, a solo exhibition by Jan Conradi (MA 1988 Graphic Design), is on display at Wanderlife Gallery in Philadelphia, Pennsylvania, through the month of October and also was displayed at the Pitman Gallery and Art Center in Pitman, New Jersey through the month of August. 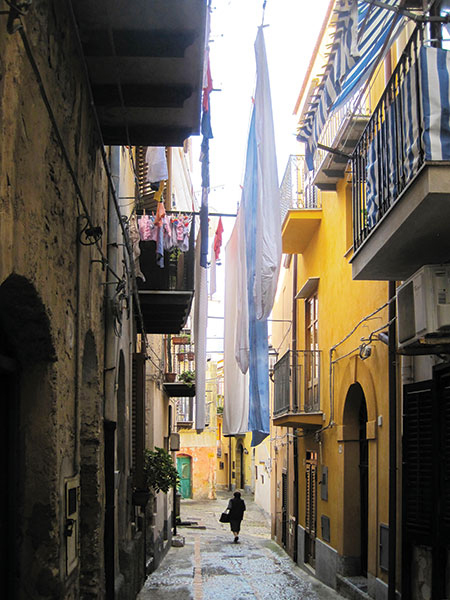 The exhibition features her photography of Italy in locations ranging from the Italian Alps to Campania and Sicily. On July 1, 2018, S. Norton Pease (BFA 1995 Art & Design) started a new position as associate dean of the College of Arts and Humanities as well as professor of art in the Betty Foy Sanders Department of Art, both at Georgia Southern University. For the past eight years, he had been chair of the College of Education, Arts & Sciences and Nursing as well as professor of art and graphic design at Montana State University-Northern. 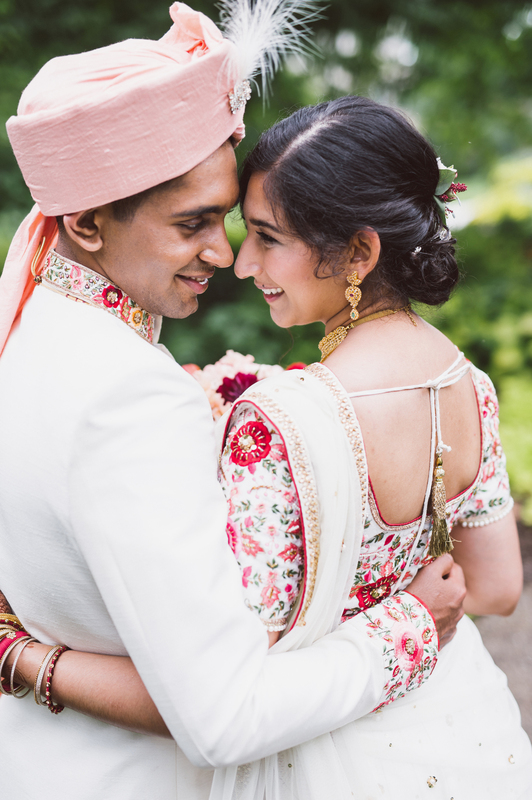 Akshali Gandhi (BS 2012 Community & Regional Planning) and Shubang Sridhar (BS 2014 Mechanical Engineering) were married Aug. 25, 2018, in Downers Grove, Illinois, and now reside in Pittsburgh, Pennsylvania. 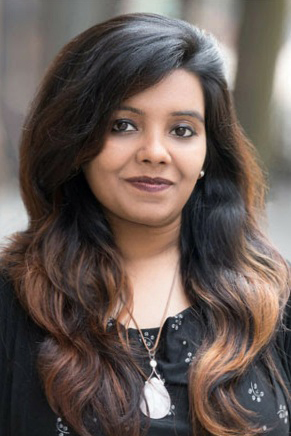 As of this month (October), Gandhi works as a transportation planner for Michael Baker International‘s Moon Township headquarters, where she hopes to launch sustainable mobility and urban design initiatives. 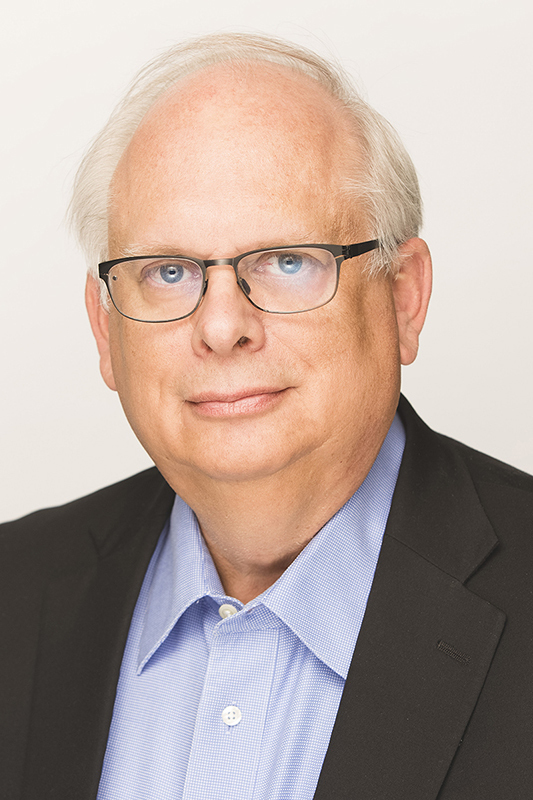 Kevin Monson (BArch 1973 Architecture), AIA, principal and board chairman of Neumann Monson Architects, received the 2018 American Institute of Architects (AIA) Iowa Medal of Honor, the highest honor an individual can receive from the AIA Iowa chapter, in recognition of distinguished service to the profession. Monson launched Neumann Monson with Roy Neumann in 1977. After taking on the role of president in 1993, he guided the firm from seven employees in one small office to 50 professionals anchored in Des Moines and Iowa City. 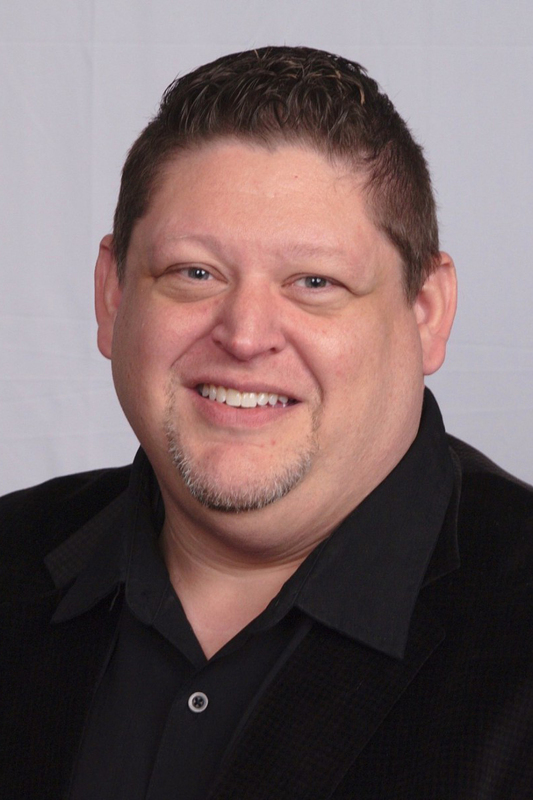 He has served on the AIA Iowa board of directors, Iowa Architectural Examining Board, the National Council of Architectural Registration Boards’ AIA Procedures and Documents Committee and ISU Department of Architecture Advisory Council. Nick Lindsley (BArch 2009 Architecture / Environmental Studies), AIA, an architect with Neumann Monson Architects, received the 2018 AIA Iowa Young Architect Award from the Iowa chapter of the American Institute of Architects at its annual fall convention in September. 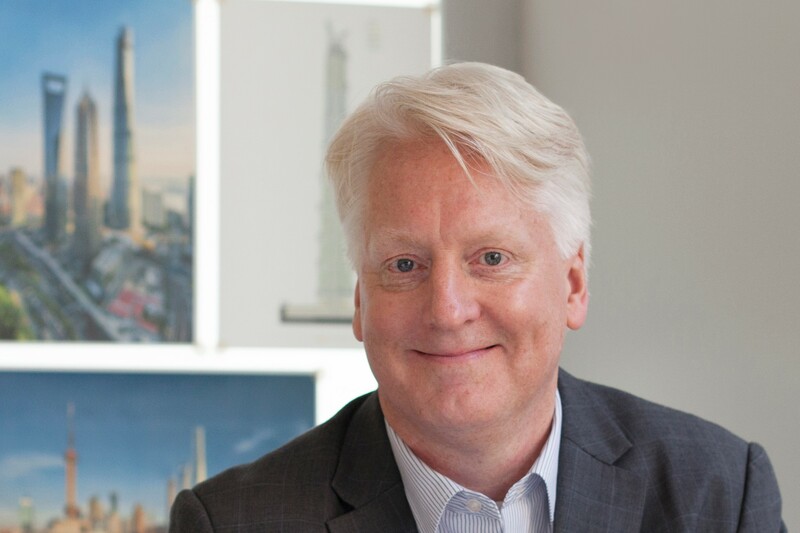 Lindsley is only the fourth recipient of the award, which is given to individuals who have shown exceptional leadership and made significant contributions to the profession in the areas of design, education and service in the early stage of their architectural career. Lindsley’s projects have been published locally and nationally in Archdaily, Architect Magazine, Architizer, Iowa Architect Magazine, Salon Today and Little Village Magazine. He has served in a multitude of volunteer positions at both the state and local levels, including as member of the AIA Iowa board of directors, Iowa Architect Magazine editorial board, AIA Iowa Fall Convention committee, Arts Iowa City board and Iowa City Downtown District board, and serving as president of AIA Iowa South East Iowa Architects. polYESter, an exhibition by Catherine Reinhart (BFA 2008 Integrated Studio Arts), gallery manager and artist-in-residence at the ISU Design on Main Gallery, is on display Sept. 14 through Nov. 12 in the Pioneer Room at the Iowa State Memorial Union. 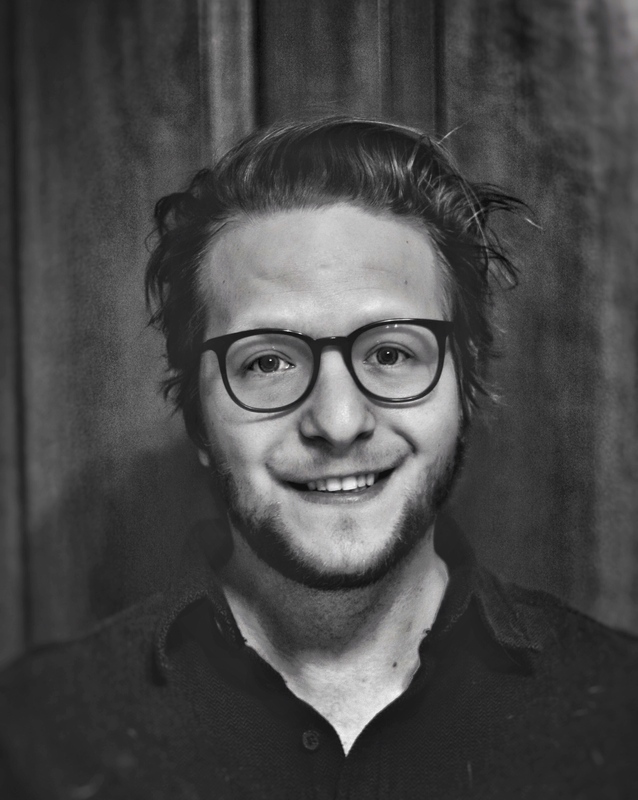 Sam Kirchner (BLA 2014 Landscape Architecture) has received his Master of Urban Design from the University of Michigan’s Taubman College of Architecture and Urban Planning and has joined Civitas in Denver, Colorado, as an urban designer and landscape designer. 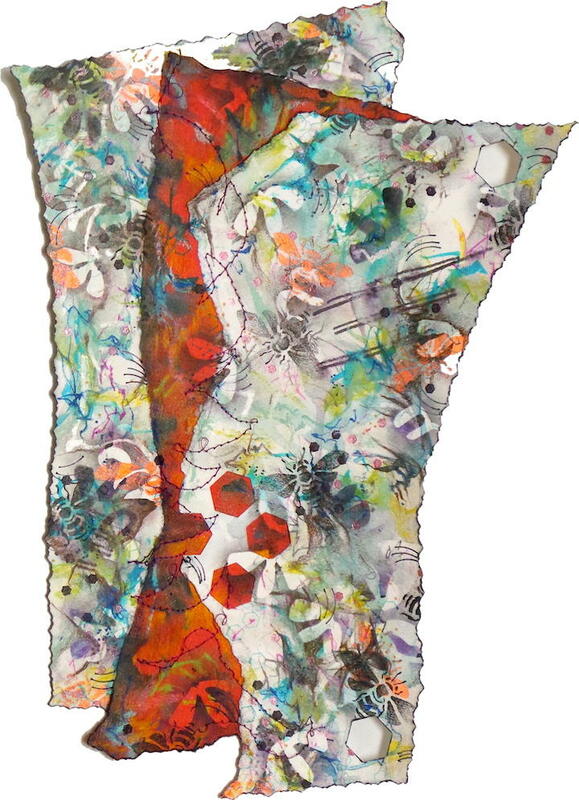 Evolution of an Artist, a solo show by Carolyn (Thompson) Abbott (BS 1967 Applied Art), is on display at The Crossings Arts Alliance Gallery in Brainerd, Minnesota, through the month of September. 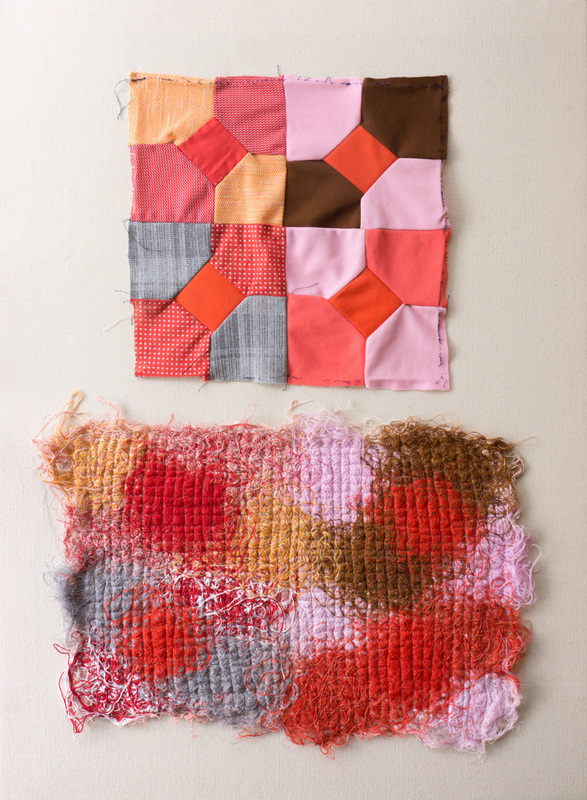 The exhibition features her fiber work from 1970s through her current surface design work. 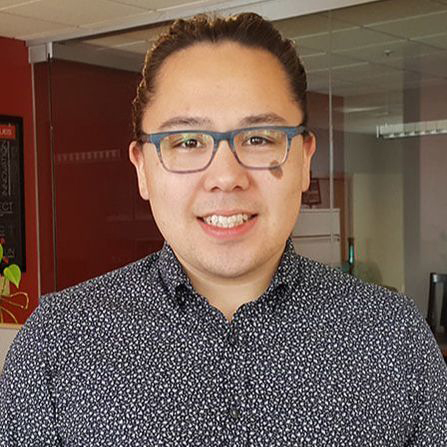 Joshua T. Kurnia (BArch 2017 Architecture) has joined Google’s Mountain View, California headquarters as a junior experience design lead/producer. Here Kurnia manages and produces Google Experience Centers all around the world. After graduation, Kurnia worked at Walt Disney Imagineering in Los Angeles producing and designing Disney theme parks all around the world. In January 2018, he moved to the entertainment design firm Thinkwell Group to produce and provide management for numerous theme parks and museums. In his new role at Google, Kurnia will use the Google Experience Centers to host and inspire high-profile Google clients, partners and stakeholders within highly interactive physical spaces infused with cutting-edge Google technologies and exhibits. TJ Hammersland (MArch 2018 Architecture) is now an architectural intern with BLDD Architects in Davenport. 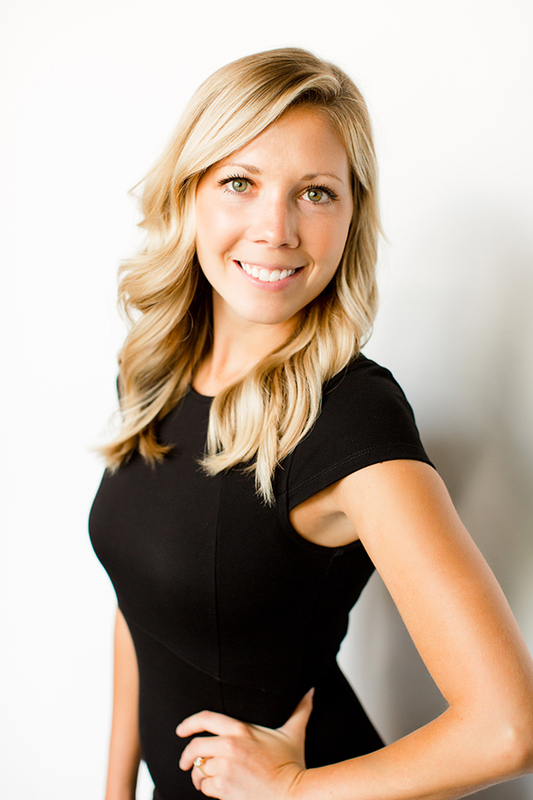 Jessie James (BFA 2007 / MFA 2009 Interior Design) has accepted a position as senior project manager with Stantec‘s Chicago office. She previously was a project manager with Whitney Architects. 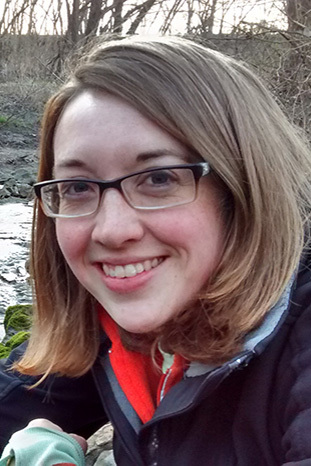 Bethany Wilcoxon (BS 2008 Community & Regional Planning / Certificate 2009 Geographic Information Systems) has been promoted to senior adviser at McClure Engineering Company after helping build the Creative Placemaking team over the last year. 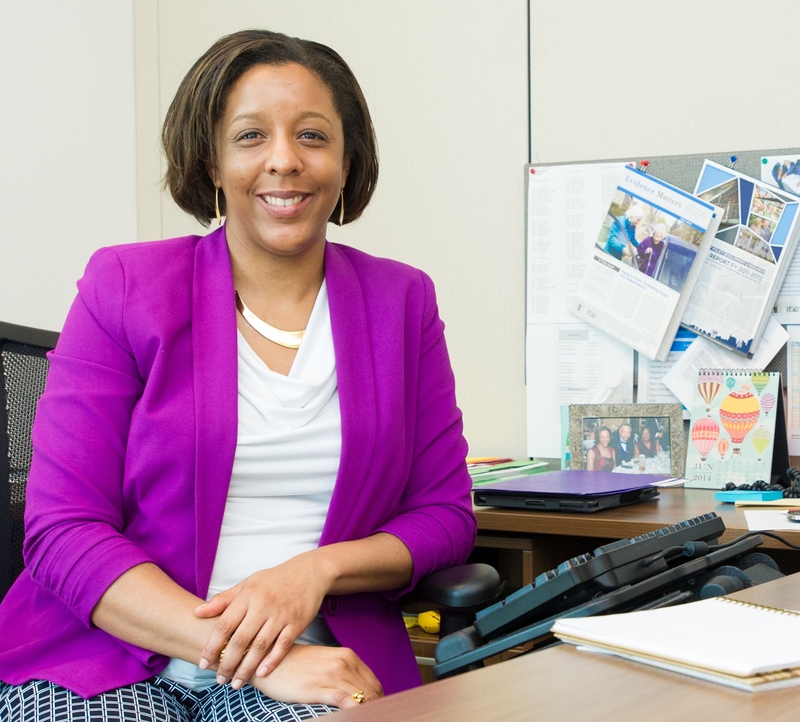 In her new role, she works alongside company’s CEO to developing broad planning work opportunities and corporate initiatives across all of McClure’s disciplines. She continues to lead the Imagine Iowa Great Lakes beautification initiative. Wilcoxon also was named to the Governor’s Empower Rural Iowa Initiative Growing Rural Iowa Task Force. The Glaze Series, a collaboration between Jonathan Castro (BFA 2007 Integrated Studio Arts) and Nest Studio, is featured in Architect magazine. Rahele Jomepour Bell (MFA 2015 Integrated Visual Arts) was awarded the grand prize in the 2018 Society of Children’s Book Writers and Illustrators 47th Annual Summer Conference Portfolio Showcase. She also received a 2018 SCBWI Social Media Mentorship Award for Illustrators, which identifies emerging author/illustrators with a debut book coming out in the next year and offers guidance on social media and building presence and brand. 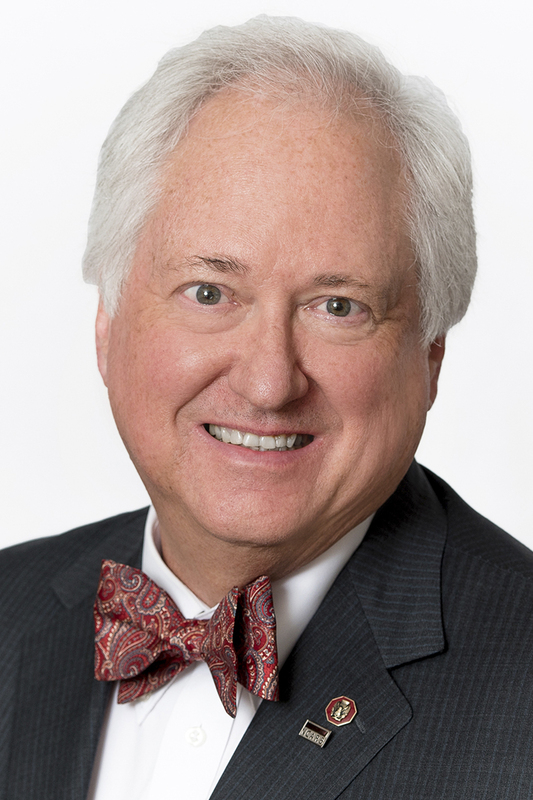 Terry L. Allers, AIA, NCARB (BArch 1970 Architecture), founder and president of Allers Associates Architects, PC, Fort Dodge, was elected as first vice president/president-elect of the National Council of Architectural Registration Boards at its 99th Annual Business Meeting in Detroit. 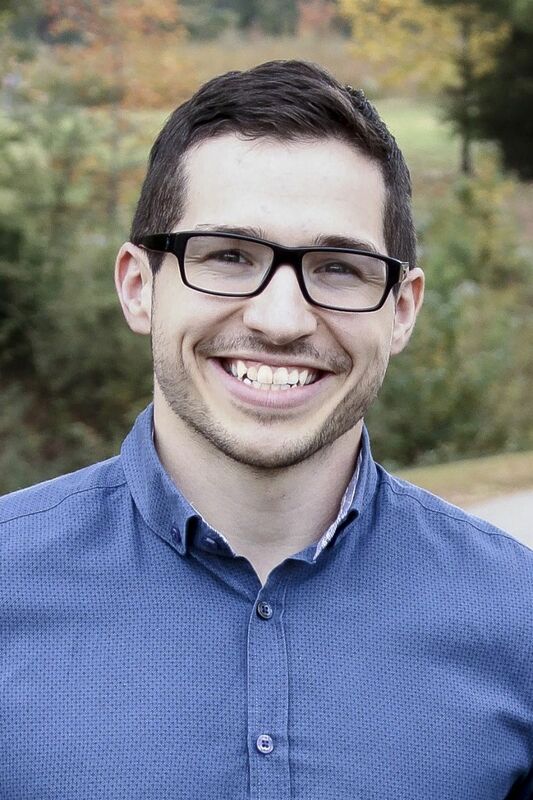 Paul Klippel (BFA 2011 Integrated Studio Arts) received a Master of Architecture from Kansas State University in May and is now an architectural intern with HTK Architects in Overland Park, Kansas. 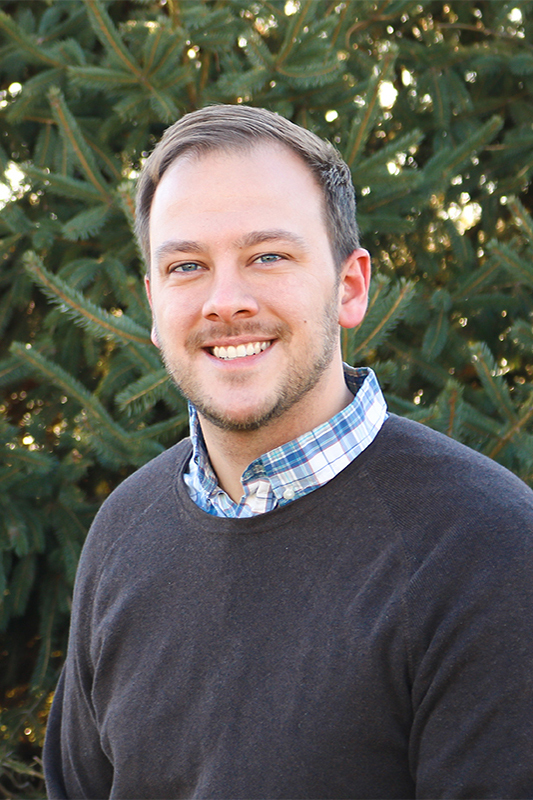 Jake Wilson (BLA 2013 Landscape Architecture) has joined Shive-Hattery in Des Moines as an environmental scientist. He had been an environmental planner with Snyder & Associates in Ankeny. 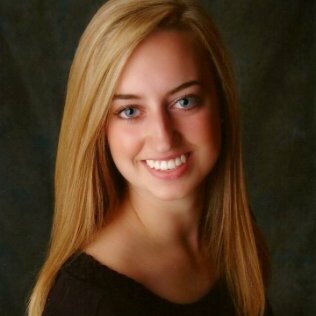 Christina Hamous (BID 2017 Industrial Design) has joined Bluestone Engineering in Johnston, Iowa, as a mechanical CAD technician. She had been an architectural designer intern with Todd & Sargent in Ames. 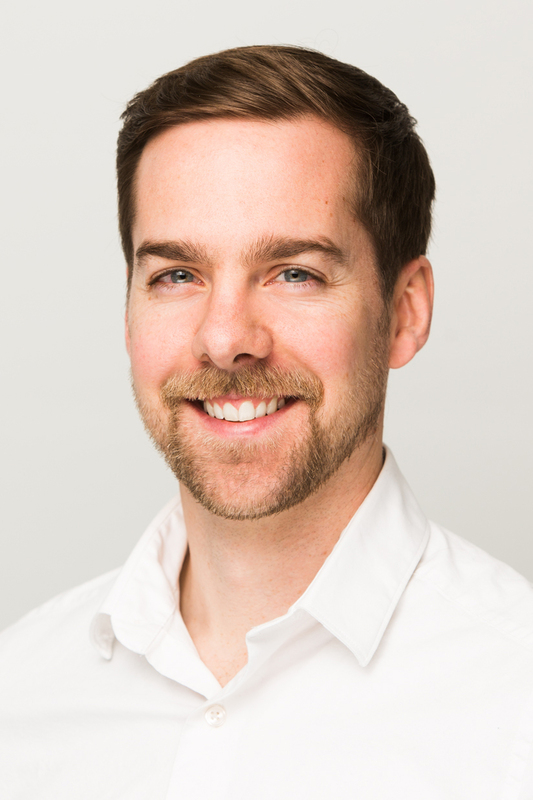 Dan Winger (BArch 2003 Architecture) is now the design manager for digital innovation with Lego Group. He had been the senior innovation designer since 2012. 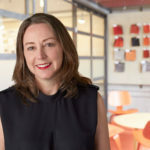 Judy Zimmerman (BA 1986 Interior Design), RID, LEED AP, has been appointed president of RVK (Rehler Vaughn & Koone) Architects in San Antonio, Texas. She is a member of NAWBO San Antonio and the University of the Incarnate Word interior design advisory board. 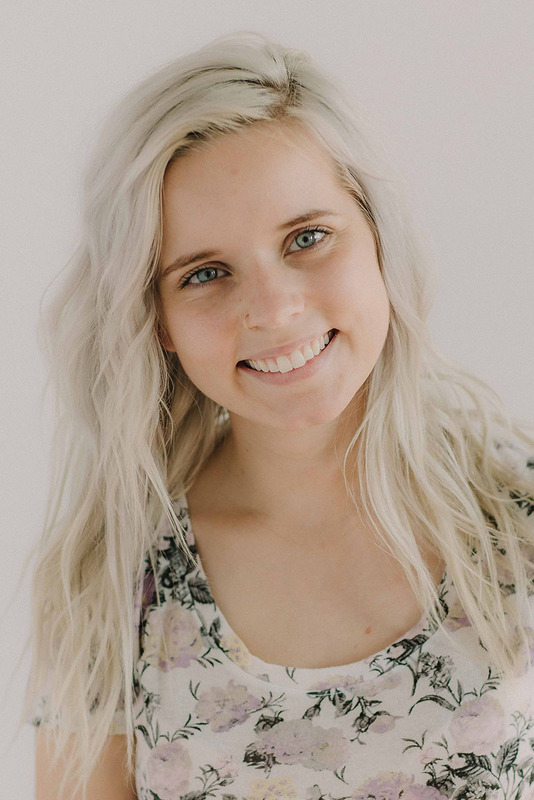 Kayla Meyer (BLA 2011 Landscape Architecture) has accepted a position as landscape architectural designer at studioINSITE’s recently established Omaha location. She will facilitate active engagement processes to develop and design community-focused landscape architectural solutions at various project scales. 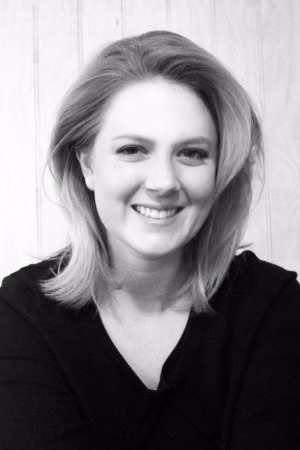 Jen Haywood (MFA 2014 Interior Design) is a recipient of the 2019 Builders’ Show Scholarship. 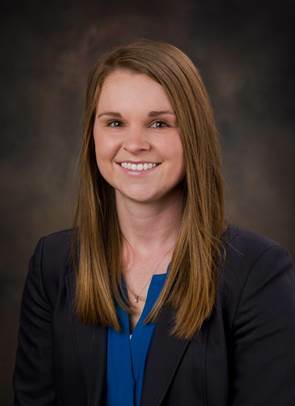 She was selected as a young professional within the building industry to attend the 2019 NAHB International Builders’ Show® (IBS) located in Las Vegas. Haywood is the founder of Texturious Designs, LLC. 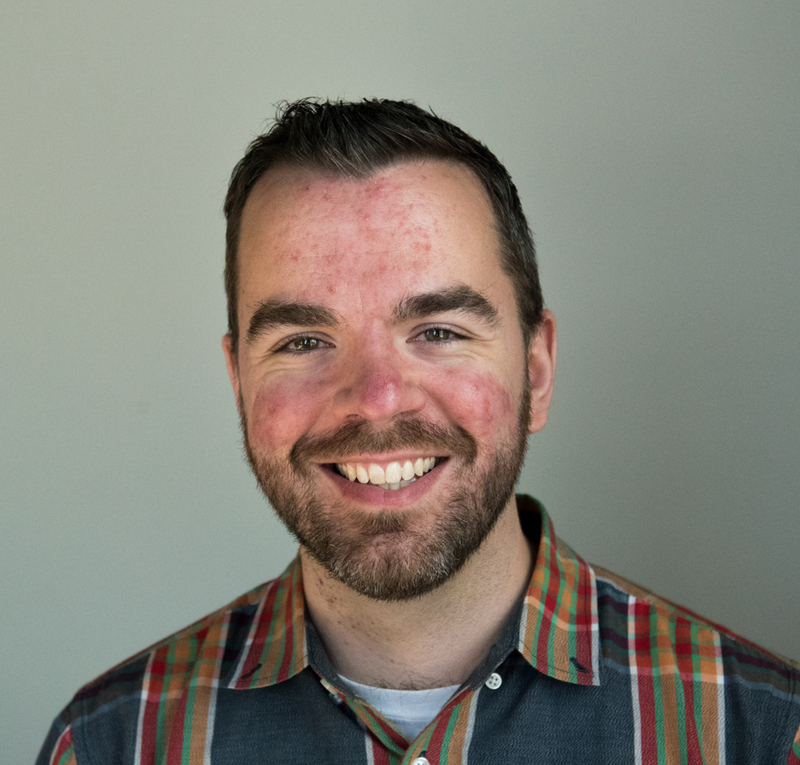 Stephen Sanda (BArch 2009 Architecture), AIA, recently joined Proving Ground as the director of implementation. Proving Ground is a digital design agency that provides strategy, project consulting and customization to support a data-driven building industry. Sanda and a colleague will present “Real World Uses of Machine Learning in Architectural Design” at the AIA Iowa Convention in September. 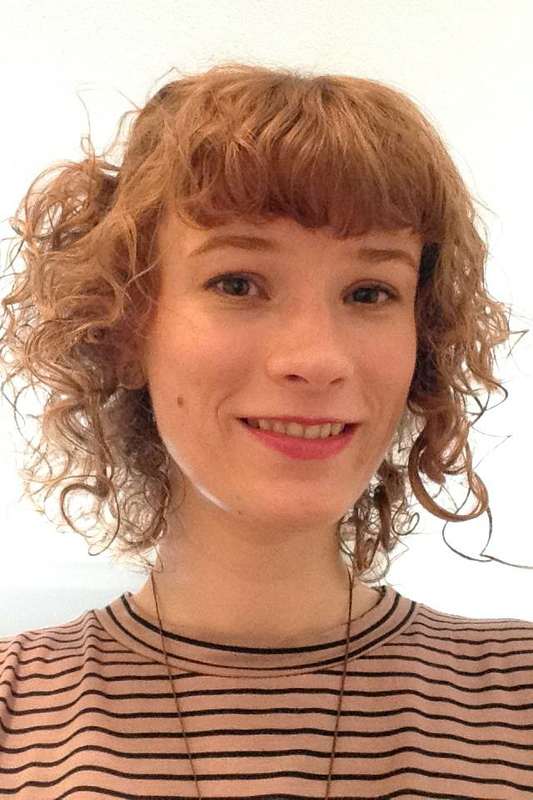 Alex Priest (BLA 2011 Landscape Architecture) has accepted the position of assistant curator at the Chicago Architecture Biennial focusing on public programs and the catalogue. The Chicago Architecture Biennial is the largest architecture and design exhibition in North America, dedicated to creating an international forum on architecture and urbanism through the production of exhibitions and public programs. Beautiful Test Sites/Now I Am Become Death, a joint exhibition of artwork by Mitchell Squire (BArch 1994 / MArch 2001 Architecture), Iowa State University professor of architecture, and Nora Wendl, associate professor of architecture at the University of New Mexico, is on display July 13 through Aug. 31 at the Sanitary Tortilla Factory in Albuquerque, New Mexico. Field Notes and Test Plots, an exhibition by Kimberly Baxter Packwood (BA 1999 Art & Design) is on display Aug. 1-31 at Sanford Museum & Planetarium, Cherokee, Iowa. Each piece was meticulously hand painted on fabric with earth pigments, ochres, clays (many sourced from Iowa fields and riverbanks), handmade charcoal, Conte and graphite, then stitched to capture the essence of farm fields and the sky as seen in central Iowa. Theaster Gates, Jr. (BS 1996 Community & Regional Planning / MA 2005 Interdisciplinary Graduate Studies), will explore the cult of the Black Madonna in an exhibition Sept. 6 through Oct. 18 at the Kunstmuseum Basel in Switzerland. In addition to an installation of artwork, Gates will also set up a temporary sound studio and printing workshop and launch joint projects with other local institutions. 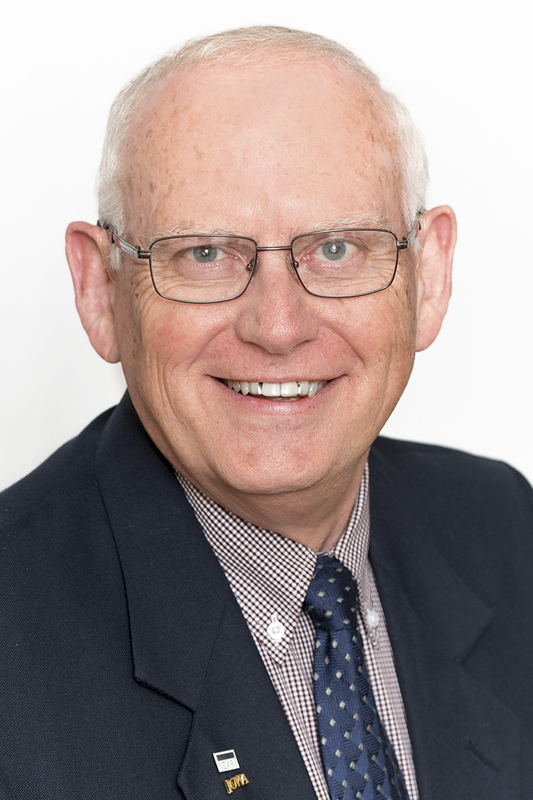 Geoffrey Grimes (BArch 1969 Architecture), a retired partner in StruXture Architects’ Waterloo office, recently completed his term on the Iowa State University Alumni Association’s board of directors. The board comprises 20 elected and four appointed voting members. As an elected director, Grimes was involved in a number of committees and initiatives, including the scholarship task force and alumni clubs advisory work group. He also chaired the board’s finance and Alumni Center oversight committees and served one term as vice chair of finance. Grimes has long been active as an ISU volunteer. He has chaired the Iowa State Alumni of Black Hawk County organization for more than a decade and has also been involved with the Department of Architecture Advisory Council. 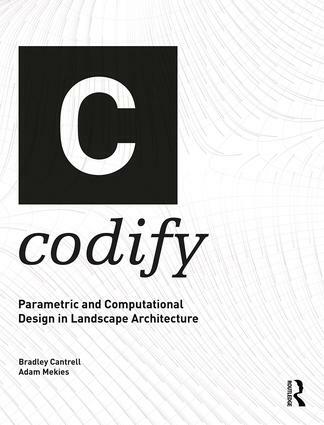 Codify: Parametric Computational Landscape Architecture, edited by Brad Contrell, chair of the University of Virginia School of Architecture, and Adam Mekies, PLA (BLA 2013 Landscape Architecture), landscape architect and planner with Design Workshop in Aspen, Colorado, has been published by Routledge Press. The book includes essays by Pete Evans (BArch 1995 Architecture / Certificate 2014 Human Computer Interaction / MID 2017 Industrial Design), Iowa State University senior lecturer in industrial design (“21st Century Learning”), and Chris Seeger (MLA 1997 Landscape Architecture), ISU professor of landscape architecture (“Open Source Mapping + App Development”). 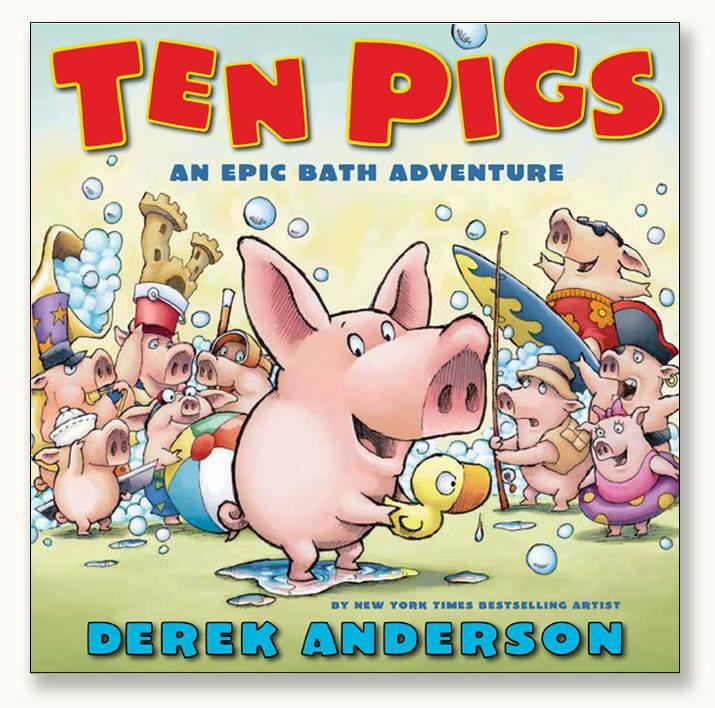 Ten Pigs: An Epic Bath Adventure, written and illustrated by Derek Anderson (BFA 1991 Art & Design – Drawing, Painting, Printmaking), has been named the Kansas Reads to Preschoolers title for 2018. This statewide reading initiative, which promotes reading to all Kansas children from birth through age 5, takes place each November. Lisa (Miller) Ailshie (BFA 1986 Graphic Design) was promoted to communications manager at Bethesda Lutheran Church in Ames. 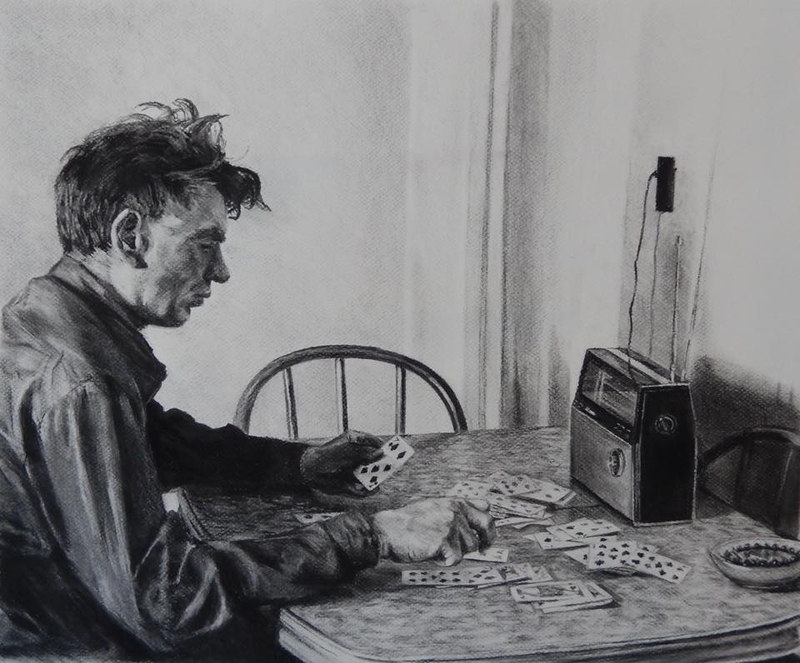 “Solitaire,” a charcoal portrait by Meghan Flynn (BFA 2011 Integrated Studio Arts), is one of 105 entries (of a total 922 submissions) accepted into Manifest Gallery‘s 13th International Drawing Annual (INDA 13) publication. 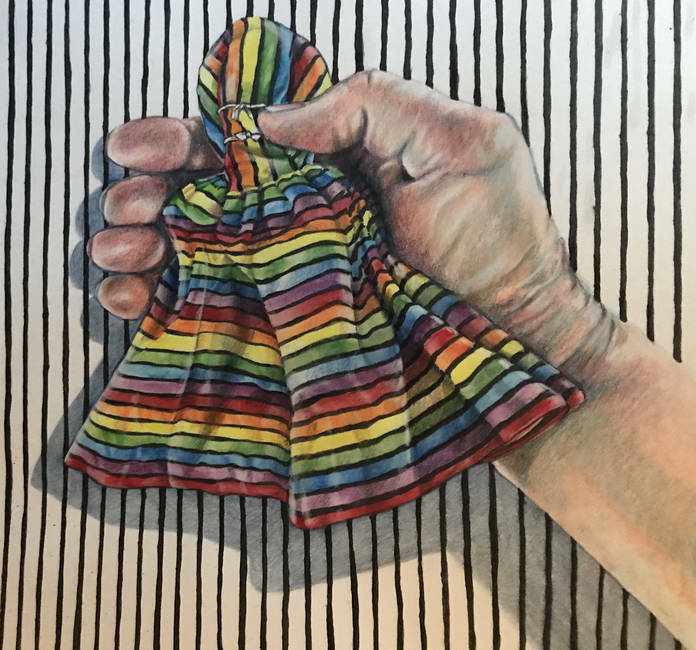 Empty Dresses, an exhibition of mixed-media artworks by Paula Streeter (BFA 1997 Art & Design / MA 2000 Art & Design / MFA 2011 Integrated Visual Arts), an Iowa State University lecturer in art and visual culture, will be on display July 5 through Aug. 11 at the Pearson Lakes Art Center in Okoboji, Iowa. Streeter will host two historic media workshops, one for youth (10 a.m. to noon) and one for adults (1 to 3 p.m.), on opening day, Thursday, July 5. While the workshops are free, participants are asked to call for a reservation at (712) 332-7013 so enough supplies are prepared. 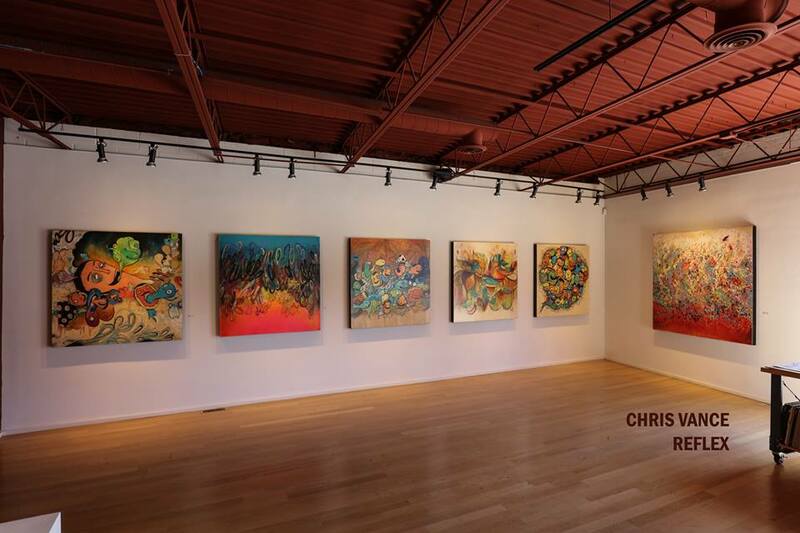 A public reception will be from 5 to 7 p.m. with an artist’s talk at 6 p.m.
Semi-abstract paintings by Tarran Sklenar (BFA 2013 Integrated Studio Arts) are on display July 5-28 at Linda Hodges Gallery in Seattle, Washington. Paintings by Jonathan Happ (BFA 2010 Integrated Studio Arts) are on display July 5-28 in the BLUR Gallery at Linda Hodges Gallery in Seattle, Washington. 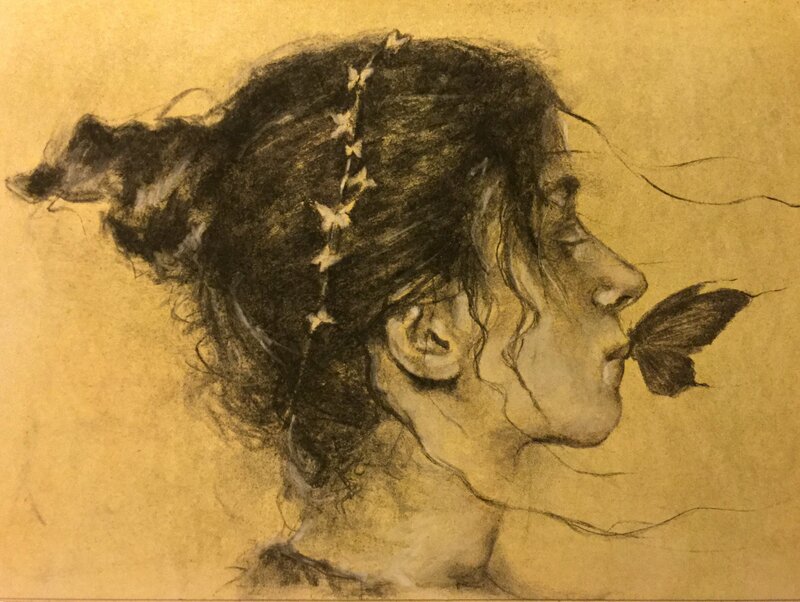 “Dreaming of Rembrandt,” a monotype by Jeremy Caniglia (BFA 1993 Art & Design – Drawing, Painting, Printmaking), received the N.C. Wyeth Merit Award from the Salgamundi Club — the highest honor the New York City fine arts center awards. Lisa (Nunamaker) Orgler (BLA 1992 / MLA 2000 Landscape Architecture), a senior lecturer in the Iowa State University Department of Horticulture, recently received two awards for her Paper Garden Workshop blog from the Association for Garden Communicators: GWA 2018 Media Awards Silver Medal for Writing on a Blog (Overall) and GWA 2018 Media Awards Silver Medal for Digital Media on a Blog (Overall Site). 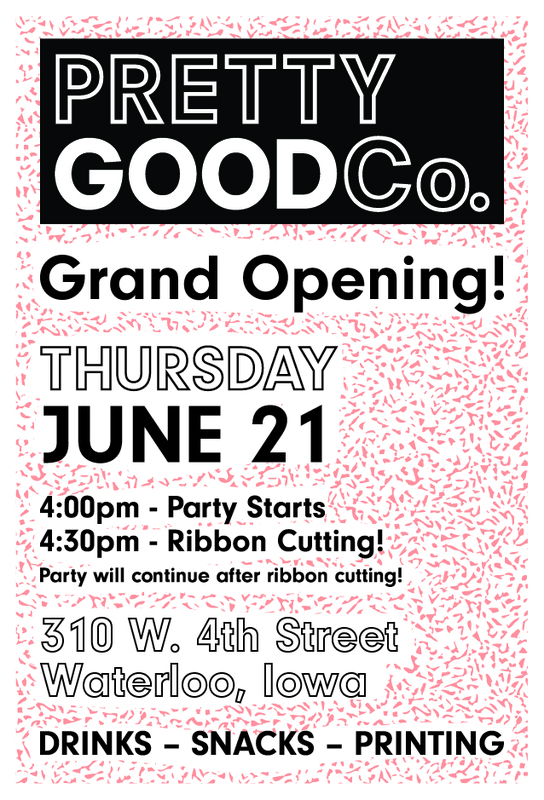 Brandon (BFA 2012 Graphic Design) and Annie (Walsh) Alvarado (BFA 2011 Graphic Design) have opened Pretty Good Co., a full-service graphic design studio and letterpress print shop in Waterloo, Iowa. In addition to their own work, the studio offers creative goods and retail from other local and small creative businesses. The store was featured in a June 10 article in the Waterloo Courier. They will host a grand-opening party at 4 p.m. Thursday, June 21, with a ribbon-cutting ceremony at 4:30 p.m. Enjoy drinks, snacks and live printing demos. The business is also on Facebook and Instagram. 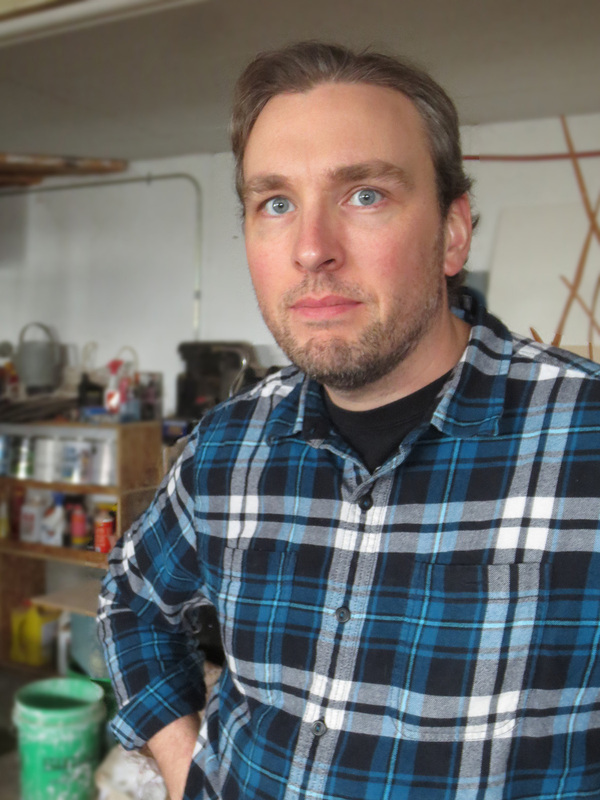 Robert Jinkins (MFA 2018 Integrated Visual Arts) is one of seven artists nationwide selected to participate in the 2018 Iowa Lakeside Laboratory Artist-in-Residence Program. 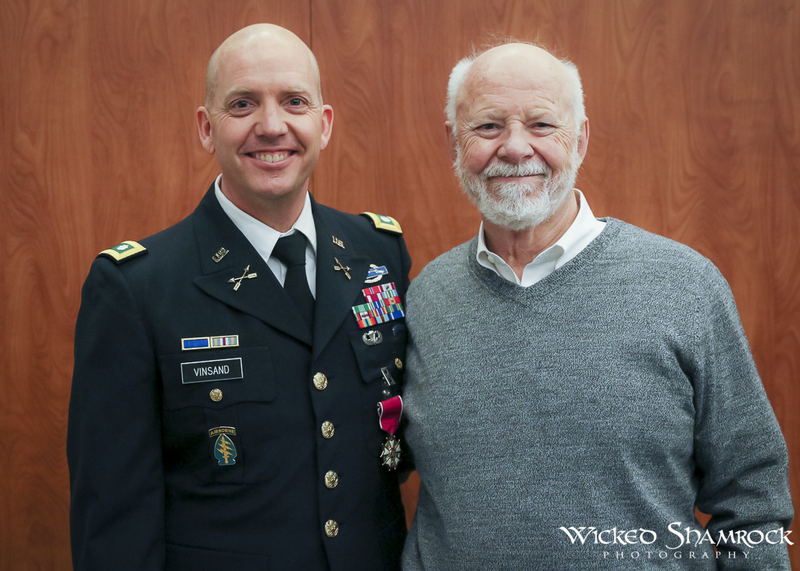 Daniel Vinsand (BArch 1994 Architecture), a Lieutenant Colonel in the United States Army, retired June 1. He had served in the Army for 24 years, primarily in Special Forces and later as an intelligence officer. During his service, Vinsand was stationed in locations across the US and in South Korea, England and Germany, where he currently resides. Over the coming year he plans to learn Revit and 3ds Max and explore other visual communication through digital tools. He and his wife intend to move to Pennsylvania next year, where Vinsand — who holds an MA in national security affairs from the Naval Postgraduate School, MS in strategic intelligence from the Naval Intelligence University and MBA from Embry Riddle Aeronautical University — is considering pursuit of another graduate degree in digital art, landscape architecture or restoration architecture. 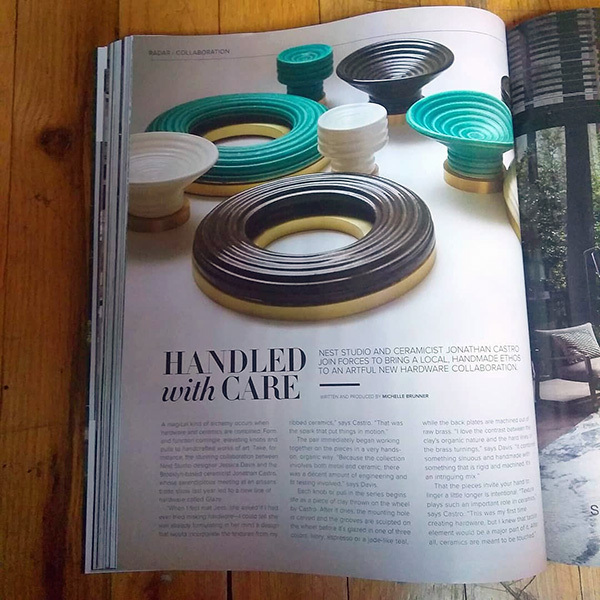 Jonathan Castro Designs‘ collaboration with Nest Studio Hardware is featured in the Summer 2018 issue of Aspire Design and Home. Jonathan Castro Designs is owned by Jonathan Castro (BFA 2007 Integrated Studio Arts). “Glow Garden,” installations by Heather Whittlesey (MFA 2015 Integrated Visual Arts), will be featured in Art Terrarium: After Hours at 6 p.m. Friday, June 15, at Art Terrarium, 106 11th St., Des Moines. 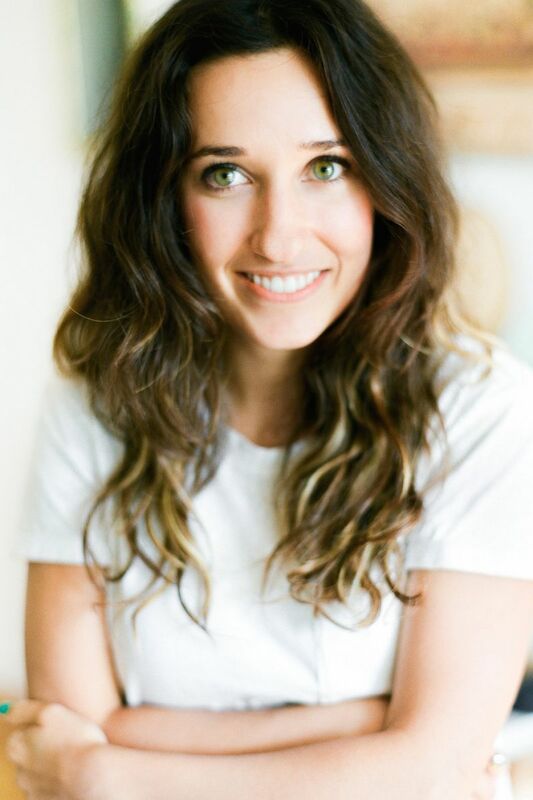 Chelsea Evers (BS 2012 Journalism & Mass Communication), who studied graphic design at Iowa State for three years, is the new editorial director for Studio DIY in Los Angeles. 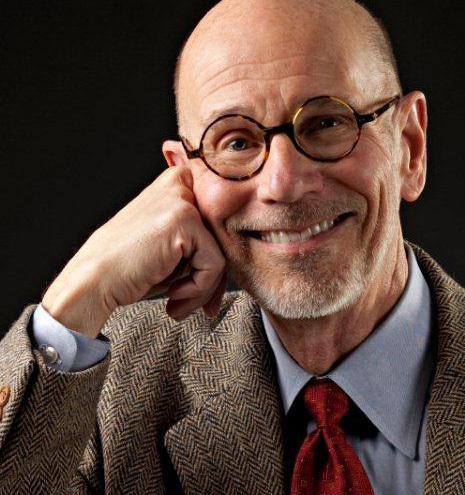 Arlan Kay (BArch 1966 Architecture), FAIA, founder of Architecture Network, Inc., which he recently sold to Kontext Architects (for which he continues as a consultant) in Sun Prairie, Wisconsin, has been elevated to fellowship in the American Institute of Architects. He will join all new fellows at the College of Fellows Investiture Ceremony during the AIA Conference on Architecture 2018 in New York City in June. Kay also recently won the Wisconsin Historical Society Board of Curators Award for “his preservation of countless buildings in Wisconsin.” The award, typically given for a specific project, was presented to Kay for his tremendous body of work, which includes more than 2,500 existing and historic buildings. 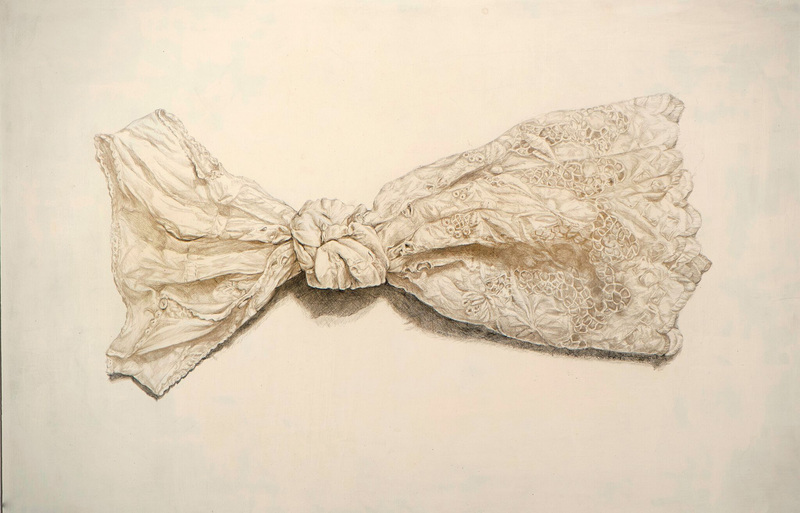 Empty Dresses, an exhibition of mixed-media artworks by Paula Streeter (BFA 1997 Art & Design / MA 2000 Art & Design / MFA 2011 Integrated Visual Arts), an Iowa State University lecturer in art and visual culture, will be on display May 25 through June 30 in the Community Gallery at the Octagon Center for the Arts in Ames. 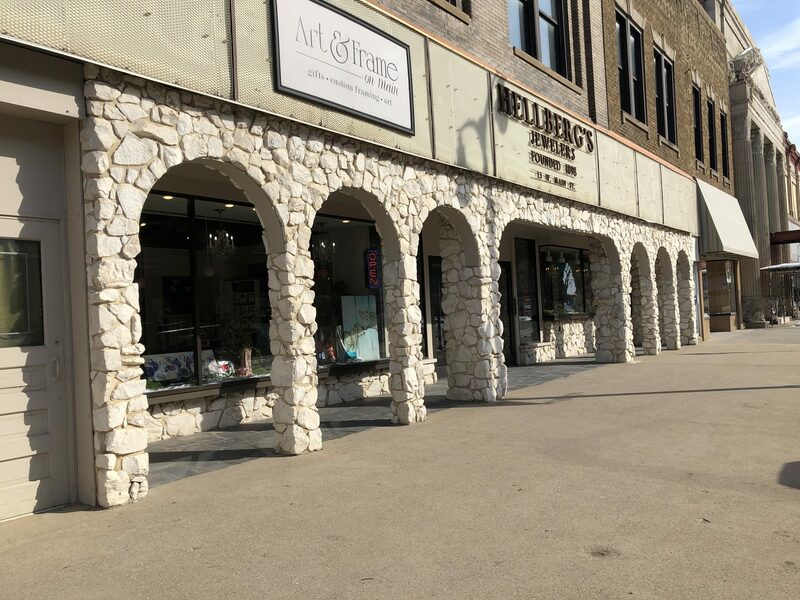 A reception will be held from 5 to 7 p.m. Friday, June 1, in conjunction with the Ames Main Street Cultural District’s ArtWalk, and Streeter will hold a historic media workshop on Saturday, June 2. Mitchell Hinrichsen (BFA 2011 Interior Design / MID 2014 Industrial Design) is now an industrial designer for Rawlings Sporting Goods in St. Louis. He previously was an industrial designer with fredsparks. 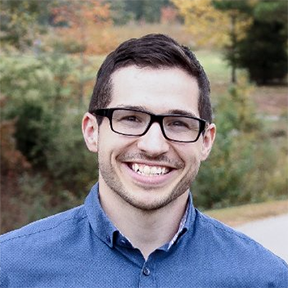 Andrew Jensen (BS 2005 Community & Regional Planning) recently joined Engineering Ministries International as a project leader and urban planner in Senegal. He had been the development services director for the City of Oskaloosa, Iowa. A photo of Joseph Reddy (BFA 2017 Interior Design) with a quote by his parents, the Rev. 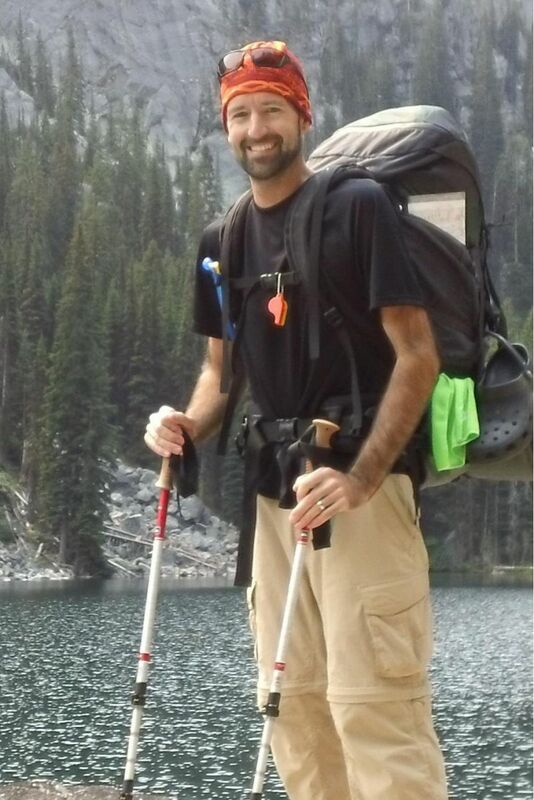 Wade and Liz Reddy, appears in “Hiking is for all abilities,” an article published in the Spring 2018 issue of American Trails magazine. 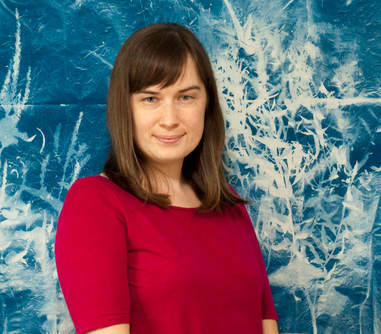 Catherine Reinhart (BFA 2008 Integrated Studio Arts), gallery manager and artist-in-residence at the Iowa State University Design on Main Gallery, has been accepted for an artist residency May 12-19 at the University of Nebraska-Lincoln’s Cedar Point Biological Station in western Nebraska. The Art at Cedar Point Artist in Residence program is aimed at artists and writers interested in the intersection of art and science. The residency offers the opportunity to engage and interact with researchers, professors and students of the biological sciences. Reinhart will work on a new body of works on paper, weavings and sculptures about the intersection of topography and textiles, exploring concepts of the real — land topography and textiles — and the ideal — cartography and weave drafts. What non-physical or digital systems do we use to understand and catalogue the land on a macro scale? How is this date translated visually and how do these image related to textile and woven structures? Melanie Vote (BFA 1995 Craft Design) is profiled in the Visionaries section of the May 2018 Artists Magazine, a publication of the Artists Network. She also has work in the This Land Is… International Landscape Invitational through May 10 at Arcadia Contemporary, Culver City, California, and Getting Personal exhibition May 23 (opening reception 7-9 p.m.) through June 17 at SFA Projects, New York City. 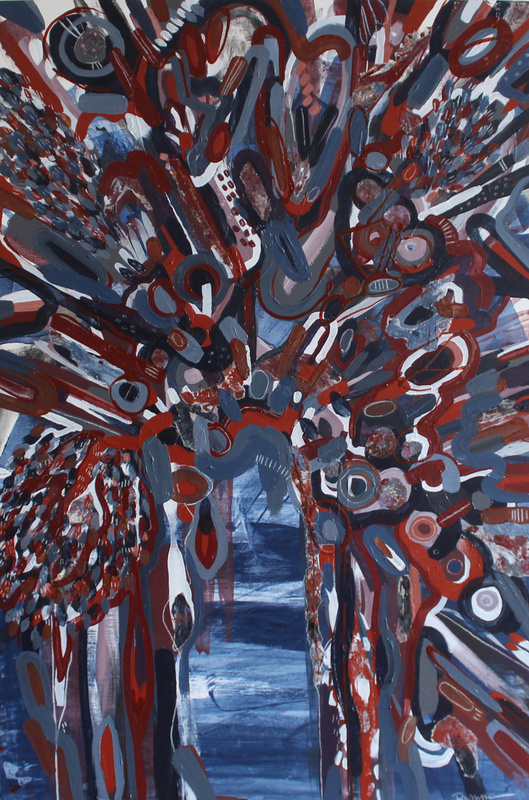 Vote is the co-curator of the Natural Proclivities exhibition May 24 (opening 6-8 p.m.) through June 27 at Shirley Fiterman Art Center, New York City; an artist panel discussion will be from 6 to 8 p.m. Wednesday, June 13. 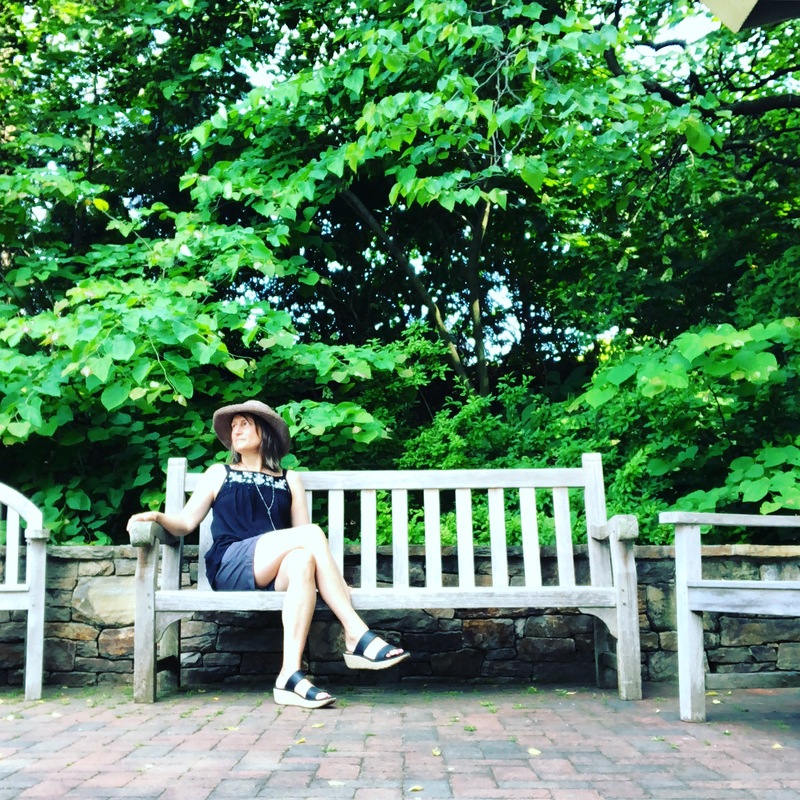 She will be leading a plein air landscape painting workshop Saturday, May 12, in Prospect Park, Brooklyn, New York, and “Portrait of a Place” workshop July 12-15 at Brookside Park in Ames, Iowa. Alison Brunn (MArch 2017 Architecture) received an honorable mention in The Avery Review 2018 Essay Prize for the essay “Data at the Edges of Personhood.” The Avery Review is an online journal of critical architecture essays published by the Columbia University Graduate School of Architecture, Planning and Preservation. Shannon (Hoy) Gapp (BS 2011 Community & Regional Planning / MLA 2015 Landscape Architecture), a landscape designer with Bolton & Menk in Des Moines, is a member of the firm’s children’s book series team recognized with an Award of Excellence in Communication by the Iowa chapter of the American Society of Landscape Architects (Iowa ASLA) at its 2018 Spring Conference March 26 in Ames. The book series also received a Gold Award for special promotional materials from the Service Industry Advertising Awards (SIAA). This award was nominated by Lime Valley Advertising, the firm that develops the illustrations for the books. Gapp is the author of Green Trees and Sam, which was developed as a fun and whimsical way to introduce children of all ages to the profession of landscape architecture. The book is short, simple and easy to read, but touches upon a plethora of topics relating to landscape architecture and the types of skills that landscape architects can have. Interestingly enough, the book was initially written about a boy named Sam, and originally started with “This is Sam. Sam is the man. Sam designs parks with trees and a plan.” The idea then emerged that this children’s book served as a great opportunity to promote females in the professional world as well. The books in the series have been shared at multiple schools and communities and have been a huge success. They are available online as e-books. 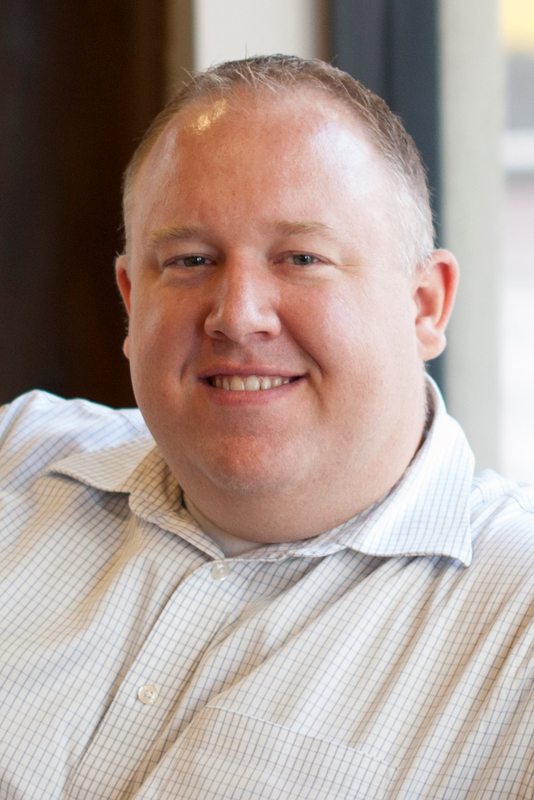 J. Jade Liska (BLA 1994 Landscape Architecture), PLA, is being promoted to deputy director of aviation planning and engineering with the Kansas City Aviation Department, which owns and operates Kansas City International Airport and Charles B. Wheeler Downtown Airport. In his new role, Liska will serve as project manager in the design and construction of a new $1.2 billion passenger terminal at KCI, coordinating with the outside design and construction team and Aviation Department leadership. Liska will also manage other landside and airside construction and maintenance activities at both airports. Liska has been with the city for more than 12 years, starting his career as a planner. He transferred to Aviation in 2014 to become manager of the airport planning and engineering division. Since then he has introduced the department’s first Construction Manager at Risk process and provided coordination with Public Works in citywide paving contracts, stormwater management and sustainability practices. 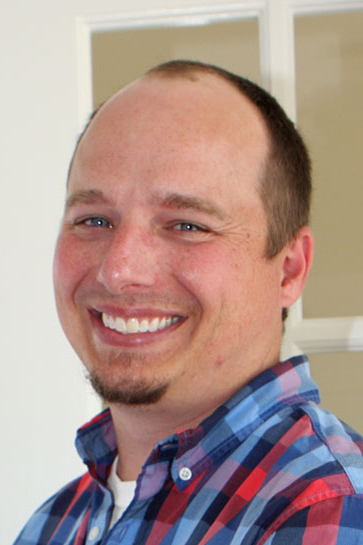 He is a licensed Professional Landscape Architect in Kansas and Missouri and is active in the Northland Regional Chamber of Commerce, Platte County Economic Development Council, Clay County Economic Development Council and KCI Rotary Club. 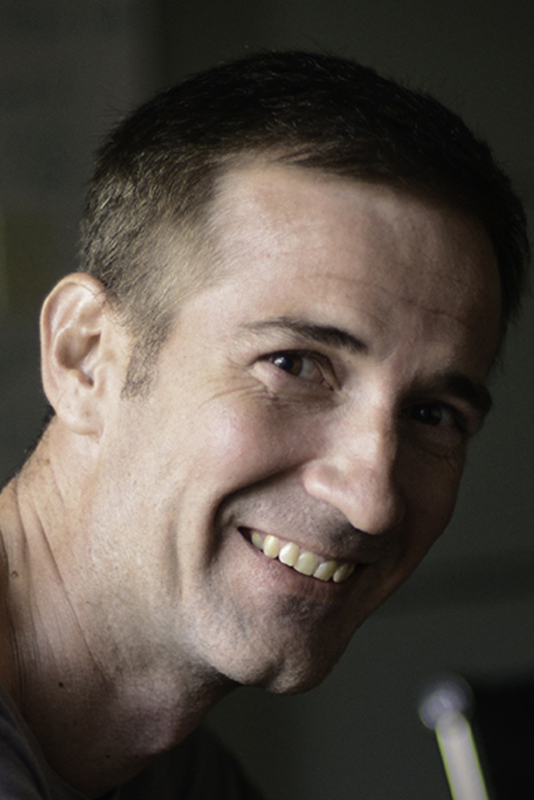 Liska lives in Kansas City, Missouri, with his wife and two children. Bruce Niedermyer (BLA 2011 Landscape Architecture), a landscape architect with RDG Planning & Design and a member of the Logan Planning and Zoning Commission, has been recognized as a 2018 Iowa STATEment Maker in the Career Achievement category by the Iowa State University Alumni Association. 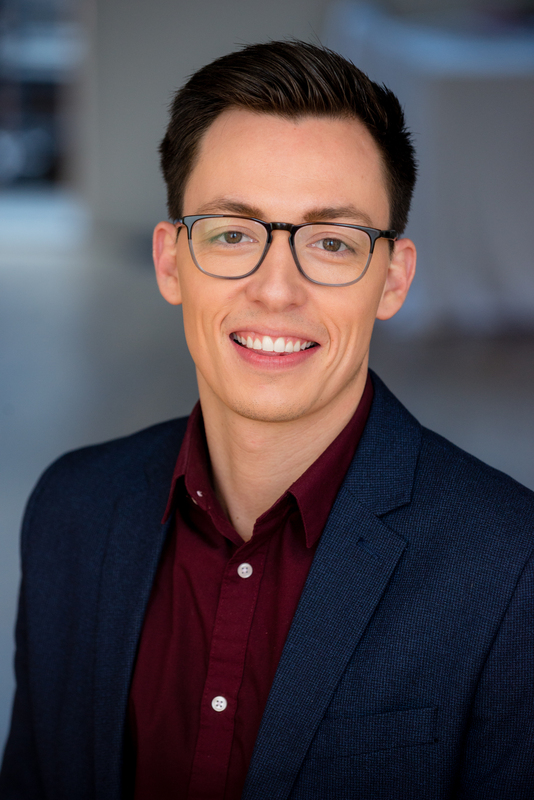 Josh Kassing (BArch 2014 Architecture / MFA 2016 Interior Design) recently became the creative director for Mary Cook Associates, an award-winning national residential and commercial interior design firm. Immediately after graduate school, Kassing joined Skidmore, Owings + Merrill in Chicago as an architectural assistant working on a variety of domestic and international commercial projects. He then was a designer for the Gettys Group, a global hotel design, development and branding firm where he designed dozens of luxury hospitality projects, prior to his current position. Artwork by Renelle White Buffalo (BFA 2011 Integrated Studio Arts) is part of Takuwe (which means “why” in Lakota), a new exhibition curated by CAIRNS (Center for American Indian Research and Native Studies) on display March 16 through May 19 at the Red Cloud Indian School Heritage Center on the Pine Ridge Indian Reservation in South Dakota. White Buffalo is one of 46 Lakota artists invited to create poems, songs and visual artworks related to the 1890 Wounded Knee massacre, which occurred 12 miles east of the gallery. A public reception will be at 2 p.m. Saturday, April 28. The Iowa State University Extension and Outreach Community and Economic Development Housing Needs Assessment Team of Biswa Das, Abbie Gaffey and Jon Wolseth (MCRP 2014 Community & Regional Planning) received the 2018 ISU Extension and Outreach Outstanding Practice in Community Engagement Award at the ISU Extension and Outreach Annual Conference 2018 Monday, March 26, at the Scheman Building on the Iowa State University campus. Das, an ISU assistant professor of community and regional planning, Gaffey and Wolseth are all community development extension specialists. Chandler (Johannsen) Subra (BFA 2016 Graphic Design) and Thad Subra (BID 2016 Industrial Design) were married last September and now live in Portland, Oregon, where Chandler works full time as a designer for digital advertising agency Swift and Thad is seeking a new job as a footwear designer. 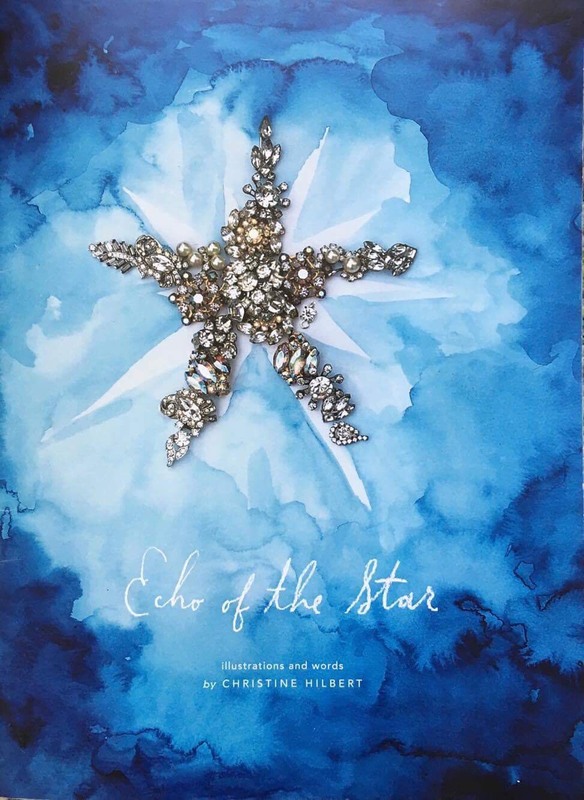 Christine (Peterson) Hilbert (BFA 2004 Integrated Studio Arts) recently wrote and illustrated her first children’s book, Echo of the Star (BookBaby, 2017). It is the story of a kind star who shares a bit of its sparkle with its friends as morning comes. It is a story about friendship and sharing joy, as well as how to carry on the memory of all special relationships when things change. The illustrations are a part of Hilbert’s ongoing “Heirloom Anthology” series of watercolor paintings combined with vintage gems. Hilbert has shared the book through readings at the Des Moines Public Library and Winterset Public Library and a book signing at the Des Moines Art Center. She will be coordinating artwork at the DMPL’s main branch this summer. She has also guest lectured at South Dakota State University, sharing her creative process and experiences in publishing this book. Bricks & Blocks, a solo exhibition of artwork by Catherine Reinhart (BFA 2008 Integrated Studio Arts), artist-in-residence and manager of the Iowa State University Design on Main Gallery, will be on display April 16 through May 25 at the Stewart Gallery, Grinnell Art Center, Grinnell. 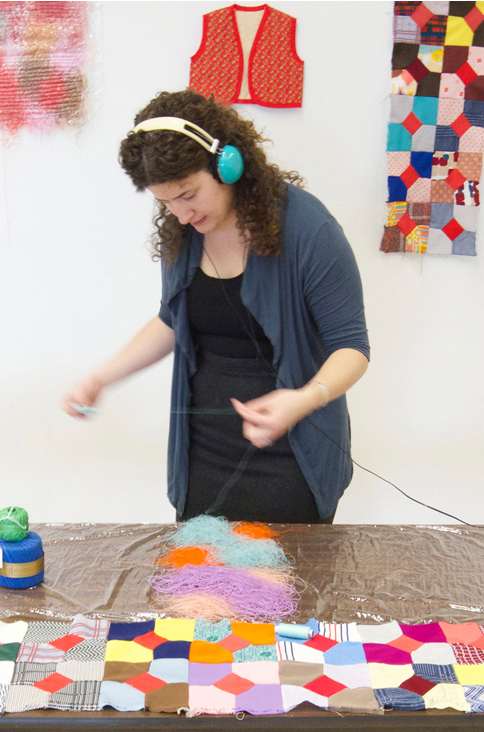 The show will feature fiber works and a site-responsive installation created in partnership with the Grinnell community. A public reception will be from 5 to 6:30 p.m. Saturday, April 21, during which guests are invited to work with Reinhart to create elements of the installation. It will then be available for visitors to move, stack and investigate throughout the rest of the exhibition. 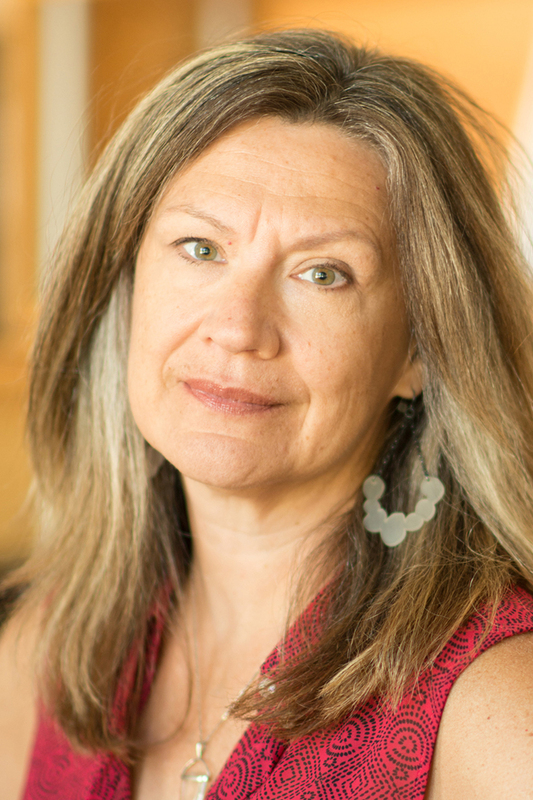 After a successful career as principal of her own design firm in the Twin Cities area and senior art director at a Minneapolis ad agency, Christine Mangold (BA 1973 Applied Art – Advertising Design) has established “an ‘encore’ career that has provided the most satisfaction of all my lifetime creative endeavors,” she says. As the lifelong learning program director for Ebenezer Senior Living sites, Mangold creates programs that help residents learn more about themselves, others and the world around them. 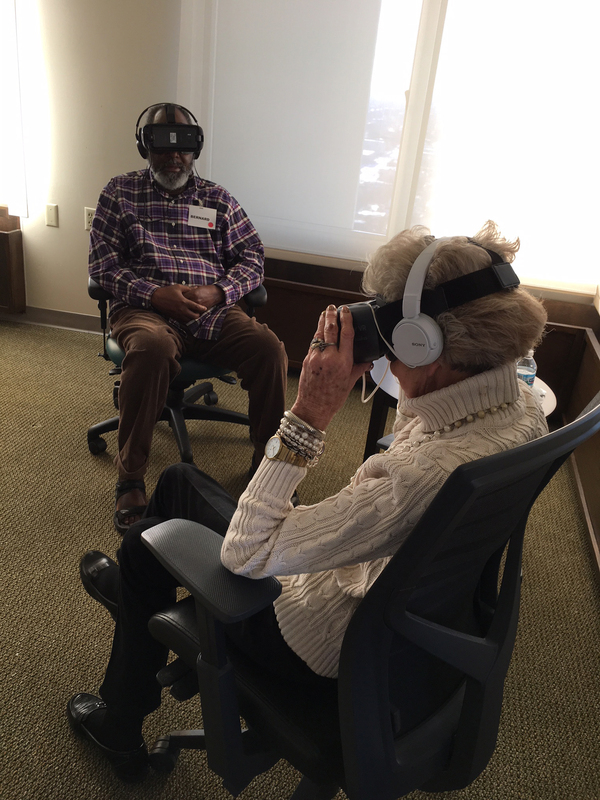 Her concept of bringing virtual reality experiences to residents has resulted in the 2018 Innovation Award from Leading Age Minnesota, the largest association of organizations serving Minnesota seniors. “Its success as a pilot program and now as an ongoing experience (Virtual Travel Club) is expanding seniors’ lives in a way that we could never have imagined,” Mangold says. “Smoke (no. 1)” (graphite, salvaged law-enforcement paper targets shot through, in artist-made painted plywood frame, 2015, 34.5″ x 50.5″ x 3″) by Mitchell Squire (BArch 1994 / MArch 2001 Architecture), a professor of architecture at Iowa State University, has been added to the Minneapolis Institute of Art’s permanent collection. “Smoke (no. 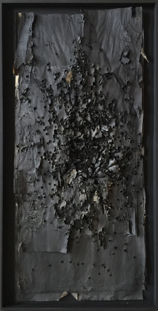 1)” is part of a seven-piece series of works on paper Squire created in 2015 to explore the afterimage recorded on the backs of salvaged law-enforcement firearms-training targets. For this series, he applied multiple layers of graphite to the back side of compressed masses of targets. Each mass contains several dozen sheets stapled atop each other per each round of training. When positioned with the back side toward the viewer, they are said to “resemble highly abstracted human figures.” Select pieces from the series appeared in exhibitions in Des Moines, Chicago and New York. Robert A. Gabalski (MArch 1989 Architecture) has been promoted to partner at Lothrop Associates LLP in White Plains, New York. This year, Lothrop, a firm of 45, celebrates 51 years of providing architectural design services in the New York-New Jersey-Connecticut (Tri-State) area. With 35 years of professional practice experience, Gabalski is instrumental in managing two of 12 of the firm’s “vertical” project categories — restoration and municipal. Grant C. Uhlir (BArch 1986 Architecture), a principal/managing director of Gensler’s Chicago office, has been elevated to fellowship in the American Institute of Architects. He will join all new fellows at the College of Fellows Investiture Ceremony during the AIA Conference on Architecture 2018 in New York City in June. Morgan Van Denack (BLA 2016 Landscape Architecture) recently joined Backyard by Design in Overland Park, Kansas, as a landscape architect and materials design specialist in charge of design, 3D modeling and helping clients choose all of their materials, from pavers to wall stone veneer to cabana and bathroom interiors and finishes as well as furniture. She previously was a landscape designer for Hermes Landscaping, Mission, Kansas, and Western DuPage Landscaping, Naperville, Illinois. 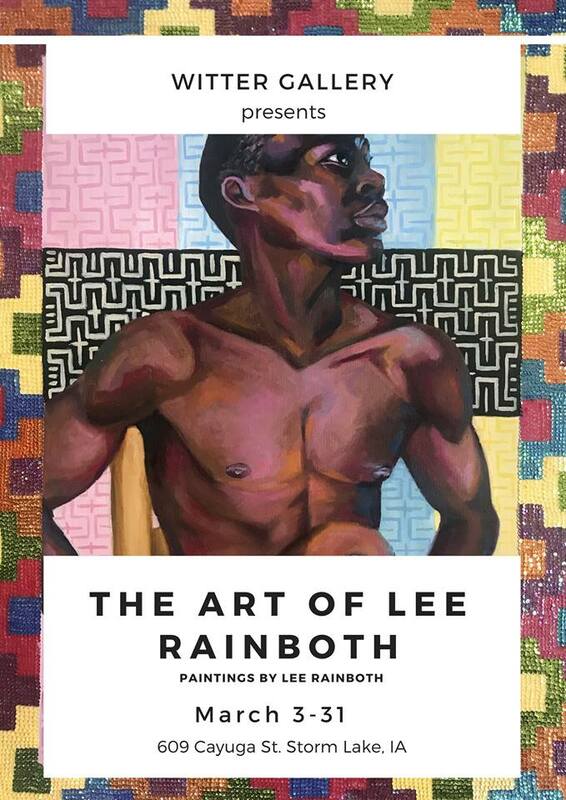 The Art of Lee Rainboth, an exhibition of paintings by Lee Rainboth (BFA 2007 Integrated Studio Arts), is on display March 3-31 at the Witter Gallery in Storm Lake, Iowa. Jonathan Castro‘s (BFA 2007 Integrated Studio Arts) “Glaze Series” collaboration with Nest Studio is featured in the current issue of Luxe Interiors + Design magazine. 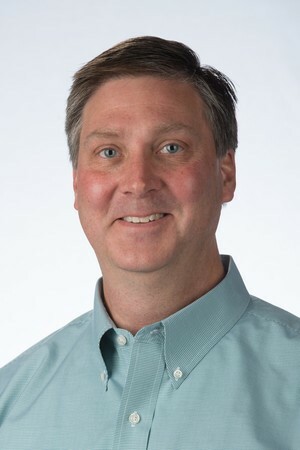 Tim Schroeder (BArch 1994 Architecture), formerly vice president of Neumann Monson Architects, has been promoted to president of the 40-year-old, award-winning firm with offices in Iowa City and Des Moines. Schroeder joined Neumann Monson as a summer intern in 1991. An accomplished architect nationally recognized for design and sustainability, he has built meaningful partnerships, set strategic directions for the firm and harnessed its potential to improve regional urban life through community-minded architecture. Reinaldo Correa (BArch 2008 Architecture), a lecturer in architecture at Iowa State University, has won the commission for a public art installation at the entrance to the new Jester Park Nature Center in Granger, Iowa. Correa’s “Whispers of Nature” proposal features a central stem with “reflective droplets” and four stacked metal rings on which he intends to cut patterns referencing the woodland, prairie and wetland ecosystems found in the park as well as conservation-related imagery. The content for each ring will be determined through an art workshop Correa plans to conduct with students from area schools and/or other local stakeholders. The sculpture should be installed in June; the nature center will be dedicated in August. 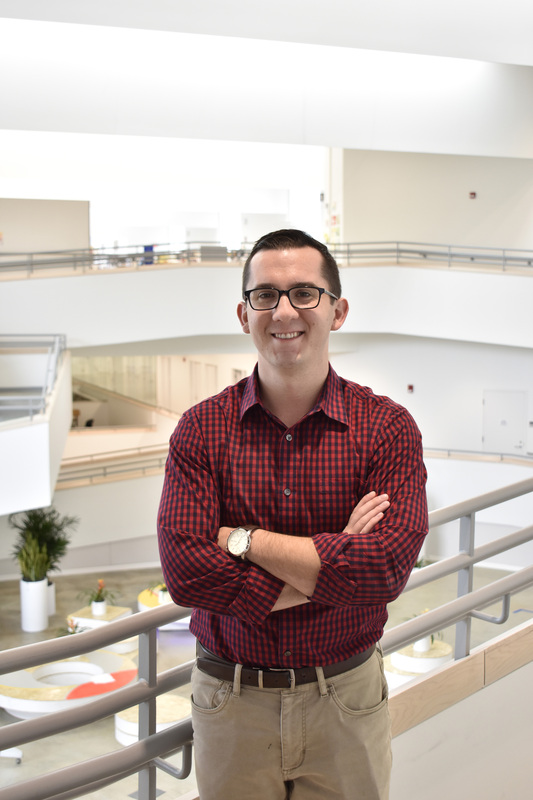 Zach Sunderland (BArch 2013 Architecture), AIA, NCGC, has launched Haven Design|Build, an architecture and construction firm in Durham, North Carolina, and partner company to Haven Developers. Haven exists to empower under-served neighborhoods through the design, construction and management of exemplary, community-oriented spaces. 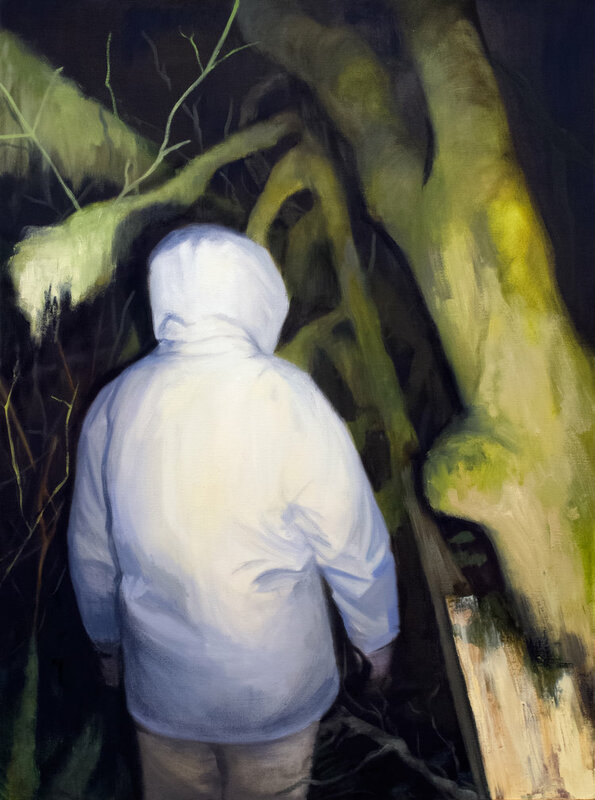 “Truth or Consequences” (egg tempera) by Meghan Flynn (BFA 2011 Integrated Studio Arts) has been accepted into the Close In: 1st Inland Northwest Juried Landscape Art Exhibition May 26 through Aug. 11 at Gonzaga University’s Jundt Art Museum. Suburban Remix: Creating the Next Generation of Urban Places, edited by Jason Beske (BS 2002 / MCRP 2007 Community & Regional Planning), AICP, and David Dixon, has been published by Island Press. 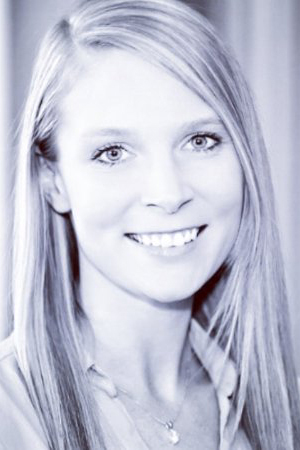 Beske is an urban planner and urban designer in the Washington, D.C., area. Des Moines photographer Jon Lemons (BFA 2009 Integrated Studio Arts / Journalism & Mass Communication) won the Photo Media Award sponsored by the Octagon Board of Trustees in the 50th Clay, Fiber, Paper, Glass, Metal, Wood National All-Media Exhibit on display Jan. 26 through April 7 in the Main and Sweeney Galleries at the Octagon Center for the Arts, 427 Douglas Ave., Ames. 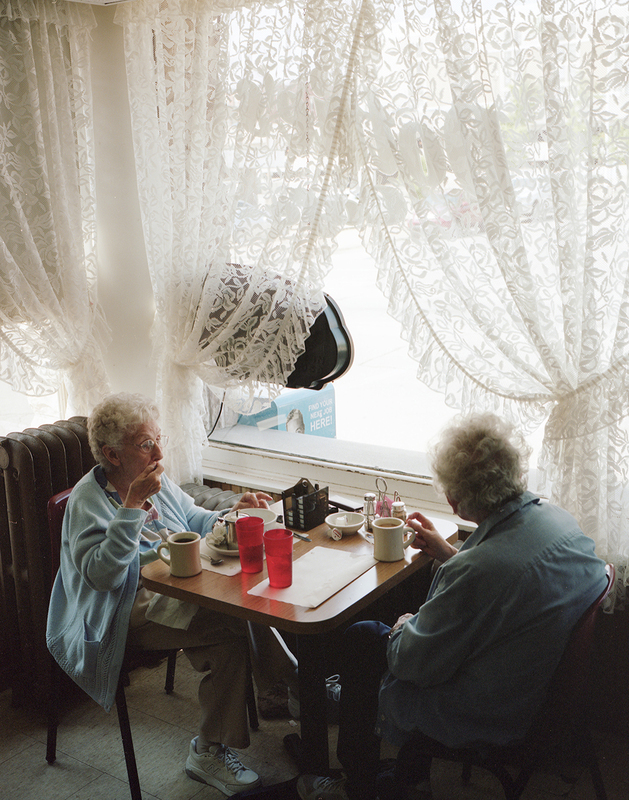 Lemons received the award for “Dottie’s,” a “street” photograph he shot with his medium-format film camera of two similarly-dressed women having breakfast at Dottie’s Café in Dubuque. Lemons is a video production specialist with the Des Moines Public Schools. 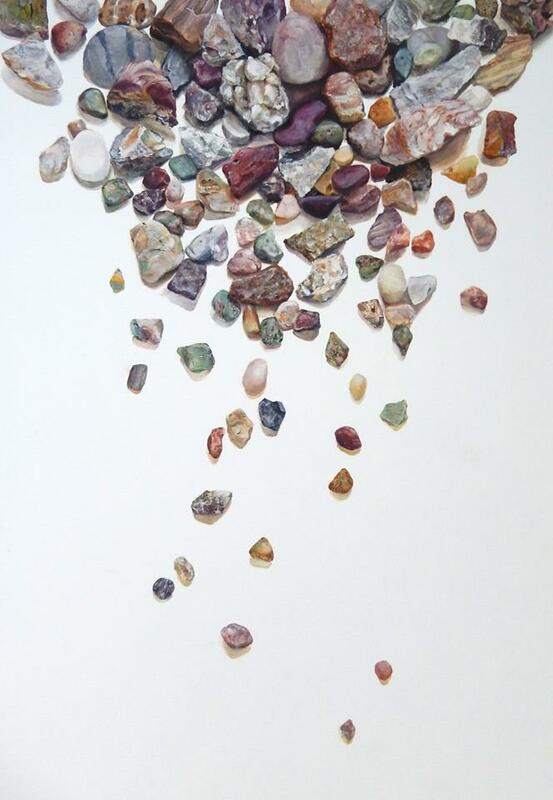 Carol Faber (MA 1990 Art & Design – Drawing, Painting, Printmaking / MFA 2004 Integrated Visual Arts), an Iowa State University associate professor of graphic design, received an honorable mention for her “Colorado Rock” digital photograph (15″ x 15″, 2017) in the 50th Clay, Fiber, Paper, Glass, Metal, Wood National All-Media Exhibit on display Jan. 26 through April 7 in the Main and Sweeney Galleries at the Octagon Center for the Arts, 427 Douglas Ave., Ames. 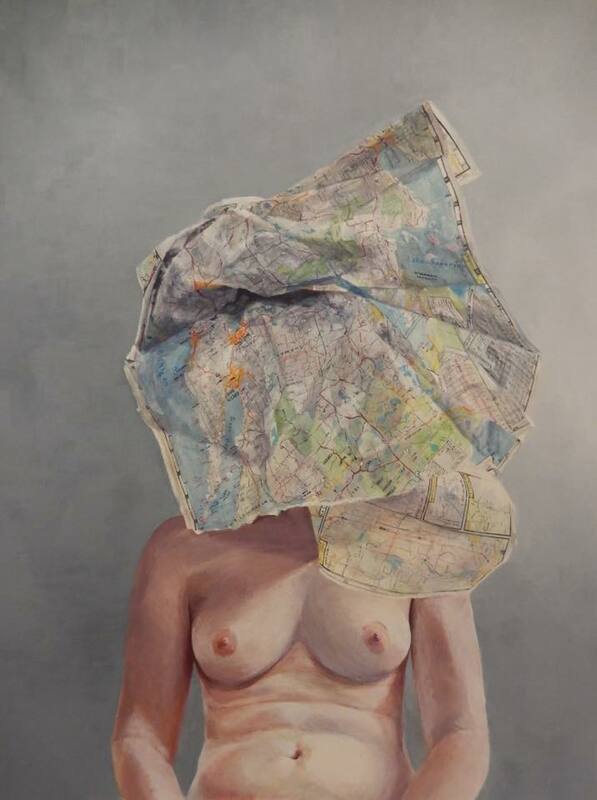 “Sense of Place” by Meghan Flynn (BFA 2011 Integrated Studio Arts) has been accepted into Manifest Gallery’s International Painting Annual 8 publication. 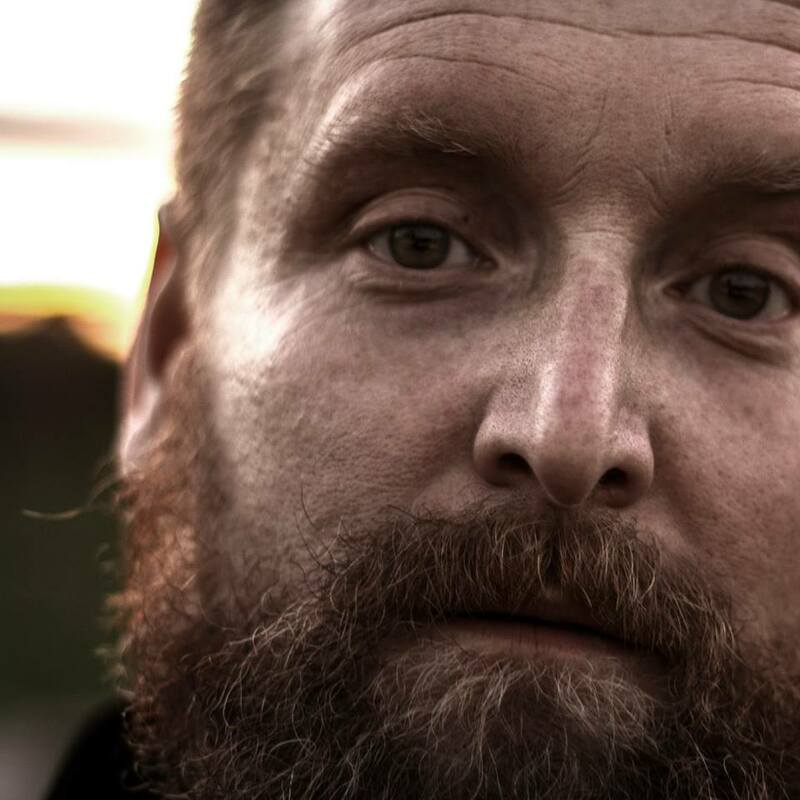 Spoonful of Inspiration, a solo photography exhibition by Brent Herrig (BFA 2007 Integrated Studio Arts), will be on display April 4 through May 31 at the Le Mars Arts Center in Le Mars, Iowa. An opening reception will be from 10 a.m. to 4 p.m. Saturday, April 7. After graduating from Iowa State, Herrig moved to New York City to pursue his photography career. In 2013 he started shooting culinary photography full time. While searching for a personal project he learned that nearly every chef has a favorite spoon, which is often their favorite kitchen tool. He then paired this idea with the foods the chefs are passionate about and that inspires them. 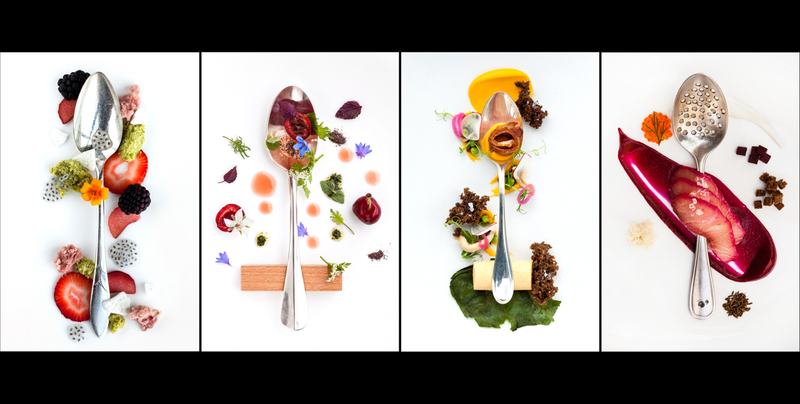 He has created a series of 75-plus different chef spoon portraits to bring this story to life. He will debut this new series in the Le Mars exhibition. 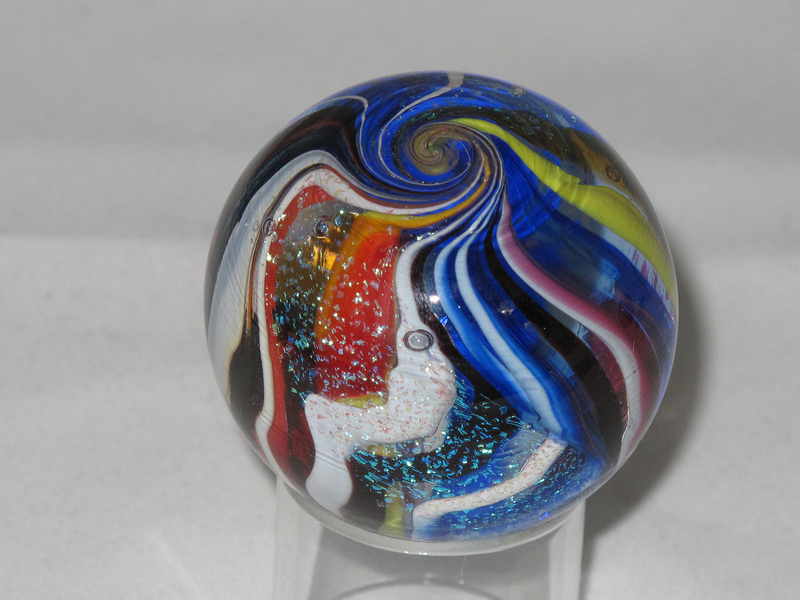 Work by Art Ciccotti (BFA 1987 Art Education, owner of Ciccotti Art Glass, will be on display in Luminosity, a joint exhibition with Urbandale artist Flo Hayes from Feb. 22 through March 17 at the Iowa State University Design on Main Gallery in downtown Ames. An opening reception will be from 6-8 p.m. Thursday, Feb. 22. 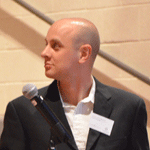 Michael Wright (BS 2009 Community & Regional Planning) has joined Sites Southwest as an urban planner. 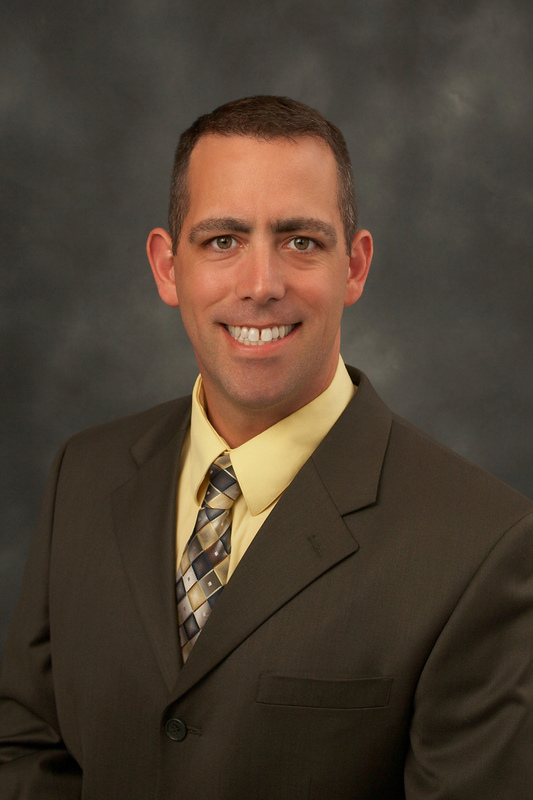 Wright has experience in transportation planning and historical preservation and planning. He received a master’s degree in community and regional planning and a certificate in historic preservation, both from the University of New Mexico. “The pale moon settles, outside the night winds moan. Tonight I sleep alone,” an oil painting by Jeremy Caniglia (BFA 1993 Art & Design – Drawing, Painting, Printmaking), has been selected for Infected by Art Volume 6. 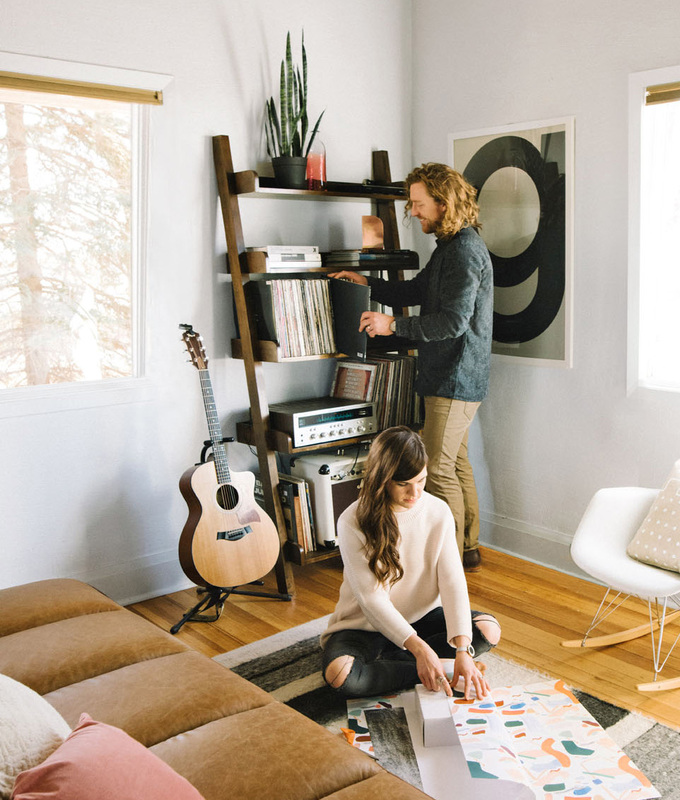 Chad (BFA 2009 Graphic Design) and Meg Gleason (BFA 2008 Graphic Design) are the founders of Moglea (pronouced MOH-glee), a letterpress stationery and home goods brand based in rural Iowa. They were featured in “House Tour: Merry Makers” in the November/December 2017 issue of Midwest Living magazine. 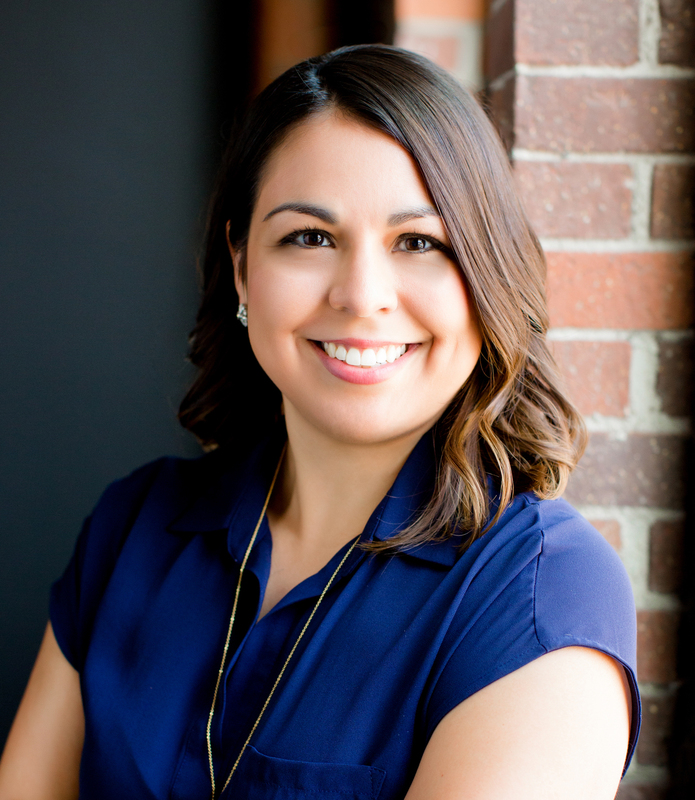 Janna Alampi (BArch 2007 Architecture), AIA, NCARB, BECxP, CxA+BE, has started a full-service architecture and building enclosure consulting firm, EPICx Studio. 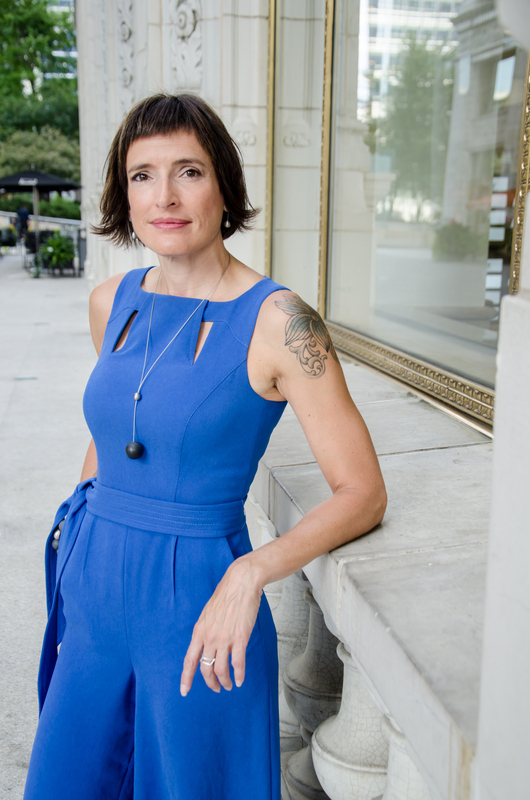 Her firm provides sustainable and energy-efficient building solutions through an integrated, holistic approach, which improves building performance, energy efficiency, and promotes sustainable communities. Alampi is also founder and chair of the Building Enclosure Council of Iowa (BEC-Iowa), an interdisciplinary network of affiliated architects, engineers, consultants, manufacturers, contractors, developers, owners, facility managers, educators and other interested individuals. The council provides a forum for all those in the construction industry with an interest in the enclosure (envelope) of commercial, institutional and residential structures and the related building science to discuss, learn about and address the common and local issues and science relating to the building enclosure — the exterior systems of buildings that play a critical role in building performance, energy efficiency, and occupant health, comfort and safety. “Colorado Rock” (digital print, 15″ x 15″, 2017) by Carol Faber (MA 1990 Art & Design – Drawing, Painting, Printmaking / MFA 2004 Integrated Visual Arts), an Iowa State University associate professor of graphic design, received Best Color Work Award in the Color of Korea “Natural Color” Exhibition: 2017 International Invitational Exhibition of Color Works at Hangaram Art Gallery in Seoul, South Korea. 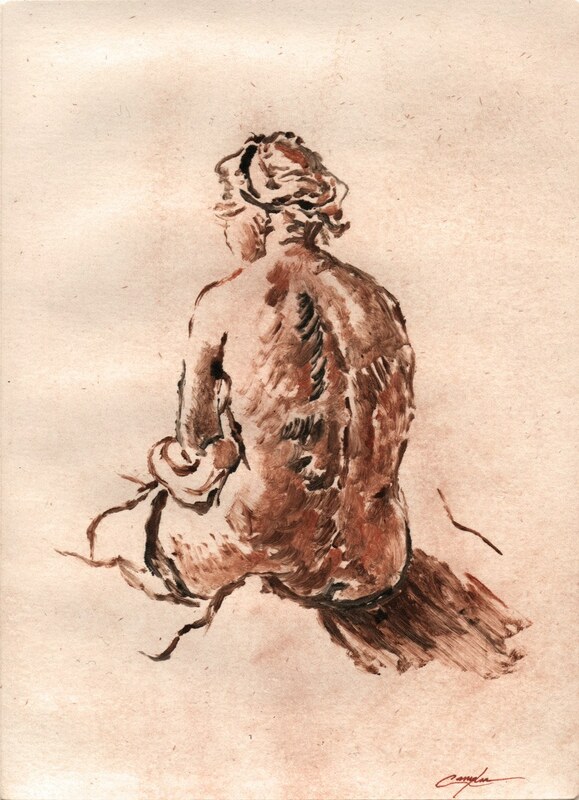 The image is published on page 18 of the exhibition catalog. Kevin Wagner (BArch 2010 Architecture), AIA, an architect with Substance Architecture in Des Moines and a lecturer in architecture at Iowa State University, received the 2017 AIA Iowa Young Architect Award from the Iowa chapter of the American Institute of Architects at its fall convention in September. He is featured on page 9 of the Winter 2018 issue of Iowa Architect magazine. The Young Architect Award is given to individuals who have shown exceptional leadership and made significant contributions to the profession in the areas of design, education and/or service in an early stage of their architectural career. Wagner is the third person to receive the award. Becky Popelka (MFA 2011 Graphic Design) opened Big Picture Gallery and Studio in North Liberty, Iowa, in September. 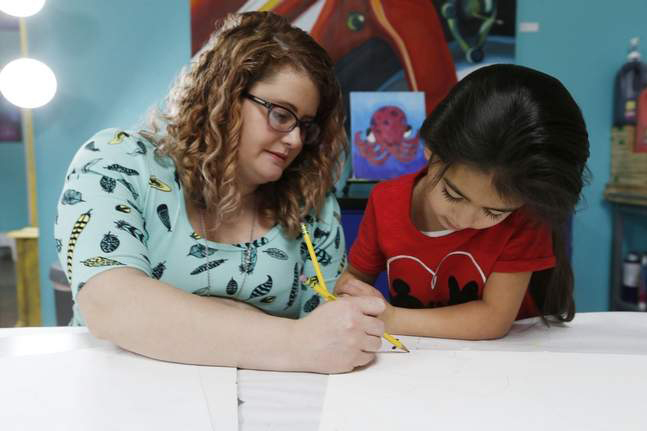 The business offers children’s art classes, workshops and parties, including wine-and-paint parties for adults, and work for sale by local artists. Popelka previously taught K-8 art classes at Regina High School in Iowa City for six years. She was recently featured in a story in the Cedar Rapids Gazette. 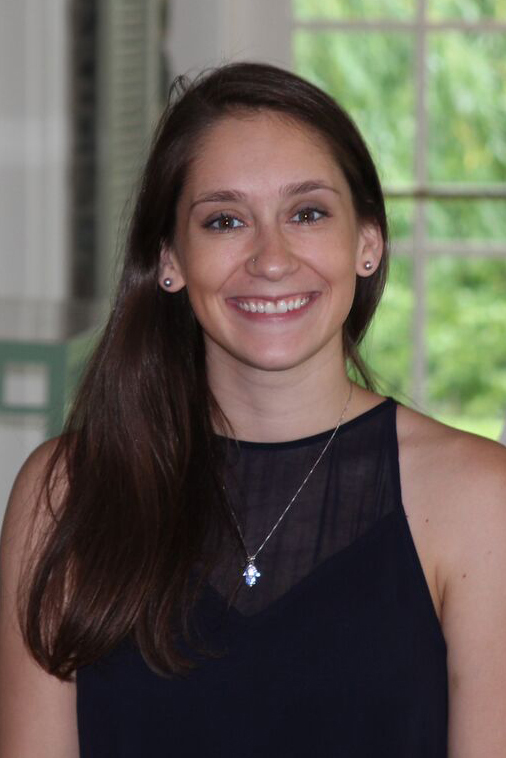 Mariah Bakke (BLA 2015 Landscape Architecture), a landscape architect with R.S. Walsh Landscaping in Fort Myers, Florida, has earned her Registered Landscape Architect license. 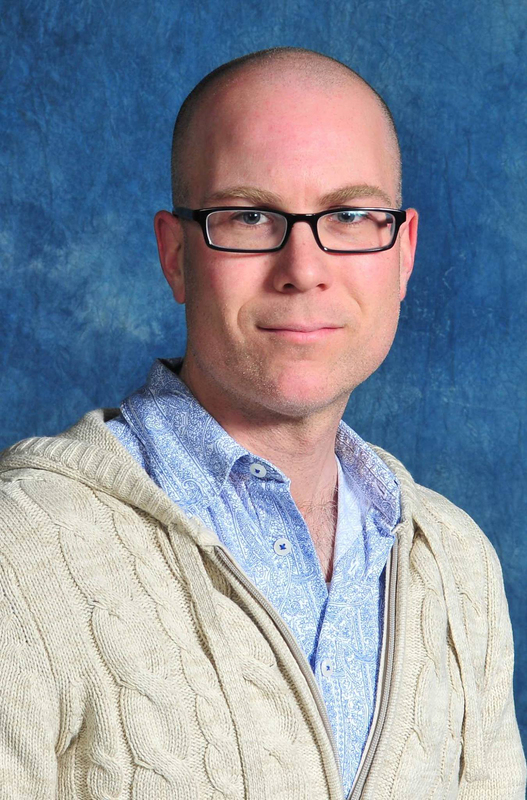 John Anderson (BFA 2000 Graphic Design / BFA 2001 Drawing/Painting/Printmaking) was chosen to participate in the 2017-2018 Art Writing Workshop through the Creative Capital | Andy Warhol Foundation Arts Writers Grant Program, which partners with the International Art Critics Association/USA Section to give practicing writers the opportunity to strengthen their work through one-on-one consultations with leading art critics. Anderson will be working with mentor Charles Desmarais. 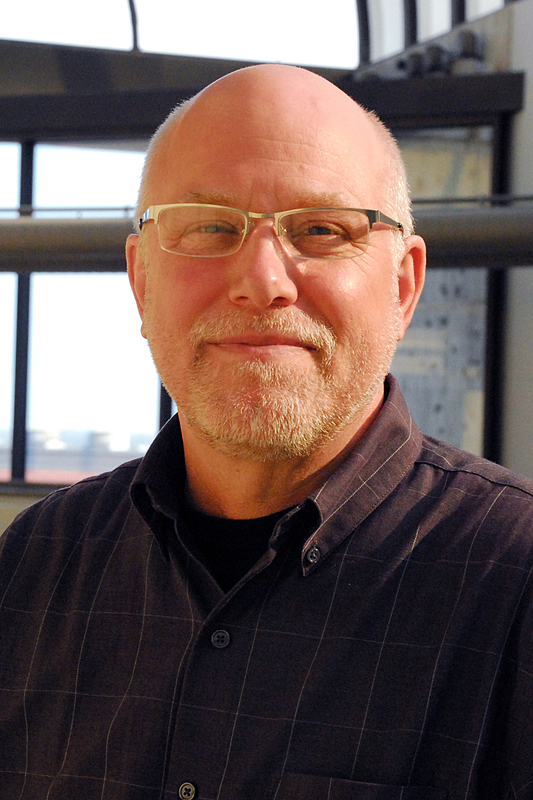 Jim Lammers (BArch 1965 Architecture) is the co-chair and founder of AIA Minnesota’s newly organized Health Design Knowledge Community, which will provide a network of individuals engaged in healthcare design for the purpose of sharing knowledge in this rapidly changing practice sector. 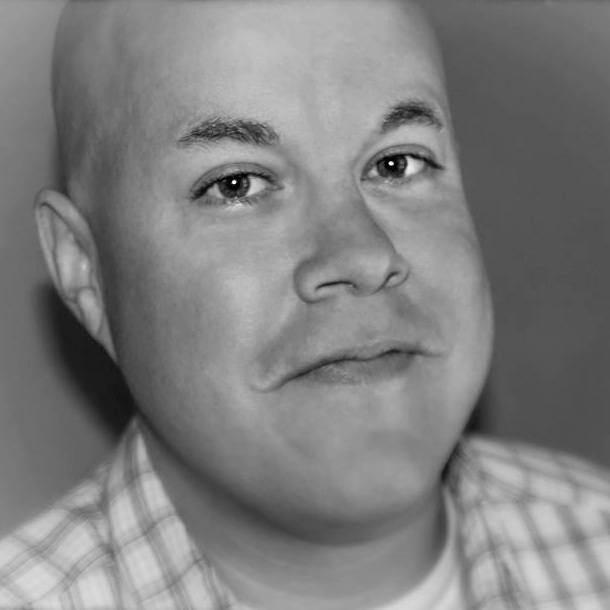 Sean Heisler (BFA 1996 Graphic Design), the senior art director at Webster in Omaha, was named AAF Omaha Ad Pro of the Year by the American Advertising Federation Omaha. The award is given to an AAF Omaha member with a distinguished record of service in advertising, including professional and community service, particularly to AAF Omaha. 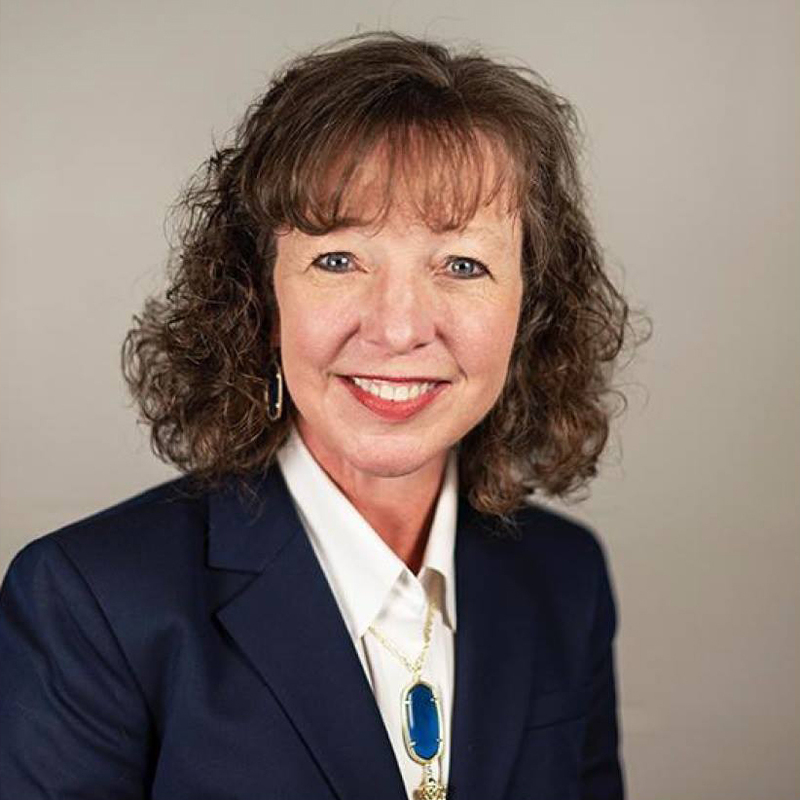 Heisler has served as an active AAF Omaha volunteer, committee member and board member and currently leads the organization’s special events fundraising team. 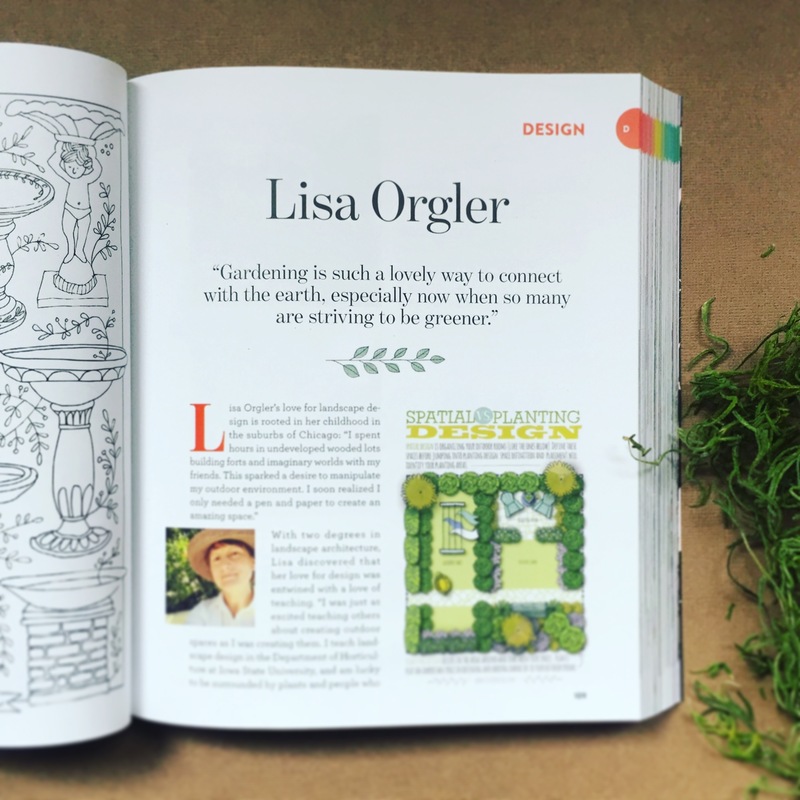 Lisa Orgler (BLA 1992 / MLA 2000 Landscape Architecture), a senior lecturer in Iowa State University’s Department of Horticulture, was recently showcased for her illustrations and garden design website in a new book, Botanica, published by UpperCase magazine. Iowa: A Place, an exhibition of artwork by Kristen Greteman (BArch 2011 / MS 2016 Architecture / MCRP 2016 Community & Regional Planning), is on display Dec. 3, 2017, through Jan. 27, 2018, at the Gallery in the Round in Ames. The show includes 23 prints incorporating intaglio, monotype, and cyanotype photography. The series contemplates the way in which land is parceled out and developed across the United States with a particular focus on suburban tract development and the division of land in Iowa. A public reception will be from 5 to 7 p.m. Thursday, Dec. 14. An artist, aspiring architect and avid traveler with a passion for finding beauty in the everyday, Greteman is the exhibits manager for the Octagon Center for the Arts in Ames. “Ecofeminist Ethics for Sustainable Urban Public Space,” a paper by Rucha Newalkar (MS 2017 Architecture) and Andrea Wheeler, Iowa State University assistant professor of architecture, has been published in the International Academic Forum (IAFOR) International Conference on the City 2017: Official Conference Proceedings. The paper was based on Newalkar’s master’s thesis. 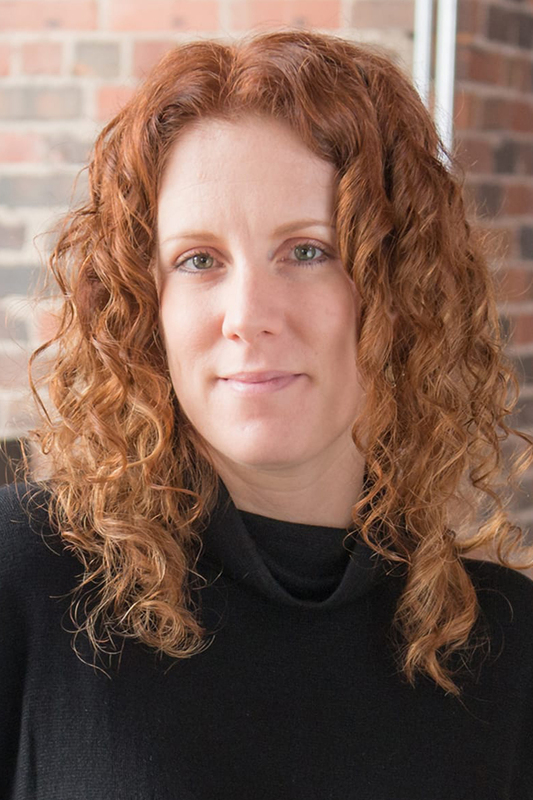 She is a job captain with OH Planning + Design in Portland, Oregon, where she conceptualizes, designs and delivers construction documents for institutional buildings and adaptive reuse projects. She is a member of EcOH, the firm’s committee devoted to education, advocacy and design excellence related to the environment and society. David Lee Andersen (BA 1974 / MArch 1977 Architecture), AIA, of Minneapolis, Minnesota, completed a 20-year master plan for the iconic Fontenelle Forest Nature Center near the Omaha suburb of Bellevue, Nebraska. The plan was adopted by the Fontenelle Forest Board of Directors on Nov. 15. The nature reserve was established more than 100 years ago before the creation of the US National Park Service. It is one of the oldest such nature reserves in the US. Andersen previously designed the Buffett Nature Center at Fontenelle Forest in 1999. 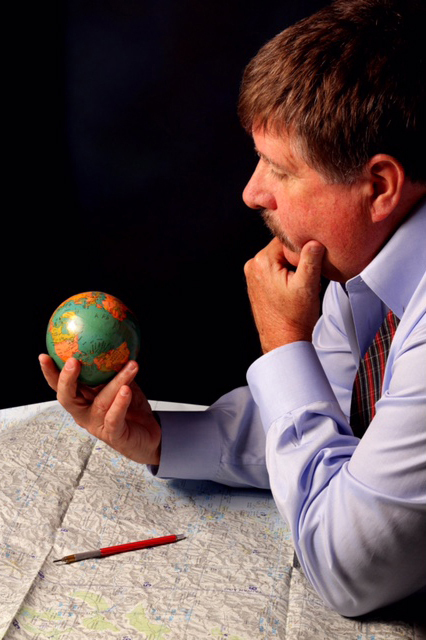 He has established a reputation for park and nature reserve planning worldwide with his work on national parks in Panama, Guyana, Belize, Costa Rica and most recently in Vietnam. 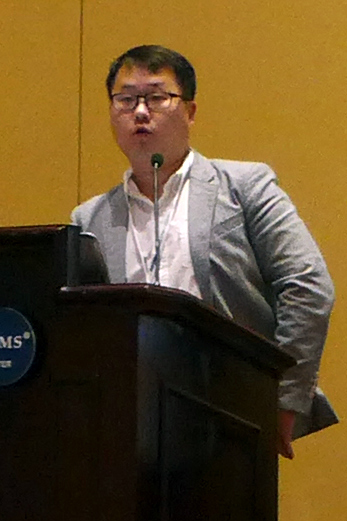 Yongyeon Cho (MFA 2016 Interior Design), an interior designer with HOK in Chicago, Illinois, presented his graduate fellowship research on “Wellness Design Evaluation Criteria for the Main Lobby of a Healthcare Facility” Monday, Nov. 13, at the Healthcare Design Expo & Conference in Orlando, Florida. 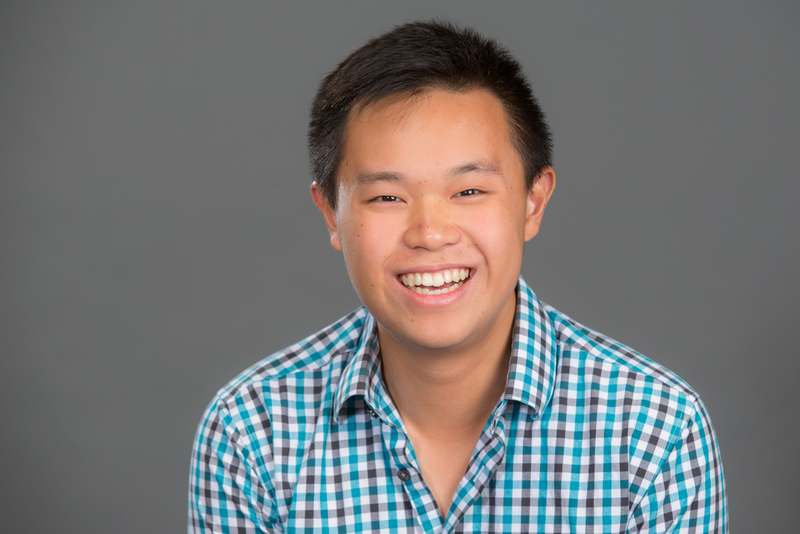 Cho received the 2016 AAHID (American Academy of Healthcare Interior Designers)/Steelcase Health Graduate Research Fellowship, a $7,500 grant that supported continuing research into his master’s thesis topic on creating a user-centered wellness design evaluation tool for the main lobby of a healthcare facility. Jihyun Song, ISU associate professor of interior design, was his major professor at Iowa State. 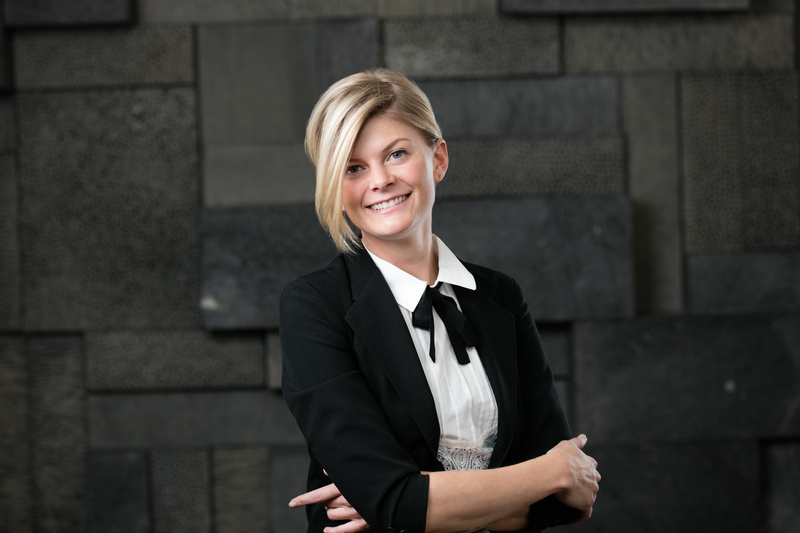 Anna Schwennsen Jones (BArch 2011 Architecture), the owner of MOD Design in Des Moines, has been elected editor of Iowa Architect magazine, the official publication of the Iowa chapter of the American Institute of Architects. Jones has been a member of the magazine’s editorial board since 2012. She is a member of the Greater Des Moines Leadership Institute Class of 2017 and an active member of Iowa Women in Architecture. 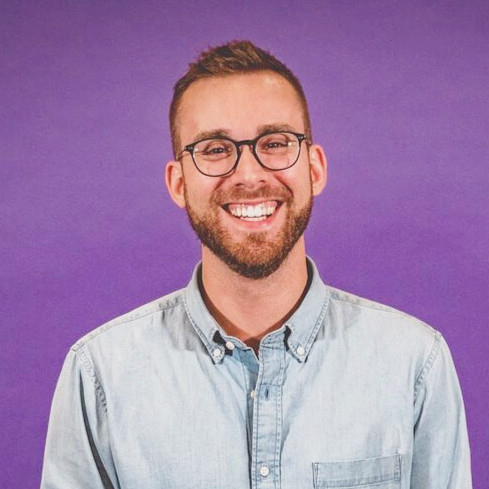 Alex Priest (BLA 2011 Landscape Architecture) is the new public engagement and curatorial manager at el dorado architects in Kansas City, Missouri. He will strategically implement curatorial thinking and artistic practices into the urbanistic and architectural work of this award-winning firm. 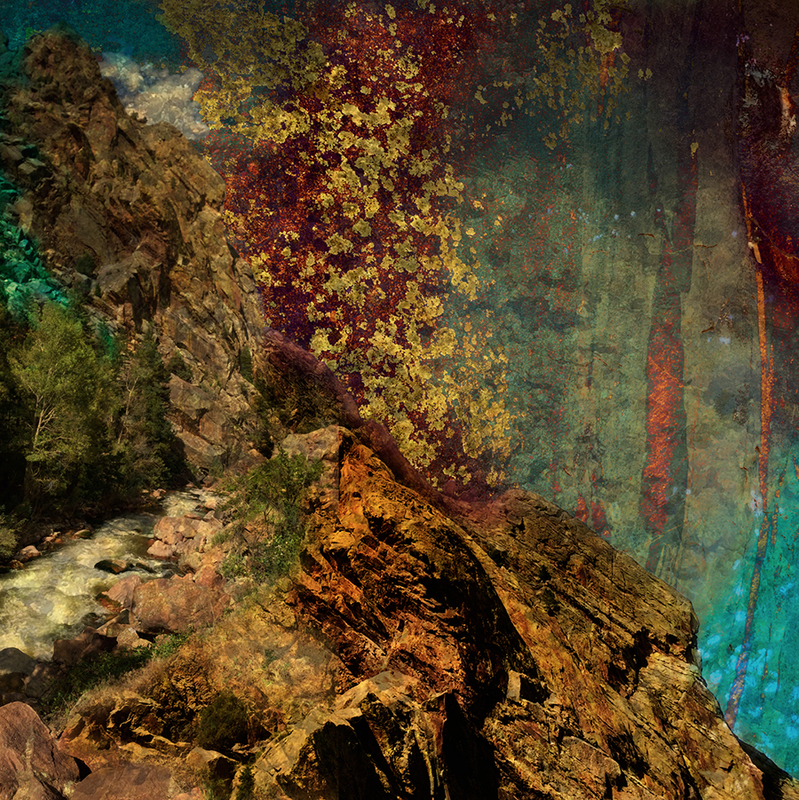 Natural Surfaces, a solo exhibition of digital artwork by Carol Faber, an Iowa State University associate professor of graphic design, is on display Oct. 30 through Dec. 1 in the Helene Constance Gallery at Graceland University, Lamoni. 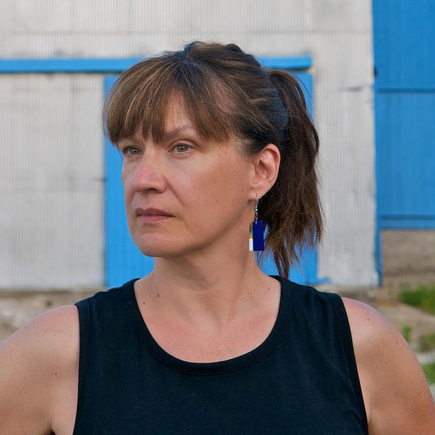 She will give an artist talk at 11 a.m. Thursday, Nov. 9, in the university’s Carol Hall. Jeremy Rudd (BFA 2001 Visual Studies) is part of Relief from Endlessness, a two-person show with Anda Tanaka, on display Nov. 3 through Dec. 21 in the Sweeney Gallery at the Octagon Center for the Arts in Ames. A reception will be from 5-8 p.m. Friday, Nov. 10. Rudd is an assistant professor of art at Divine Word College, Epworth, Iowa, and the owner of Jeremy Rudd Art and Design, Dyersville. 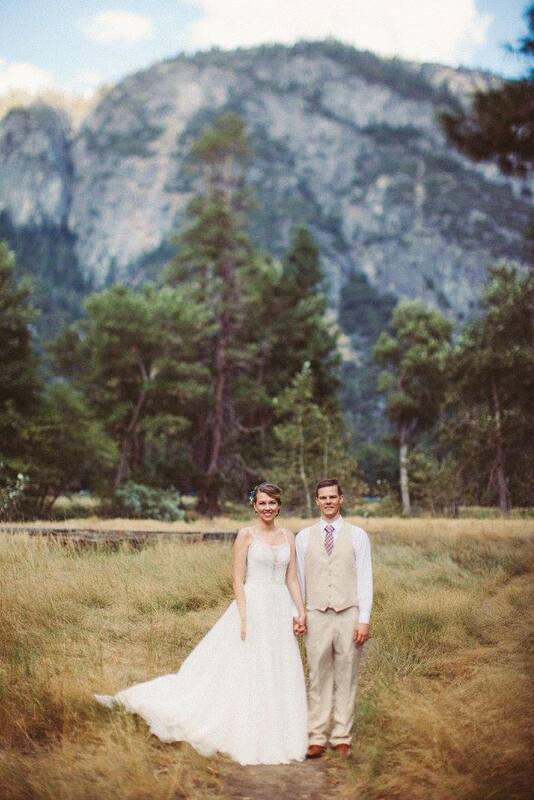 Sarah Jensen (BLA 2015 Landscape Architecture) and Brian Haynes (BS 2016 Mechanical Engineering), Pasadena, California, were married Sept. 23, 2017, in Yosemite National Park. They fell in love with Yosemite on a weekend camping trip two years ago and knew it would forever be a special place for them. Their wedding day was perfect as they were surrounded by family and friends supporting them in this new journey of life. Sarah is a designer with EPTDesign in Pasadena and Brian just joined Woodward, an aerospace engineering company, in Duarte, California, after working for 3M. 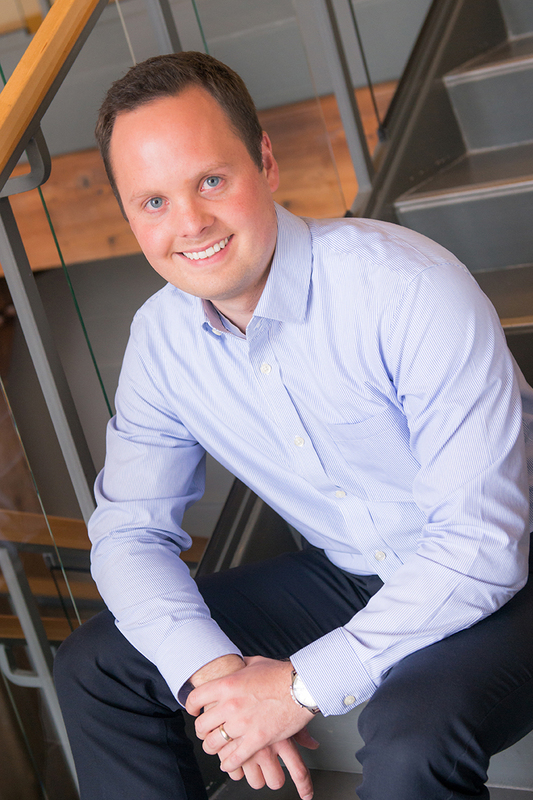 Gregory Leichty (BLA 2012 Landscape Architecture & Environmental Studies) was promoted to associate with DHM Design‘s Denver office earlier this year. Leichty recently became a licensed landscape architect in the state of Colorado. Jay Pleggenkuhle (BLA 1990 Landscape Architecture), originally of Fredericksburg, Iowa, and now the co-owner of Stonerose Landscapes in Las Vegas, Nevada, worked to create a healing garden for the Las Vegas community following the deadly shooting at the Route 91 Harvest music festival. Thousands of people from across the country donated their time and resources to create the garden, which opened Oct. 6. 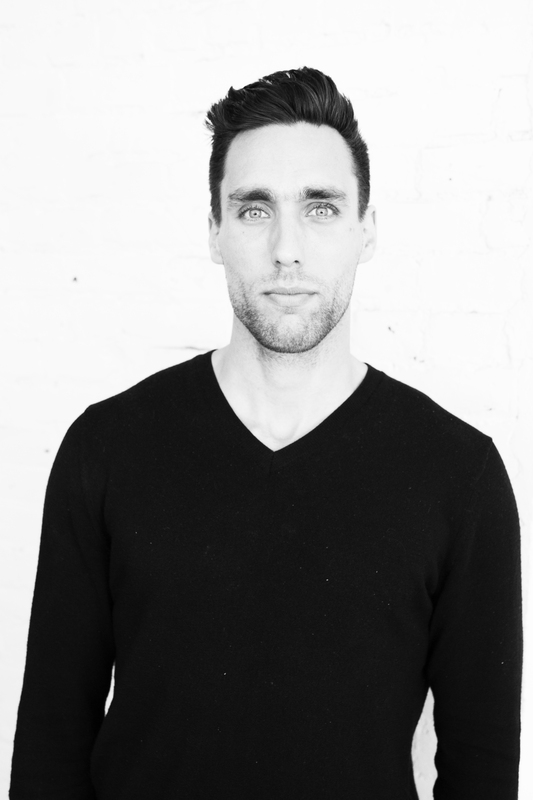 Matthew Getch (BLA 1998 Landscape Architecture) recently joined the boutique office of URBAN in London as an owner/partner and design director. Prior to URBAN, he ran the design studios of Martha Schwartz, Aecom and Peter Walker for many years. Getch is thrilled to join URBAN and have the opportunity to work with his good friend Alexandra Steed once again. She is a former colleague and past director of operations at Martha Schwartz Partners (MSP). He also worked with her while at Aecom, where she was the principal in charge of the London Design Studio. URBAN is in the final stages of completing the new corporate headquarters of SKY TV Corporation (London) which is due to finish construction in late fall 2017. The firm also is delivering a multitude of mixed-use commercial and residential development projects in and around central London, a cancer research center in Wales, a series of playground sculptures in Shanghai, a 400-hectare Agricultural Park near Chongqing (China), an 18-hectare commercial/office development in Cairo and a landmark residential development in Weihai (China) with renowned architect Arata Isosaki. 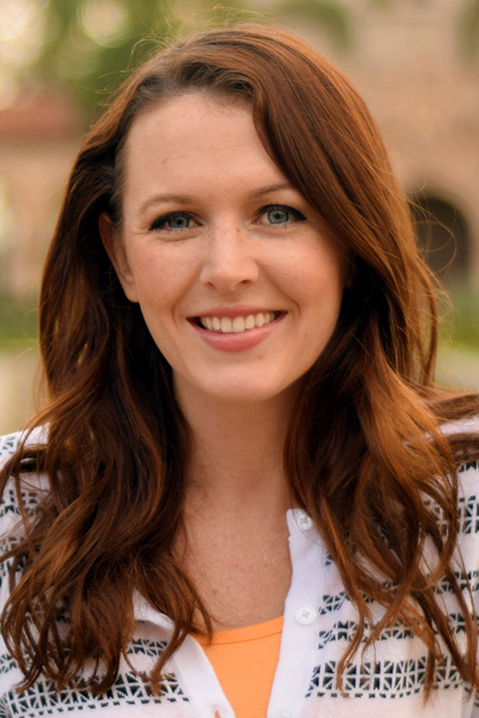 Madeline (Emmerson) Sturms (BS 2009 Community & Regional Planning) has been appointed the community development director for the City of Pleasant Hill. She will direct and participate in the preparation of the city’s comprehensive development plans and land-use ordinances; and supervise all functions of planning and building, communications, economic development and the parks and recreation division. 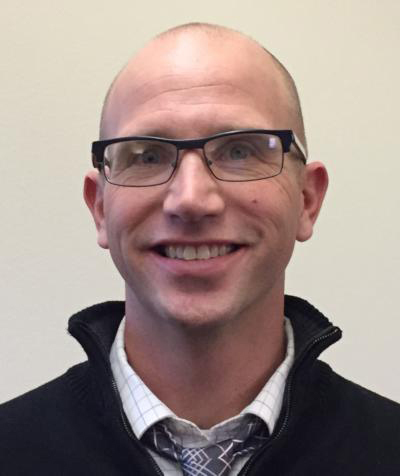 Sturms had served as a regional planner for the Southeast Iowa Regional Planning Commission in Burlington prior to joining Pleasant Hill as an associate planner and storm water coordinator in 2013. She was promoted to senior planner in 2015. She received a Master of Public Administration from Drake University in 2016. 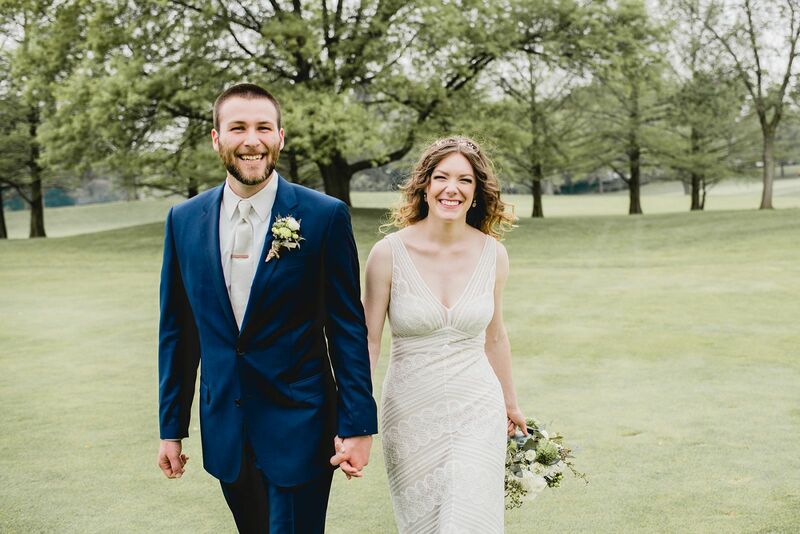 Outside of work, Sturms enjoys spending time with her husband, Ryan (BS 2009 Agricultural Biochemistry / PhD 2013 Biochemistry), and their rescue dog, Charlie. She likes to cook, travel and run, and she is an avid podcast listener. Dandi Zhang (BArch 2015 Architecture) is part of a team honored with a 2017 American Society of Landscape Architects Student Award in the Residential Design Category. 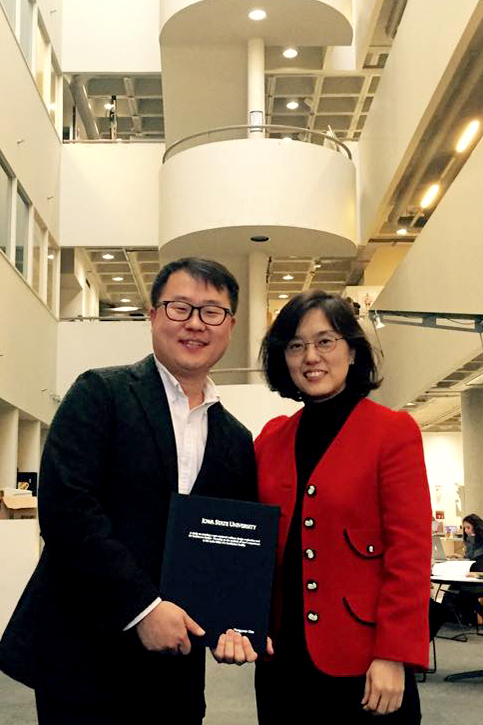 The team developed its winning project in a spring 2017 option studio at the Harvard Graduate School of Design, where Zhang received her MLA in May. They will be honored at the ASLA Annual Meeting and Expo Oct. 23 in Los Angeles. 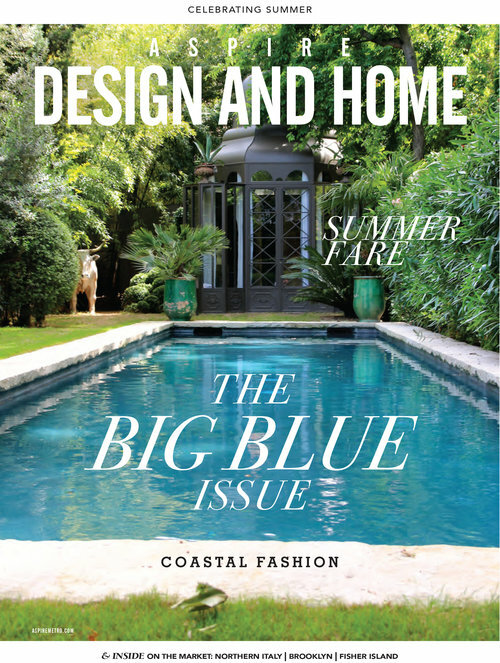 The project also is featured in the September issue of Landscape Architecture Magazine. 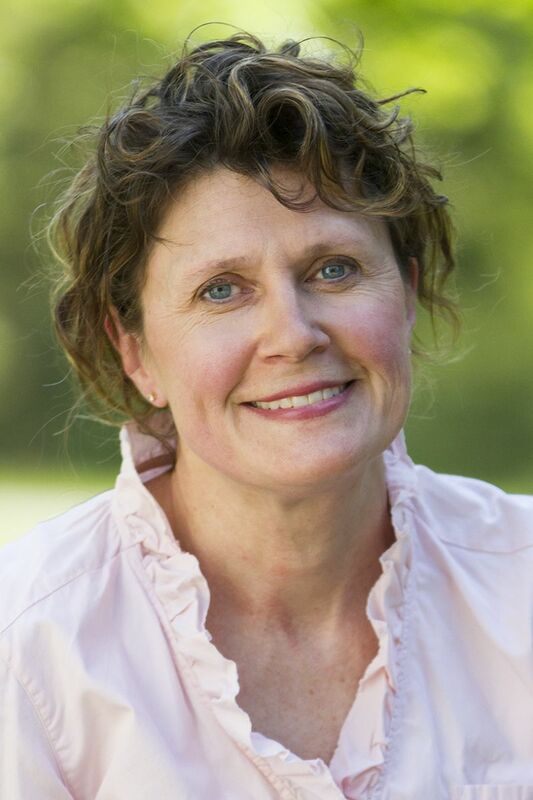 Lydia Sloan Cline (BA 1982 Architecture), a professor of computer-aided drafting and design at Johnson County Community College, Overland Park, Kansas, has had three books published by McGraw-Hill in the past two years: 3D Printing with Autodesk 123D, 3D Printing and CNC Fabrication with SketchUp and 3D Printer Projects for Makerspaces. One was published in Chinese and another in Korean. Other translations are in progress. 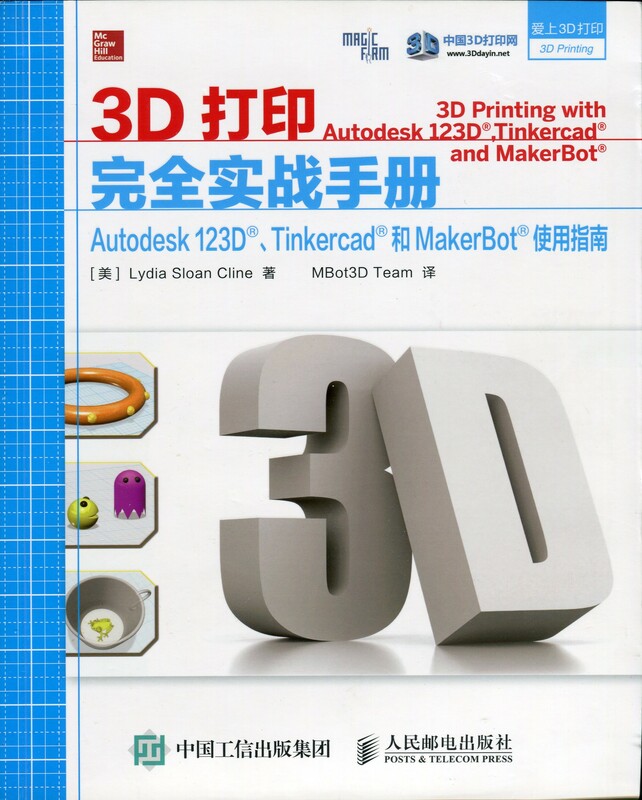 She is working on another book, Fusion 360 for Makers, to be published by Maker Media. 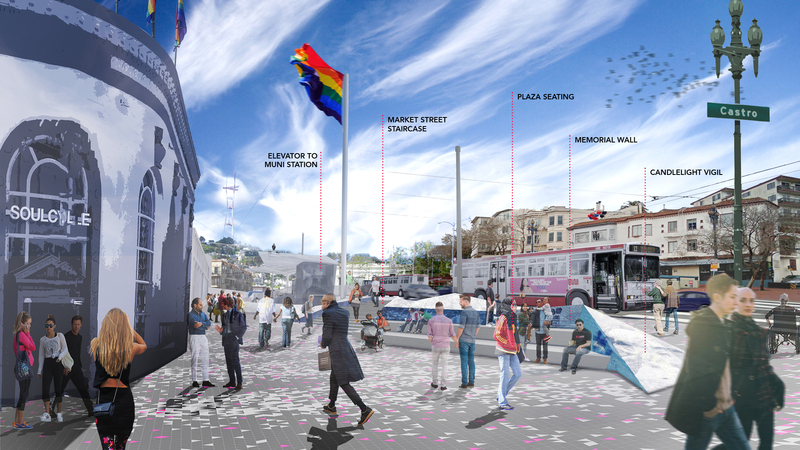 Brennan Cox (BLA 1999 Landscape Architecture) is a founding partner of Groundworks Office in Berkeley, California, which recently was shortlisted for the Harvey Milk Plaza Design Competition. The three finalists’ submissions are being reviewed by the community and a finalist will be selected in October, with the construction of the $10M plaza and memorial to start in 2019. 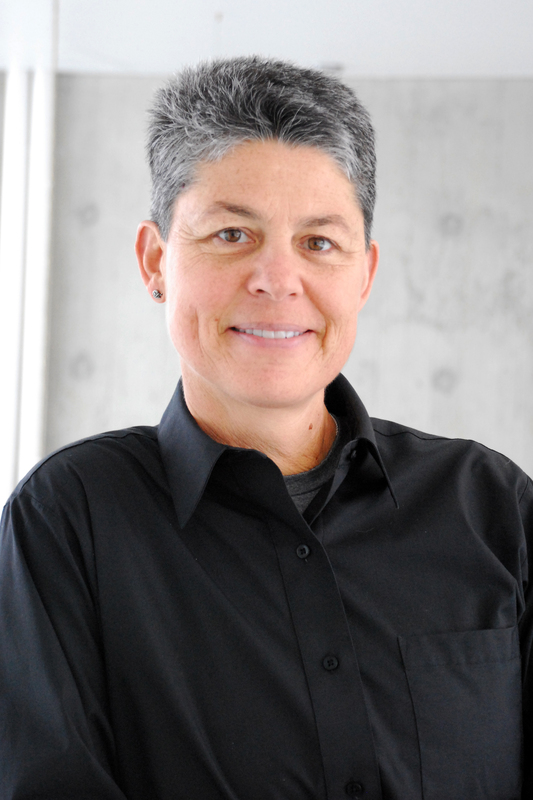 Lisa Orgler (BLA 1992 / MLA 2000 Landscape Architecture), a senior lecturer in horticulture at Iowa State University, is serving on the national board of directors for the Association of Professional Landscape Designers (APLD). 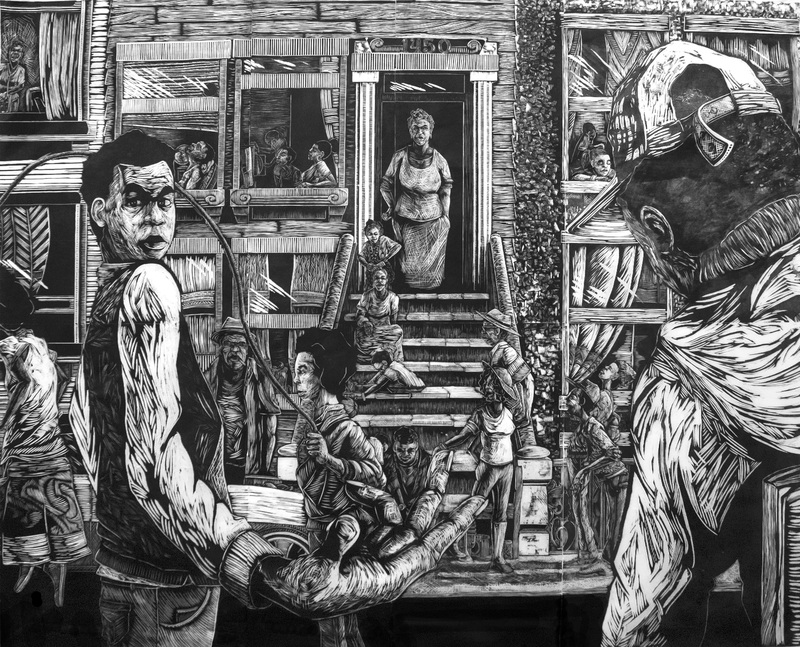 David Tim (BFA 2013 Integrated Studio Arts) received the Stinnett Philadelphia Museum of Art Collection Award (a purchase award) and the Jacqueline L. Zemel Prize for Printmaking (a cash award) in the Print Center’s 91st Annual International Competition. Awards were selected by jurors Kelly Baum and Jennifer Farrell of the Metropolitan Museum of Art. 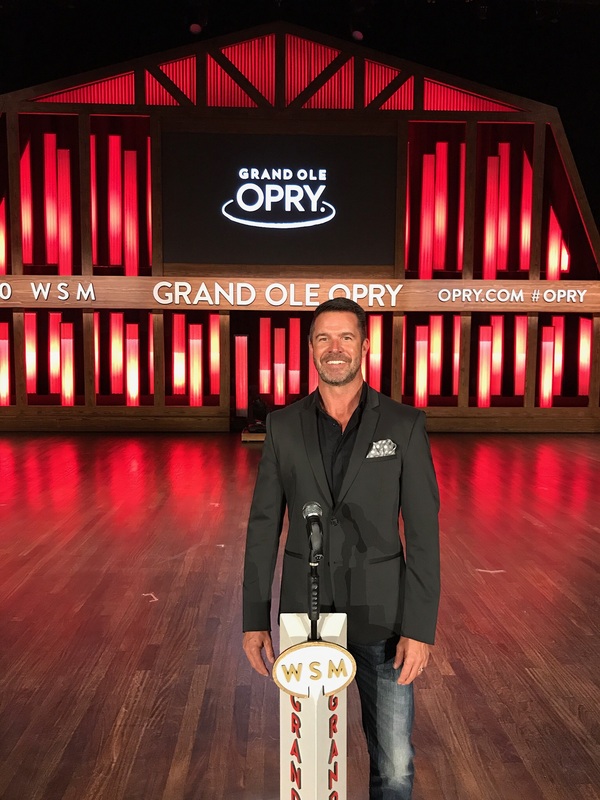 John Behling (BFA 1987 Graphic Design) recently moved from Los Angeles to Nashville to take a new position as chief marketing officer for Opry Entertainment Group. “What I found throughout my career is we have many creative options in terms of career path. I chose branding in business. Marketers can be left brain, right brain or a combination of both,” he says. 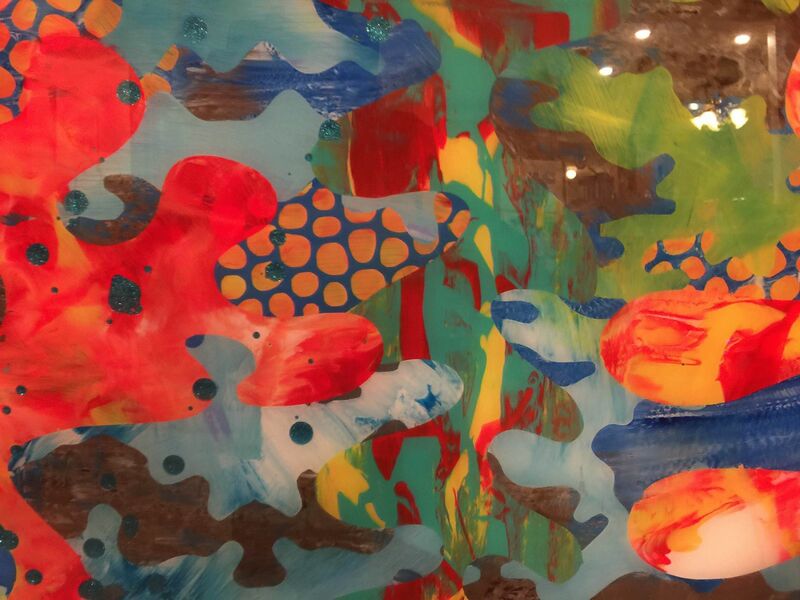 On the Beaten Path, an exhibition of artwork by Alexis Dwyer (MFA 2016 Integrated Visual Arts), is on display July 8 through Sept. 19 in the Iowa State Memorial Union Pioneer Room. A public reception will be from 6 to 7:30 p.m. Thursday, Sept. 14. 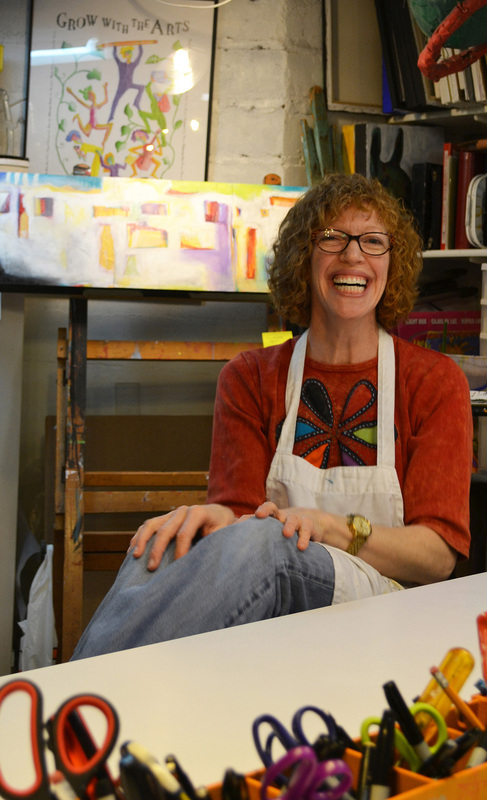 Dwyer also will lead a relief printmaking workshop from noon to 3 p.m. Saturday, Sept. 16. Troy Abel (MFA 2008 Graphic Design / PhD 2010 Human Computer Interaction) has accepted a position as an assistant professor of design at the University of North Texas, Denton, where he will develop a Human Centered Design (HCD) program at the undergraduate and doctoral levels as well as establish and direct a new eye-tracking and usability lab. 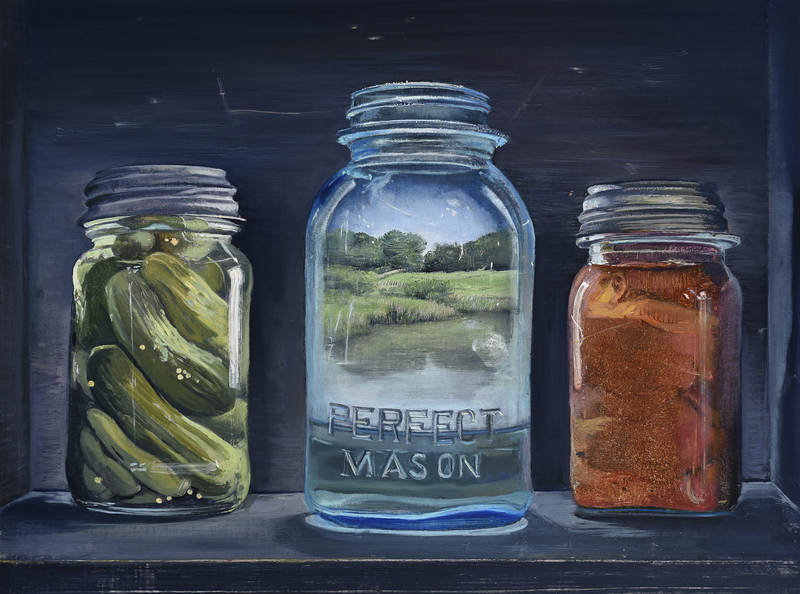 Naomi Friend (MFA 2013 Integrated Visual Arts) is a finalist for the 2017 Agriculture Art Exhibition sponsored by the Iowa Arts Council, Iowa Department of Agriculture and Land Stewardship and Iowa Farm Bureau Federation. Her work is on display Aug. 1-Oct. 30 at Cafe Baratta’s in the State Historical Museum in Des Moines. Awards will be announced Aug. 17 at the Iowa State Fair. 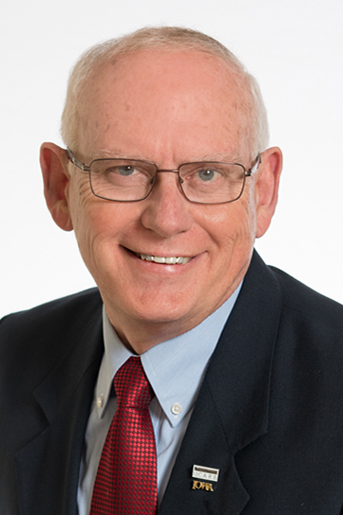 Terry L. Allers, AIA, NCARB (BArch 1970 Architecture), founder and president of Allers Associates Architects, PC, Fort Dodge, was elected second vice president of the National Council of Architectural Registration Boards (NCARB) at its 98th Annual Business Meeting. Allers previously has served in several positions on the NCARB board of directors, including his 2016-2017 term as treasurer. An active volunteer in the Fort Dodge community, Allers also serves on the board of directors for the local Downtown Development Corporation and was recognized with the Catalyst Award by the Fort Dodge Area Chamber of Commerce in 2012. He is also an active member of the American Institute of Architects and served on the AIA Iowa board of directors for three years as well as numerous AIA committees. Making a Scene: Jefferson Place, an exhibition curated by John Anderson (BFA 2000 Graphic Design / BFA 2001 Drawing/Painting/Printmaking), will be on display Sept. 5-Oct. 22 at the American University Museum in Washington, D.C. Anderson is an independent curator and freelance art critic who previously served as an associate professor of art and program coordinator of visual communication at Prince George’s Community College, a professional lecturer on new media at George Washington University, an adjunct associate professor at American University and an adjunct professor at George Mason University. 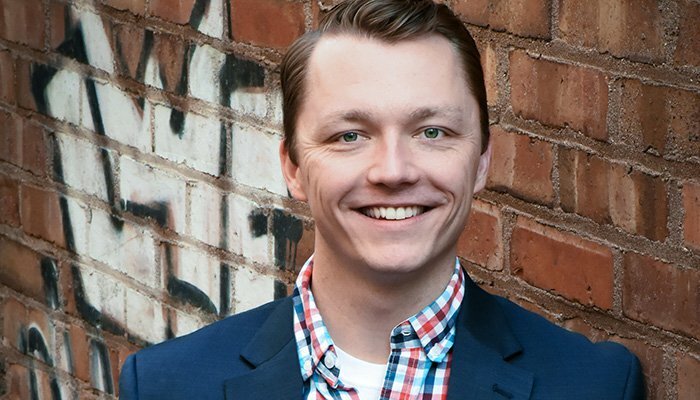 Brad Baer (BArch 2007 Architecture) is director of strategy for Bluecadet, an Emmy-winning digital studio based in Philadelphia that recently launched new websites for the World War II Museum and Denison University. 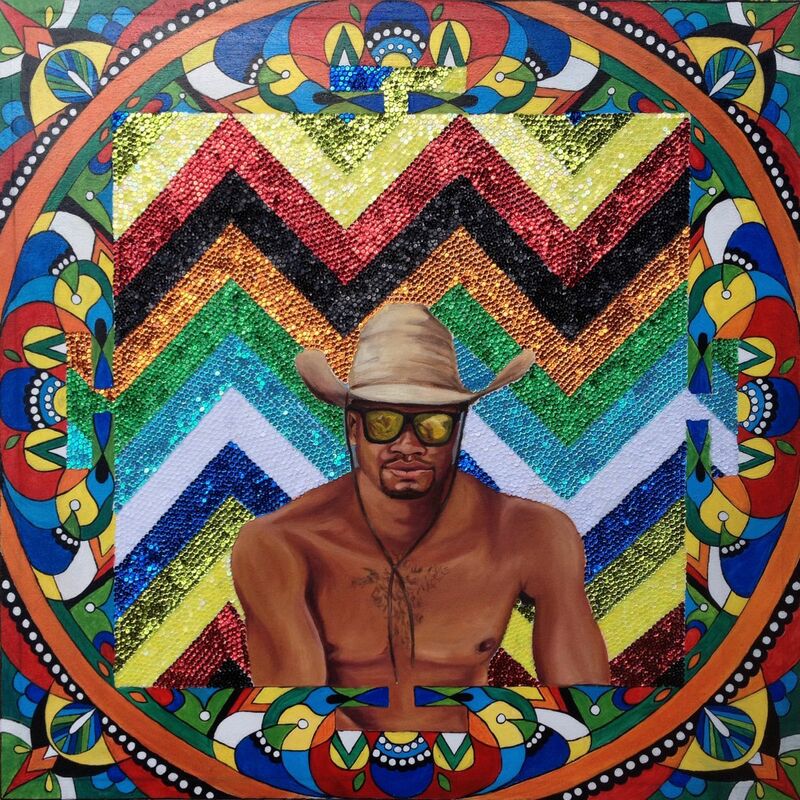 Artwork by Renelle White Buffalo (BFA 2011 Integrated Studio Arts) is part of HUMANNESS: A Group Show, independently curated by artist Marc Dennis, July 13 through Aug. 12 at Lyons Wier Gallery in New York City. The exhibition comprises work by seven emerging artists whose depictions of the complexities of emotion explore the concept of the essential and distinguishing attributes of being human. This is White Buffalo’s first NYC show. Artwork by Emily Williams-Wheeler (BA 1986 Interior Design) has been published in 1340 Art Magazine, 2017 Q3. “Weather Permitting” (36″x48″, mixed media) is featured on the cover, while “Amid the Confusion” (24″x24″, mixed media on wood panel), “Eclipsed” (12″x12″, wax on wood panel) and “Lint in My Pocket” (36″x48″, mixed media on canvas) appear on page 10. 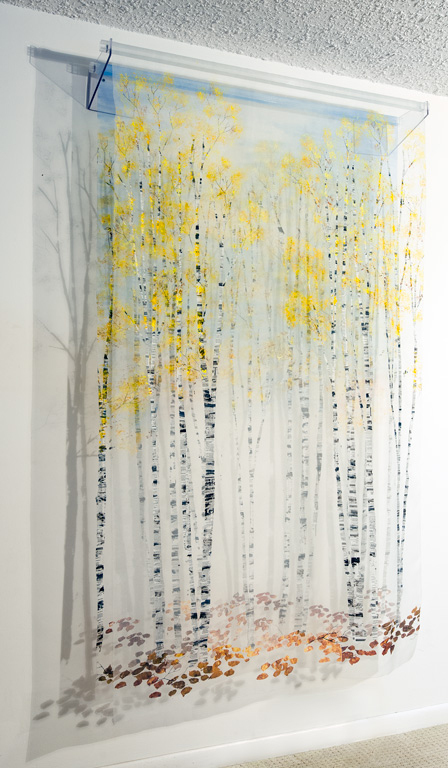 Williams-Wheeler, who practiced interior design for several years, today is a full-time professional artist who works in acrylics, graphite and encaustic. Kayla Meyer (BLA 2011 Landscape Architecture), an associate with DLR Group in Omaha, Nebraska, recently participated as an artist fellow for the Sandhills Institute, a catalyst for the creation of civically-engaged and integrated art in and around the agricultural community of Rushville, Nebraska. Through his company, Goche Inclusions, Peter Goche (BArch 1991 / MArch 2005 Architecture), an Iowa State University assistant professor of architecture, was part of the team that won Preservation Iowa’s 2017 Preservation at Its Best Award in the Large Commercial category for rehabilitation of the Walnut Tire – Globe Publishing Building in Des Moines. 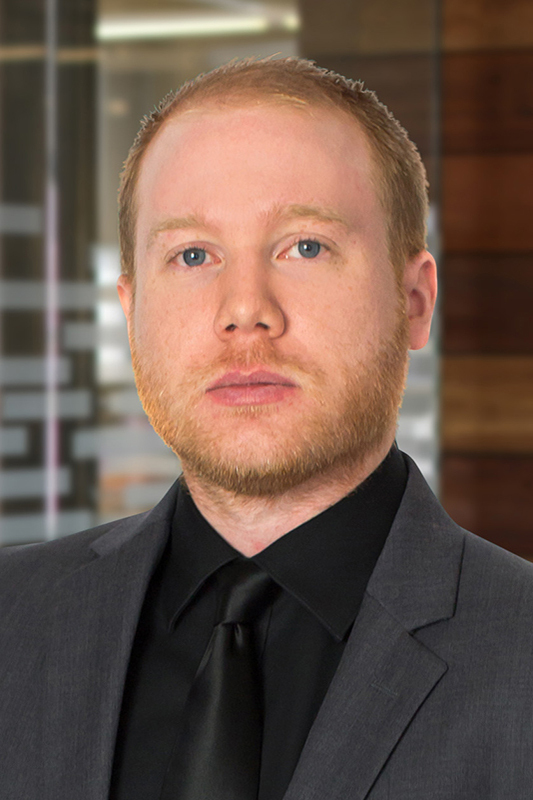 Justin McCarthy (BArch 2004 Architecture / Environmental Studies) is one of seven associates promoted to principal in Merriman Associates/Architects‘ Dallas office, in January 2017. He also was promoted to team leader. This marks only the second time in the firm’s 30-year history that principal status has been awarded to staff members. 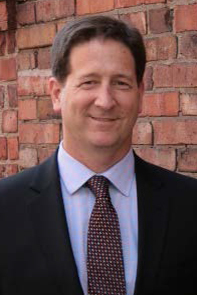 McCarthy currently oversees the development of a 1.4 million-SF mixed-use development in North Texas and has overseen projects in multiple job sectors, including, but not limited to, commercial office, multi-family adaptive reuse, sports and entertainment, historical preservation and industrial. Anna Jones (BArch 2011 Architecture) has started a full-service design company, MOD, which focuses on helping clients create beautiful spaces and structures to live, work and play, with the goal of making modern design accessible to all. Iowa Gov. 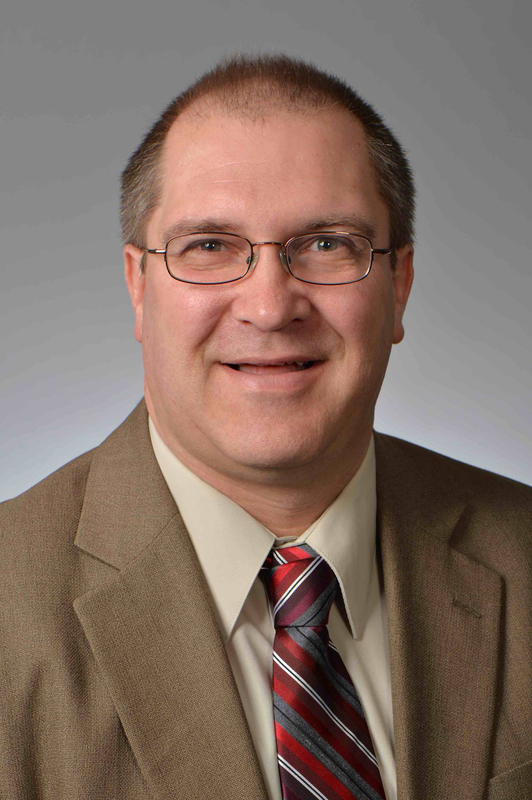 Kim Reynolds has appointed Mark Lowe (BS 1988 Community & Regional Planning) director of the Iowa Department of Transportation. He had served as interim director since November 2016. He previously was director of the IDOT Motor Vehicle Division. Seth Dreier (BLA 2006 Landscape Architecture), ASLA, PLA, LEED AP, a project architect with Mariani Design Studio in Lake Forest, Illinois, won a Merit Award from the Illinois Chapter of the American Society of Landscape Architects for the design of his “Craftsman Cottage” project (see pages 32-33 in the linked publication). 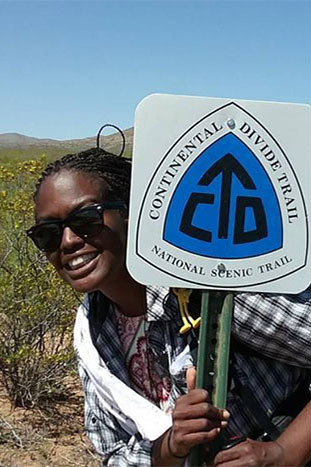 Elsye Walker‘s (BS 1995 / MCRP 1998 Community & Regional Planning) love affair with hiking and her inspiration to complete the Continental Divide Trail this year are featured in the ISU Alumni Association’s Cyclone Stories. You can follow her adventures on her blog and on Instagram at @elsyew. J. 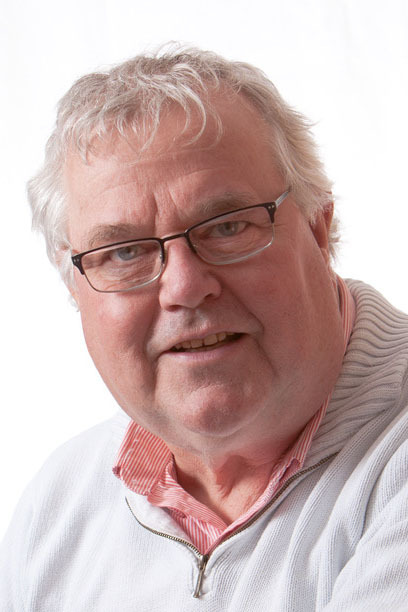 Mark Schmidt (BArch 1971 / MArch 1974 Architecture) has retired from full-time work after seven years as a senior architect specializing in writing construction specifications at Invision Architecture in Des Moines. 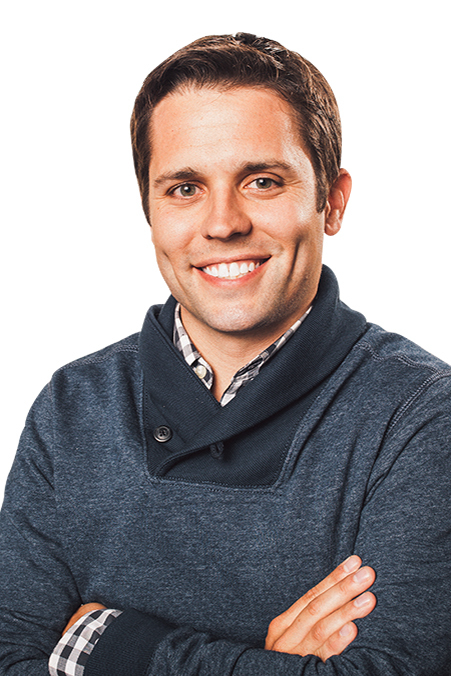 Schmidt will continue to work part time at Invision. Most of his career was with Charles Herbert and Associates and HLKB Architecture, also in Des Moines. 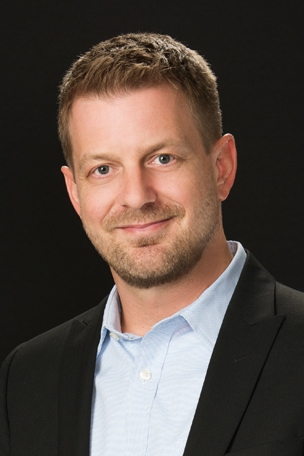 Shane Larsen (BArch 2002 Architecture), AIA, NCARB, has been elected to the Schemmer Associates board of directors. With more than 15 years of experience, Larsen leads the firm’s senior living and healthcare markets in the architecture division. 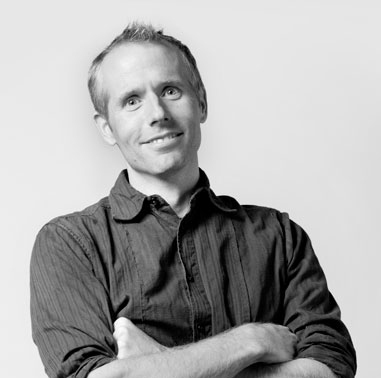 Larsen is a licensed architect in Iowa, Texas and North Dakota. 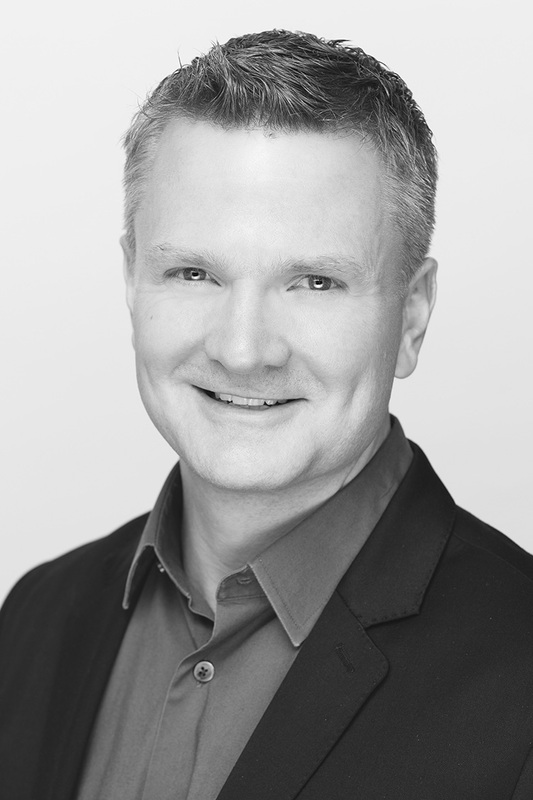 He serves as co-chair for the AIA Iowa Design for Aging Knowledge Community and was a past NCARB committee member for the Architect Registration Examination® (ARE®). He also serves as an architectural mentor and volunteer for Iowa State University. Schemmer is a full-service architecture, engineering and construction field services consultant providing responsible solutions for complex design and construction-related challenges. Headquartered in Omaha, Nebraska, Schemmer has regional offices in Lincoln, Nebraska, Des Moines and Council Bluffs; as well as in Tulsa and Oklahoma City, Oklahoma. 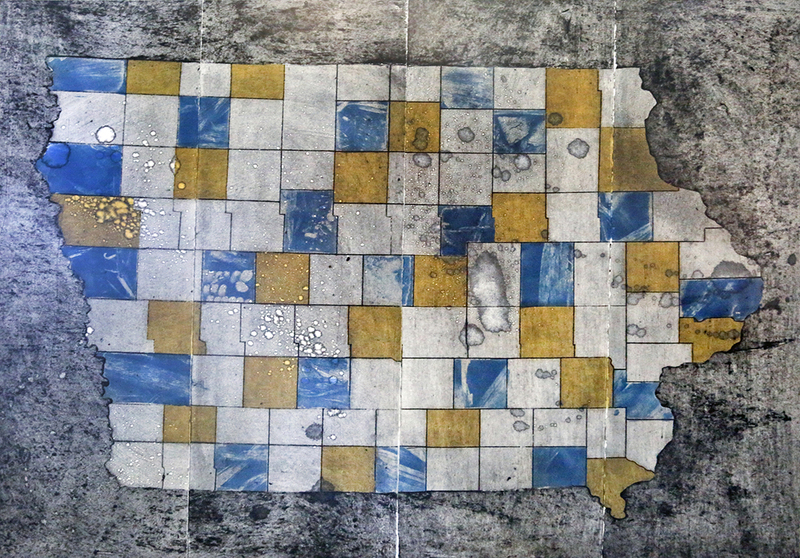 Restless Tenants, an exhibition of cyanotype-and-tea prints by Naomi Friend (MFA 2013 Integrated Visual Arts), is on display through August at the State Law Library in Des Moines. Hours are 9 a.m. – 4:30 p.m. weekdays. World-renowned artist Jeremy Caniglia (BFA 1993 Art & Design – Drawing, Painting, Printmaking), a fine arts teacher at Creighton Preparatory School and at the Joslyn Art Museum’s Kent Bellows Center for Visual Arts, both in Omaha, Nebraska, has been accepted for a four-month apprenticeship with figurative master Odd Nerdrum at his studio in Stavern, Norway. 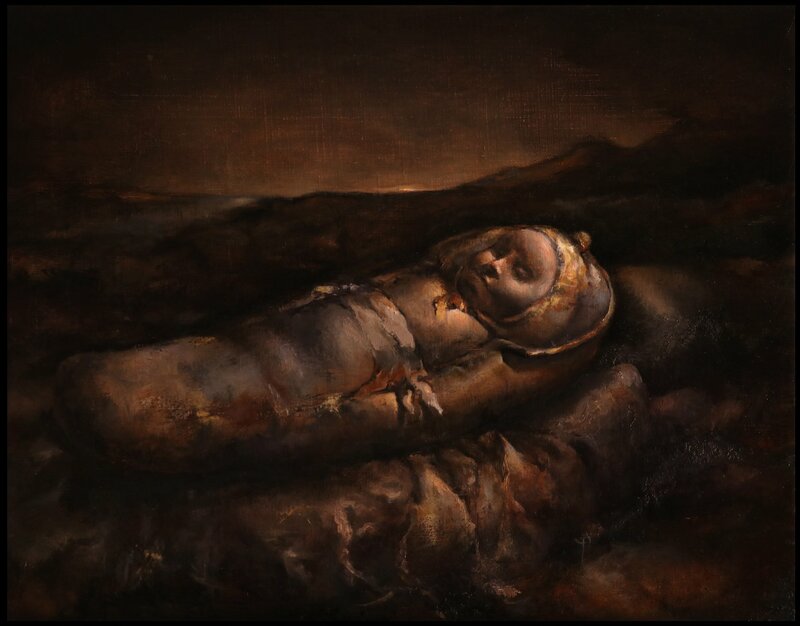 Like Nerdrum, Caniglia is known for his emotionally charged and often unsettling work, which focuses on the human condition. Striking, illuminating, foreboding, offensive, haunting and always poignant, Caniglia’s paintings wallow in the glories of expansiveness and of timeless places. 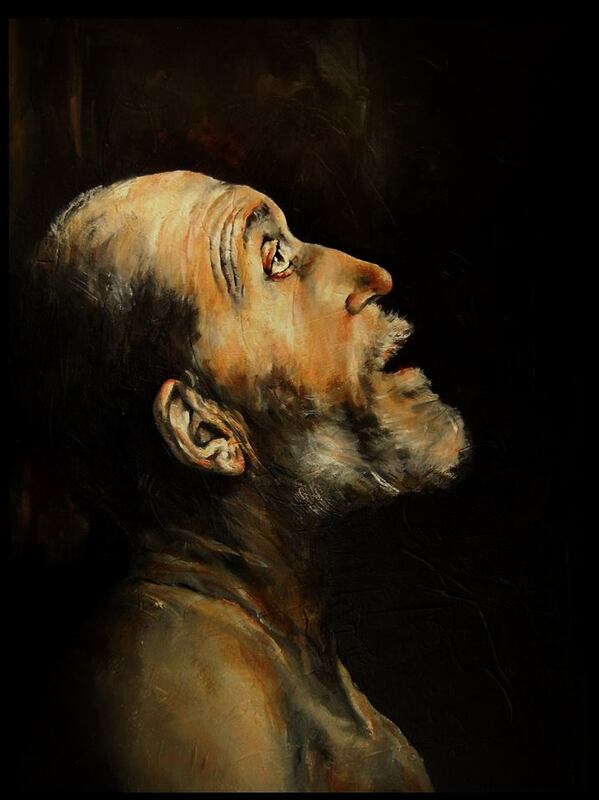 His work is showcased in private collections around the world and exhibited in solo and group fine art exhibitions at museums and galleries that include the Society of Illustrators, the Allentown Art Museum, the Walters Art Museum, Salmagundi Gallery in NYC, Coprogallery, Paul Booth-Last Rites Gallery and the Joslyn Art Museum. An exhibition of Caniglia’s new works will be installed at the Union for Contemporary Arts and other galleries upon his return to the United States. Read more on Caniglia’s blog and Facebook page. The premiere performance of “Cassils: Monument Push” — curated by Alex Priest (BLA 2011 Landscape Architecture) — will take place from 4 to 8 p.m. Saturday, April 29, at the Bemis Center for Contemporary Arts in Omaha, Nebraska. The performance involves pushing a 1,300-pound bronze monument to locations in downtown Omaha where acts of violence, trauma, celebration, resistance and resilience occur with the LGBTQI+ community. 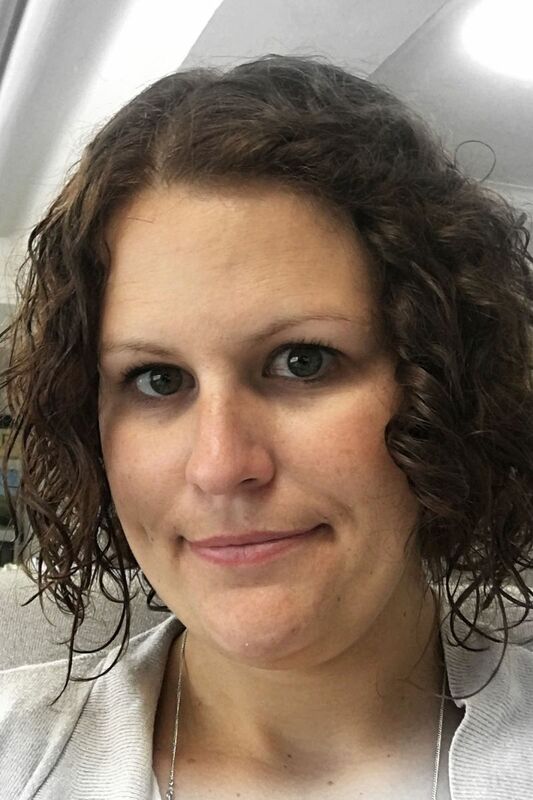 Brittni (Heisterkamp) Pertijs (BFA 2007 Graphic Design) recently moved from Amsterdam, The Netherlands, where she was a graphic designer with Nike Global Football Apparel, into a color, material and finish designer role within Whirlpool Corporation in Benton Harbor, Michigan. 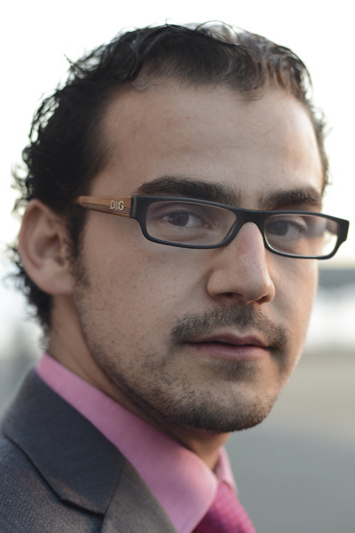 By day, Mohamad Hafez (BArch 2009 Architecture) is an architect with Pickard Chilton in New Haven, Connecticut. In the evenings, he reconstructs the landscapes and cities of his native Syria in miniature, channeling his emotions about that country’s civil war into 3-D replicas of “gutted apartment complexes” and other scenes of chaos and destruction. 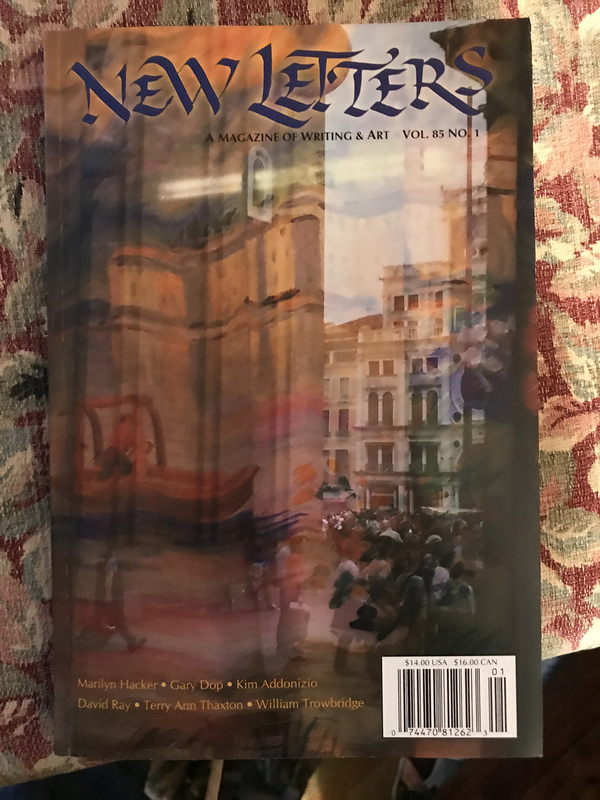 His work is on display in HOMELAND inSECURITY, a solo show April 2-30 at the Lanoue Gallery in Boston, and highlighted in an April 4 article in The New Yorker. An artist’s talk and reception will be from 5 to 8 p.m. Thursday, April 13, at the gallery. Jen (DeWall) Cross (BLA 2009 Landscape Architecture), PLA, ASLA, CLARB, a landscape architect with RDG Planning & Design in Omaha, Nebraska, has been recognized as a 2017 Iowa STATEment Maker by the Iowa State University Alumni Association. Carrie Matlock (BArch 1994 Architecture), AIA, NCARB, LEED AP BD+C, has been promoted to president of DLA Architects in Itasca, Illinois. 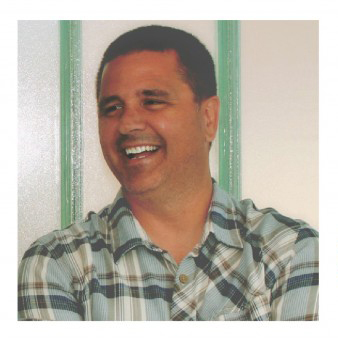 Matlock joined DLA (then known as Dahlquist and Lutzow Architects) as an architect intern in 1995. She was promoted to job captain in 1997 and soon after to project manager. In 2007, she became the firm’s first woman partner and vice president. Six years ago, Matlock began a tradition for DLA; the team annually takes a client to Learning Environments for Tomorrow (LEFT), a program jointly designed by the Harvard Graduate School of Education and the Harvard Graduate School of Design, where they collaborate with educators and architects around the world and learn more about the connection between the built environment and the educational delivery process. This helps DLA educate its clients on how innovative design can enhance learning. Pamela Abalu (BArch 2001 Architecture), chief architect and global head of design and construction at MetLife Inc. in New York City, is highlighted in the April 2017 issue of Real Simple magazine, pages 105-106 (go to 94-95 on the slider bar at the link provided). Harmony in the City, an exhibition curated by Jasmine Singh (BArch 2012 / MS 2015 Architecture) and Jassim Al Nashmi (BArch 2013 Architecture), was exhibited in February at Masaha 13 in Industrial Shuwaikh, Kuwait. 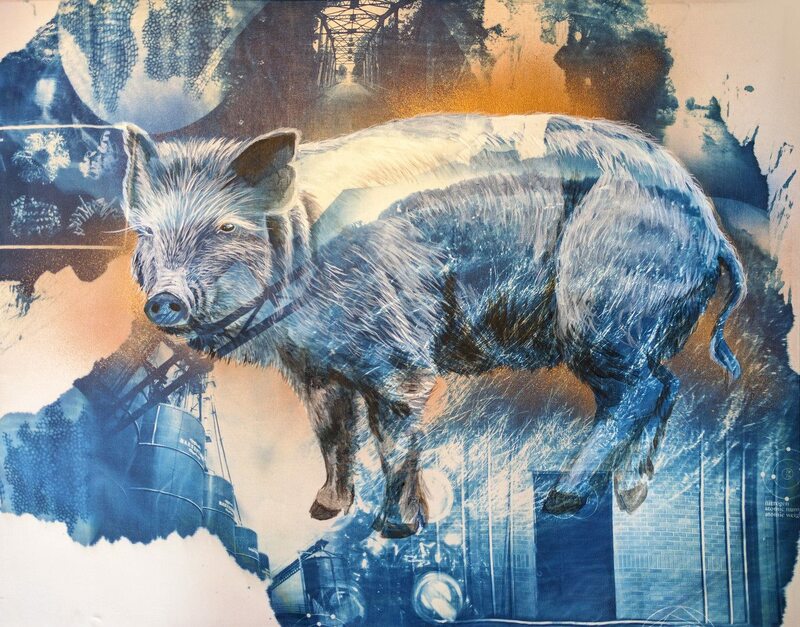 The show brought together artists addressing pressing issues of food systems, human experience, transportation, climate change, energy and environmental depletion to initiate conversations on urban issues at global and individual scales. Singh teaches three-dimensional design at the American University of Kuwait and Al Nashmi is an architect at Pace Architecture Engineering + Planning, Hawalli, Kuwait. 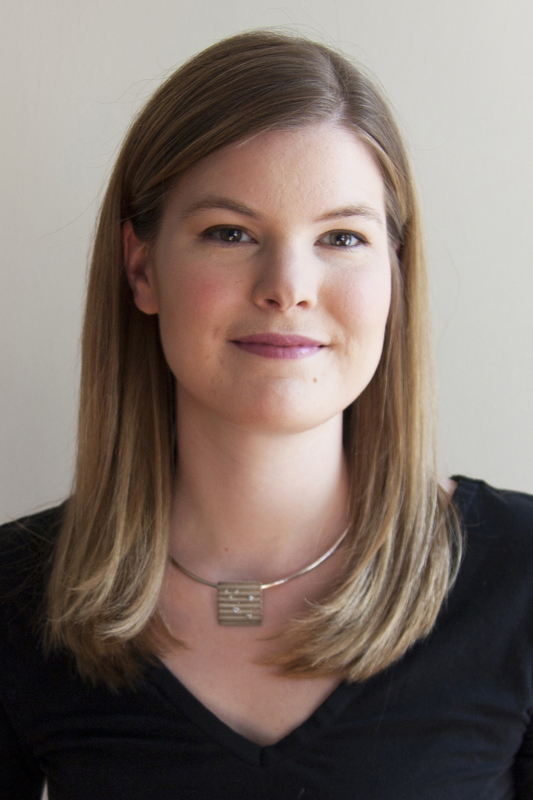 Danielle Hermann, AIA (BArch 2001 / MArch 2008 Architecture), an associate principal at OPN Architects in Des Moines, is a recipient of the 2017 AIA Young Architects Award from the American Institute of Architects. This national award recognizes individuals who have shown exceptional leadership and made significant contributions to the profession early in their architectural careers. She will be recognized at the 2017 AIA Conference on Architecture April 27-29 in Orlando, Florida. 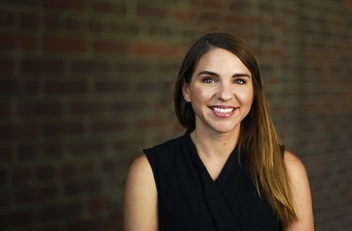 Michelle (Pinkston) Ohle, ASLA, PLA, LEED AP (BLA 2005 Landscape Architecture), an associate principal with [dtls] studio, received the inaugural Emerging Young Professional Award from the St. Louis Chapter of the American Society of Landscape Architects. The award acknowledges the contributions of a young landscape architect to the profession. Nominees must be 35 years of age or younger and members of ASLA St. Louis. Ohle joined [dtls] in January 2016 following nearly a decade at HOK. She began her career as a junior landscape architect with Thomas Balsley Associates. David Tim (BFA 2013 Integrated Studio Arts) has been named one of 12 finalists out of 400 applicants in the Print Center 91st Annual International Competition. Artists awarded solo exhibitions will be announced later in February. The Kimberley Collection, a new range of high-traffic outdoor furniture designed by Kristin Lewis (BS 2006 Apparel, Merchandising, Design & Production / MA 2010 Interior Design), was launched this month. It is sold by D.M. Braun & Co. out of Irvine, California, and is fabricated locally. Lewis works full time in commercial real estate development and designs furniture, spaces and more on weekends through her business, Sway Concepts. 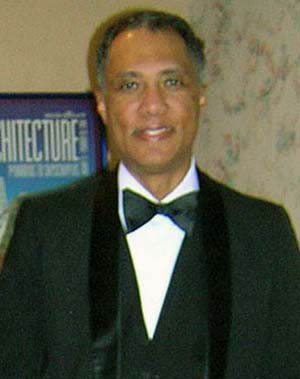 Bernard I. Jones, FAIA (BS 1957 Architectural Engineering), retired from active architectural practice and moved with his wife, Jane, from Carbondale, Illinois, to Waverly to be near family in the Waverly and Des Moines areas. Using white-painted steel and colorful string for its latest art shanty entry called “String Box Shanty,” NewStudio Architecture is encouraging hands-on interaction with its design during the Art Shanty Projects On-Ice Program, weekends from 10 a.m. to 4 p.m. Feb. 4-26 on White Bear Lake, Minnesota. The collaborative art installation will react to the ever-changing environment of the lake and its surroundings and showcase the effect of human touch. Visitors will thread string through steel washers welded to the 7 ft. x 7 ft. frame, creating unique patterns in a maze of overlapping colors. The structure is built with hinged triangles that can open like flaps on an envelope to add even more structural interest. The designers hope that reflective strips on the frame and glow-in-the-dark parachute cord in the lower triangles will create a unique nighttime effect as well. “Our team appreciates the Art Shanty Projects’ mission to create artist-audience interaction in a friendly, accessible way. Our two previous projects invited participation but this design pushes the concept to a new level. We don’t even know what this shanty will look like in the end. It’s totally dependent on how visitors thread the strings and if nature adds precipitation or not,” said Sean Wagner, CEO/president of NewStudio Architecture (BArch 1991 Architecture). 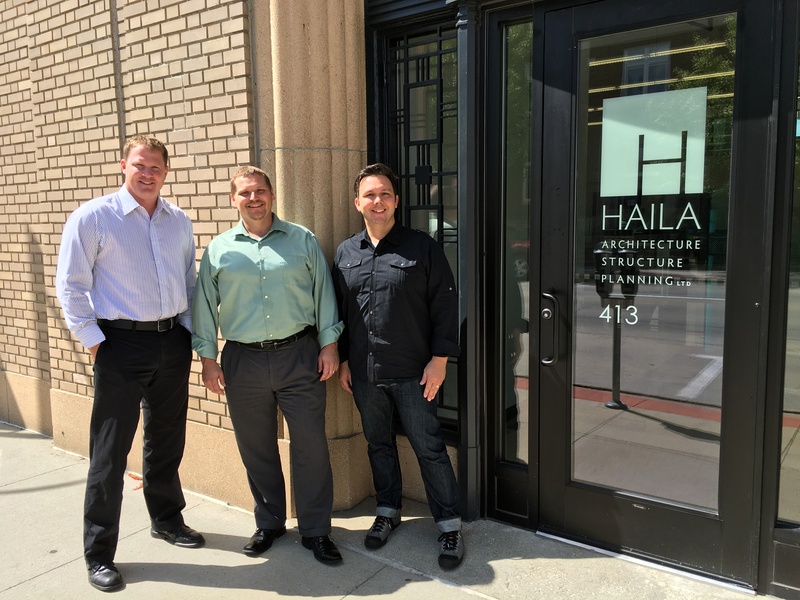 The ownership of the Ames-based architecture firm Haila Architecture Structure Planning transitioned in the fall of 2016. Three long-time employees, Sam Stagg (BArch 1998 Architecture), Eric Vermeer (MArch 2004 Architecture / MS 2005 Civil Engineering) and Chad West (BArch 1998 Architecture), purchased the assets and rights of the company from founder John Haila. “We are excited to build upon the strong foundation John has laid with fresh leadership and new opportunities,” Stagg says. The office recently moved and is now located in downtown Ames. 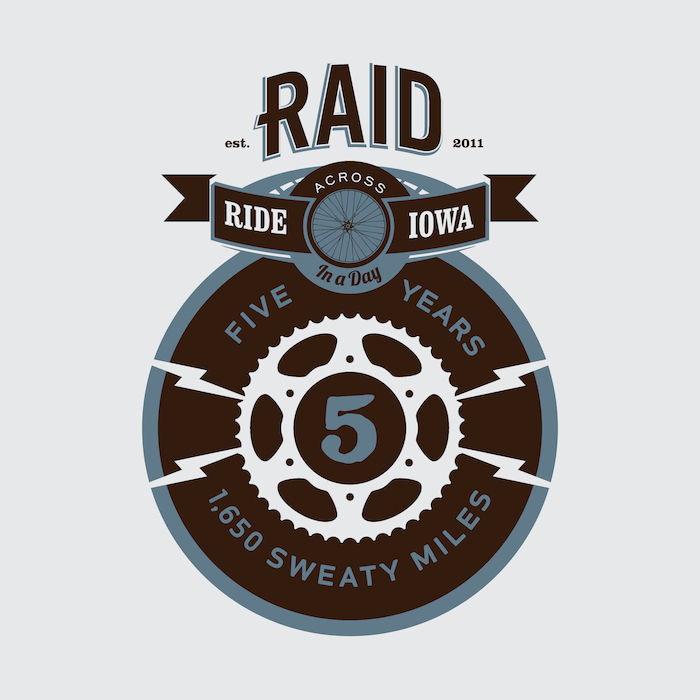 Cory Witt (BFA 2012 Graphic Design), a designer with Flying Hippo Brand + Digital in Des Moines, was recognized for a project completed for RAID (Ride Across Iowa in a Day) in Print magazine’s Regional Design Awards 2016: Midwest category (see no. 51). 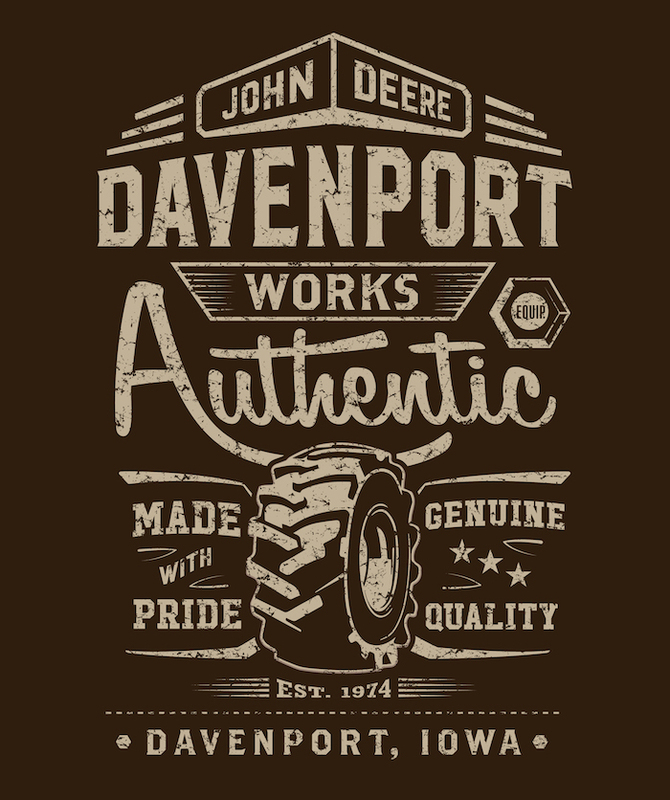 Paige Winters (BFA 2013 Graphic Design), a graphic designer with Grey Dog Media USA in West Des Moines, was on a team recognized for its “John Deere Factory Shirts” in Print magazine’s Regional Design Awards 2016: Midwest category (see no. 31). 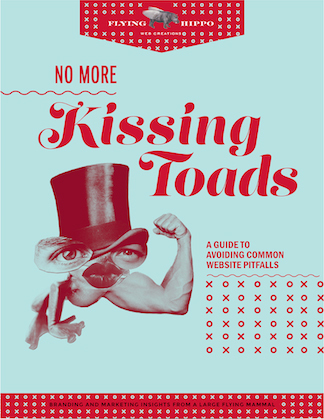 John Anderson (BFA 2009 Graphic Design) and Annie Eischen (BFA 2014 Graphic Design), designers with Flying Hippo Brand & Digital in Urbandale, were on a team recognized for their “Inbound Marketing E-books” in Print magazine’s Regional Design Awards 2016: Midwest category (see no. 28). 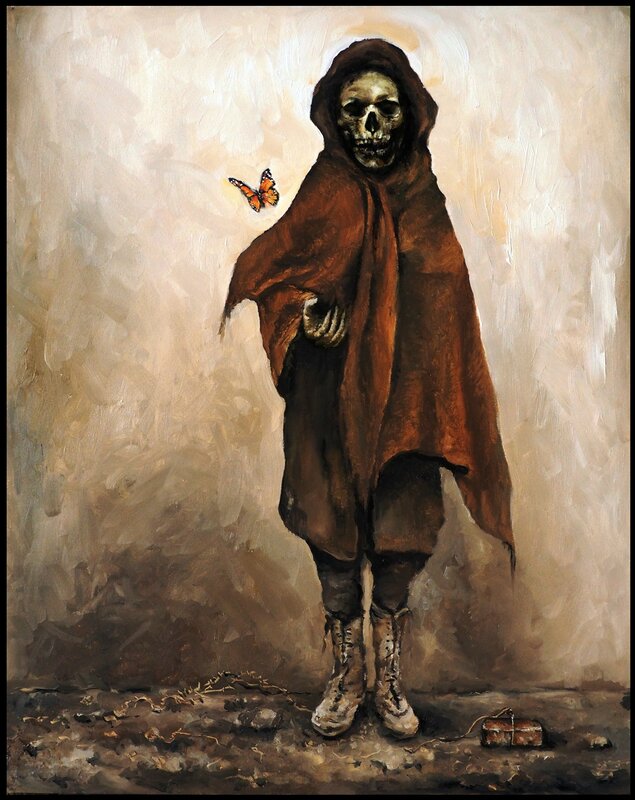 “Where humanity failed, death unveiled the metamorphosis of the dystopian dream,” an oil painting by Jeremy Caniglia (BFA 1993 Art & Design – Drawing/Painting/Printmaking), was selected for publication in Infected by Art Volume 5. Yongyeon Cho (MFA 2016 Interior Design) received the 2016 AAHID (American Academy of Healthcare Interior Designers)/Steelcase Health Graduate Research Fellowship. The $7,500 fellowship grant will support Cho’s continuing research into his master’s thesis topic on creating a user-centered wellness design evaluation tool for the main lobby of a healthcare facility. It will also fund his travel to present his research at the 2017 Healthcare Design Conference Nov. 11-14 in Orlando, Florida. Cho graduated with his MFA in December 2016 and is now an interior design intern with HOK in Chicago, Illinois. Alex Priest (BLA 2011 Landscape Architecture), the exhibitions manager for the Bemis Center for Contemporary Arts in Omaha, Nebraska, is curating an exhibition and performances with Los Angeles-based artist Cassils. 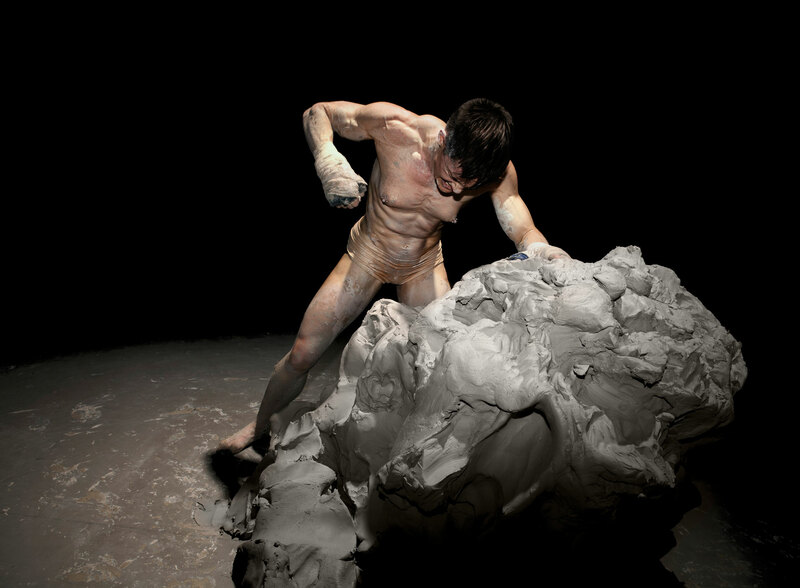 Cassils: The Phantom Revenant explores concerns of unseen violence and trauma against gender non-conforming bodies. 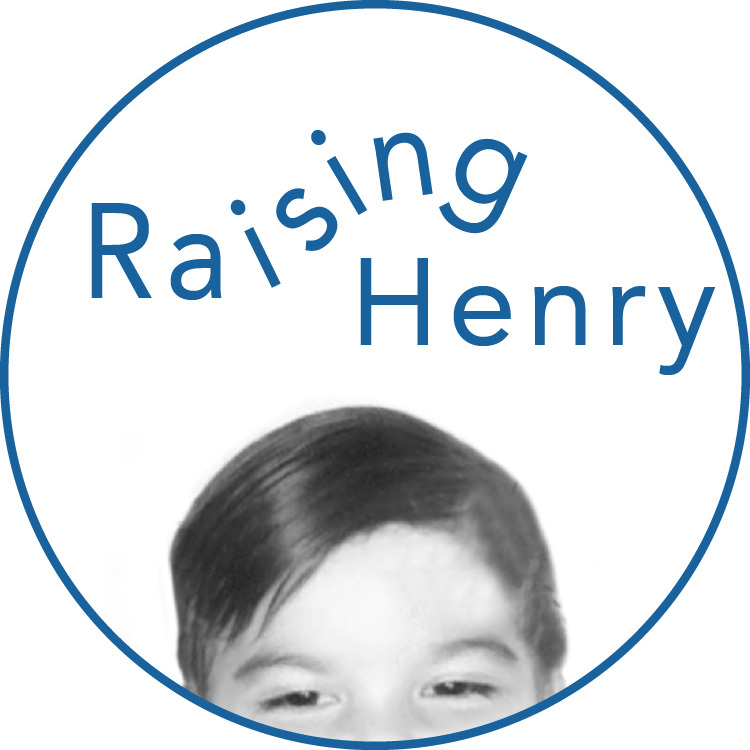 The show will run Feb. 2 through April 29 at the Bemis Center. 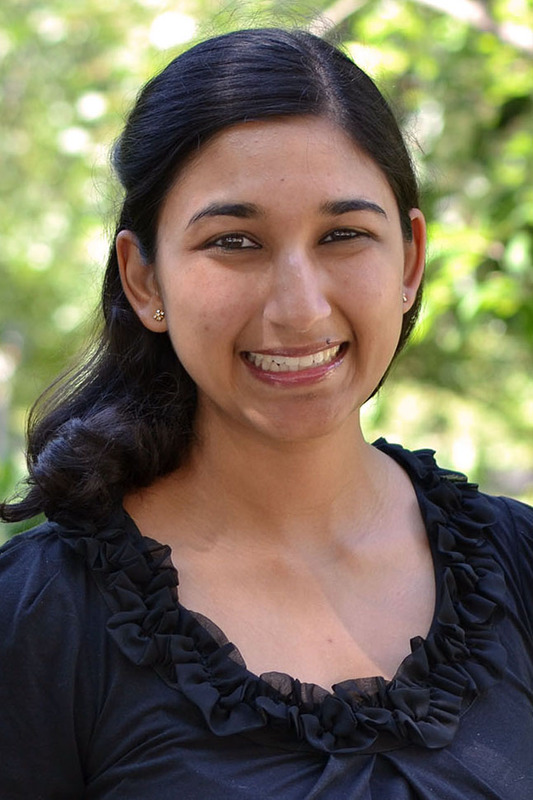 Akshali Gandhi (BS 2012 Community & Regional Planning / International Studies) is now employed as an associate transportation planner at NelsonNygaard Consulting Associates, Washington, D.C.
Rachel Tokarczyk (BFA 2016 Interior Design) is an interior design assistant for Tiffany Brooks Interiors, Grayslake, Illinois. Brooks is an HGTV host and interior designer. “Uprooted,” an exhibition of photography by Kristine Heykants (BFA 1988 Art & Design), is on display through Tuesday, Jan. 31, in the Pioneer Room at the Iowa State Memorial Union. A reception will be from 7 to 9 p.m. Wednesday, Jan. 18, with a gallery talk by Heykants at 7 p.m.
“Works by Jon P. Baldwin“ (BFA 1996 Art & Design) are on display Jan. 1 through Feb. 25 at the Gallery in the Round, Unitarian Universalist Fellowship of Ames. The show includes paintings and photographs. Winsight Media, a recent project by Jessie James (BFA 2007 / MFA 2009 Interior Design), NCIDQ, project manager for Whitney Architects, has been published on Chicago Creative Space. 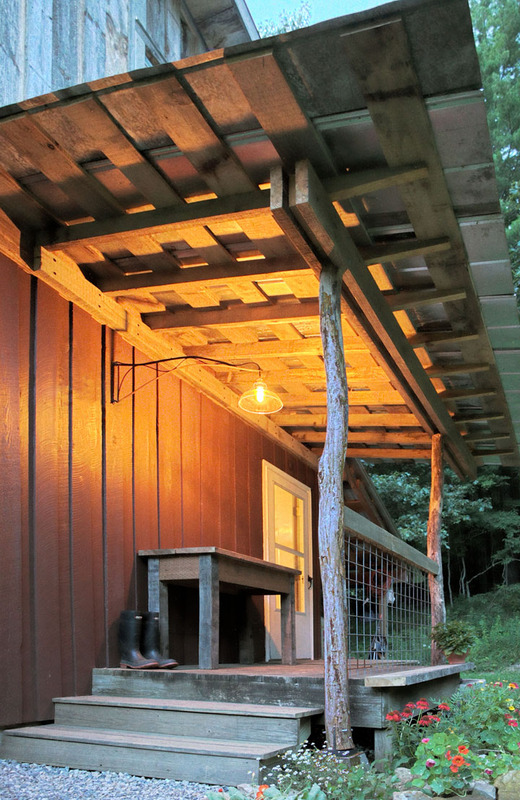 Studio Breithaupt, owned by Claude Breithaupt, AIA (BArch 2008 Architecture), received a Design Citation in the Detail category at the 2016 AIA Blue Ridge Design and Honor Awards for a project constructed almost entirely of reclaimed and recycled materials. Studio Breithaupt was commissioned for more than $1 million in residential and commercial projects in its first year of operation and currently is involved in several high-end residential projects throughout the Appalachian region. Breithaupt also was selected as one of AIA Virginia’s Emerging Leaders in Architecture Class of 2017. Leila Ammar (BArch 2012 Architecture) will graduate with a Master of Business Administration from Iowa State University this month (Dec. 17, 2016). She also was named MBA Student of the Year, an honor determined by the MBA program’s core faculty members. She is a registered architect with Haila Architecture in Ames. Renelle White Buffalo (BFA 2011 Integrated Studio Arts) has been accepted into the Jentel Artist Residency Program in Banner, Wyoming, Feb. 15 through March 13, 2017. A solo exhibition of her work at the Journey Museum & Learning Center in Rapid City, S.D., will open May 26, 2017. Adrienne Nelson, Assoc. AIA (BFA 2009 Interior Design / MArch 2013 Architecture), a designer with Pickard Chilton in New Haven, Connecticut, received the AIA Connecticut Emerging Architect Award. This award recognizes and supports emerging, graduate architects who have made outstanding, innovative contributions to their practice or profession or have rendered distinguished service in the public realm. Laura Waller (BFA 2013 Interior Design), interior designer with the Opus Group, Minneapolis, Minnesota, designed the interior spaces of Iowa State University’s new Geoffroy Hall, which will house 784 students and be completed for the 2017 spring semester. Waller will attend the formal ribbon-cutting ceremony on Jan. 17, 2017, together with former ISU President Gregory Geoffroy and current President Steven Leath. 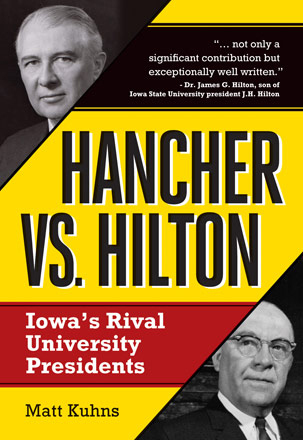 Matt Kuhns (BFA 2000 Graphic Design) has published Hancher vs. Hilton: Iowa’s Rival University Presidents, a new book about Iowa State University during James Hilton’s presidency and the multi-year conflict with Virgil Hancher’s University of Iowa during that period. The book is the product of extensive research at the Iowa State and University of Iowa archives as well as interviews with Hilton’s son, James G. Hilton, and various scholars. Peggy Bang (BA 1972 Art Education) of Mason City, author of The Melson House Revealed: An Owner’s Perspective, recently spoke at two events sponsored by the Walter Burley Griffin Society of Australia. Bang presented the seventh annual Marion Mahony Griffin Lecture at the National Archives in Canberra, Australia. The first American invited to address the society in this prestigious lecture, Bang spoke about the history of the Melson House — designed by the Griffins — and its restoration. Bang also spoke about the house in a lecture in Castlecrag, an inner-ring suburb of Sydney, Australia. Bang is a board member of the Walter Burley Griffin Society of America and vice president of the MacNider Art Museum Foundation. Cory Witt (BFA 2012 Graphic Design), a designer with Flying Hippo Brand + Digital in Des Moines, was recognized in the Print Magazine 2016 Regional Design Annual for a project completed for RAID (Ride Across Iowa in a Day). The project will be featured in the Print Magazine Winter 2016 issue, which ships in December, and the 2016 Regional Design Annual website. 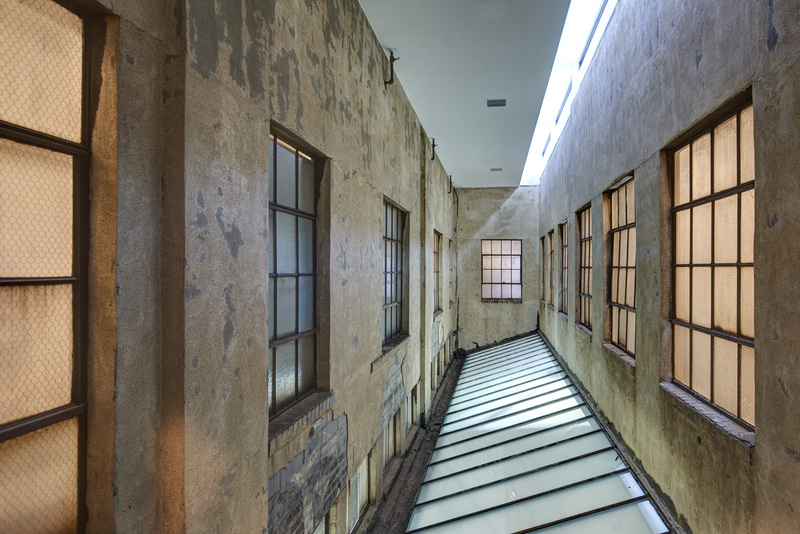 A restoration project designed by Studio 31a under the direction of principal A. Elizabeth Ortner (BFA 1995 Interior Design), AIA, LEED AP, received a Chicago Landmarks 2016 Preservation Excellence Award. A Queen Anne-style single-family home in the Kenwood Historic District was restored to its intended beauty. Jim Del Carpio (BLA 1997 Landscape Architecture / Environmental Studies), principal of JDC Designs and Consulting Services, is now the construction project manager of SQLA Landscape Architecture and Landsit Group in Los Angeles, Calif.
“Crossroads,” a sculpture by Jo Myers-Walker (MA 1980 Art Education), has been installed in a section of skywalk on Third Street SE in downtown Cedar Rapids. 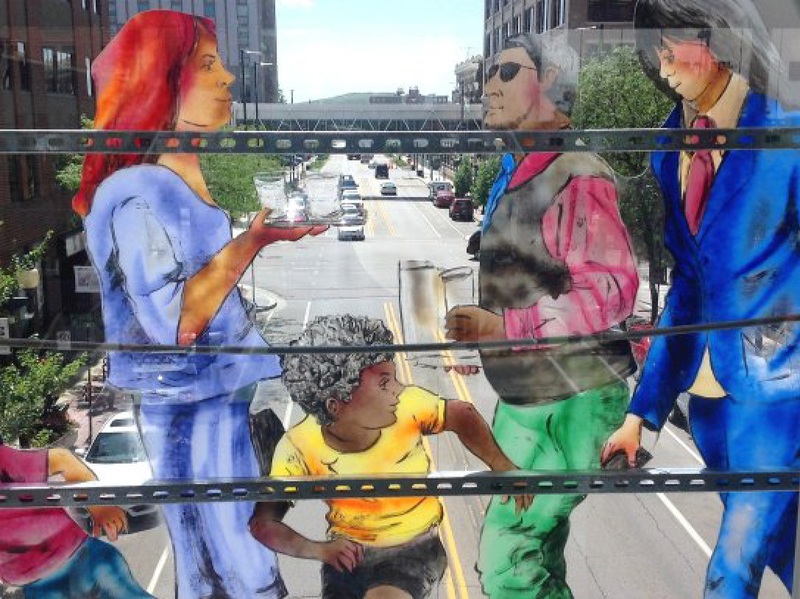 Commissioned by Murals & More: The Cedar Rapids Mural Trail, the sculpture consists of shaped polycarbonate panels with a total of 40 painted figures designed to reflect the people, culture and spirit of Cedar Rapids. Myers-Walker writes about the process of creating “Crossroads” in her September 2016 newsletter posted on her website. She currently lives, paints and teaches in Iowa City. Shannon (Hoy) Gapp (BS 2011 Community & Regional Planning / MLA 2015 Landscape Architecture), Assoc. 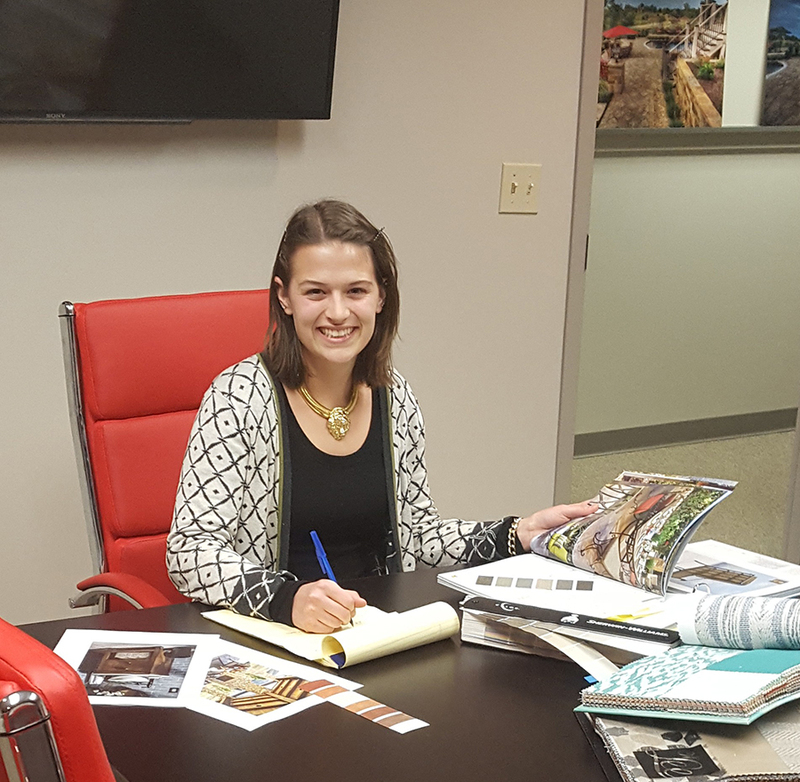 ASLA, is now a landscape designer with Bolton & Menk, Inc., in Des Moines, where she will assist with landscape architecture projects, including the design and development of graphics and construction documents and facilitate public meetings. She previously worked as an urban planner at Confluence in Des Moines for more than a year. Marc Jensen (BA 1972 Applied Art – Advertising Design) has been appointed to the Board of Trustees of The Mint Museum, Charlotte, N.C. An internationally renowned institution, The Mint occupies two locations in Charlotte and features collections of ceramics, craft and design, contemporary American and European art. David Lee Andersen (BA 1974 / MArch 177 Architecture), AIA, architect and consultant with Andersen by Design LLC, received the 2016 AIA Minnesota Louis Lundgren Award. The award recognizes one Minnesota architect annually for his/her dedication to the profession through community volunteer activities and professional leadership. 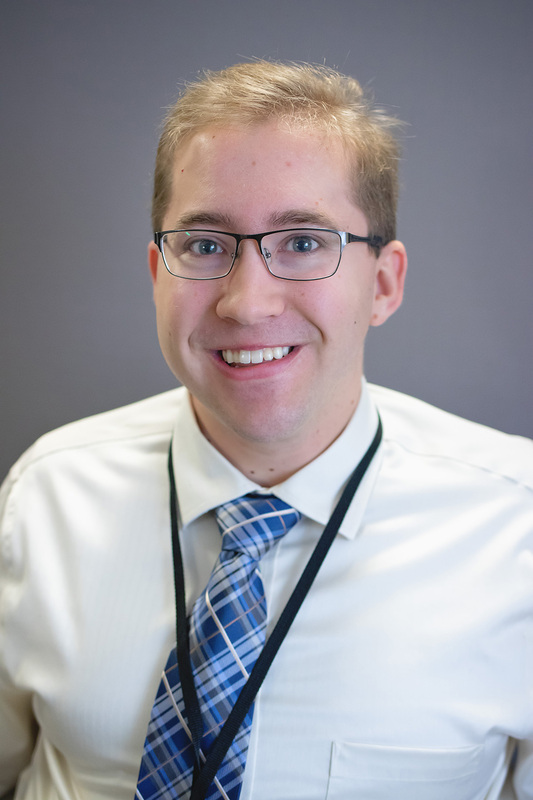 Zach Sunderland (BArch 2013 Architecture), AIA, passed the Architect Registration Examination and is now a licensed architect in North Carolina. He is an architect with Cline Design Associates in Raleigh, N.C.
Lori Vierow (BLA 1992 Landscape Architecture), an award-winning designer with more than 24 years of professional experience in master planning, park and recreation planning, urban design and landscape architecture services for a wide variety of private and public-sector clients, has joined the Chicago office of GreenbergFarrow as senior landscape architect. Her responsibilities include expanding the firm’s landscape architecture department as well as providing design and due diligence services to new and existing clients throughout the US and abroad. She will be based in Arlington Heights, Ill.
Vierow’s experties lies in coordinating interdisciplinary teams in the design and construction of projects ranging from public parks and urban streetscapes to residential, commercial and sustainable developments. 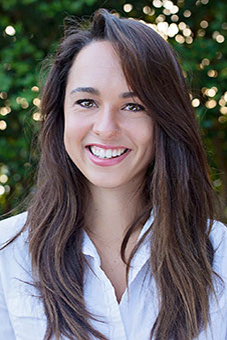 Her professional experience also includes working with clients and communities to develop open space master plans and park master plans that are unique and tailored to fit each community. 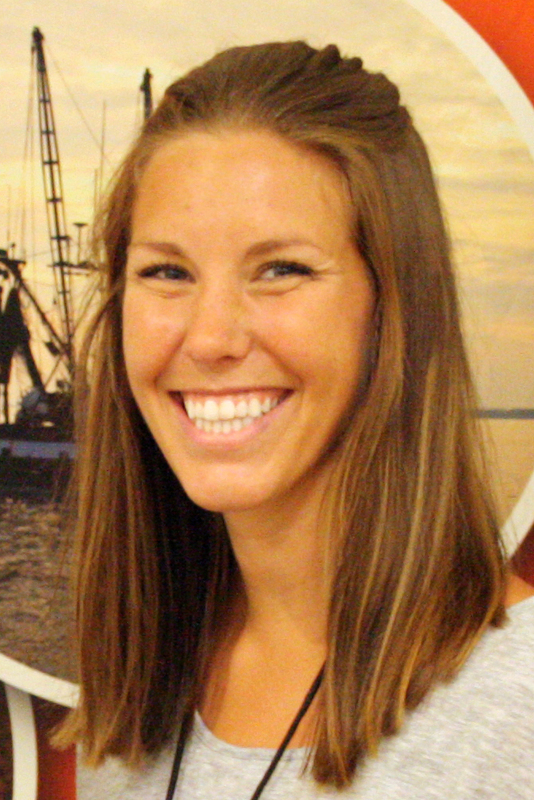 She has assisted in preparation for analyzing service levels and forecasting recreation needs for these communities. Representative projects include Eagle View Park, New Lenox Community Park District Comprehensive Master Plan, Wenonah Tot Lot and Generations at Regency. 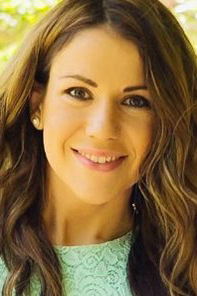 Katherina Dimenstein (BFA 2011 Interior Design) is now working for US Senator Joni Ernst in her Washington, D.C., office as an adviser on veterans affairs, national security, defense and foreign affairs policies. 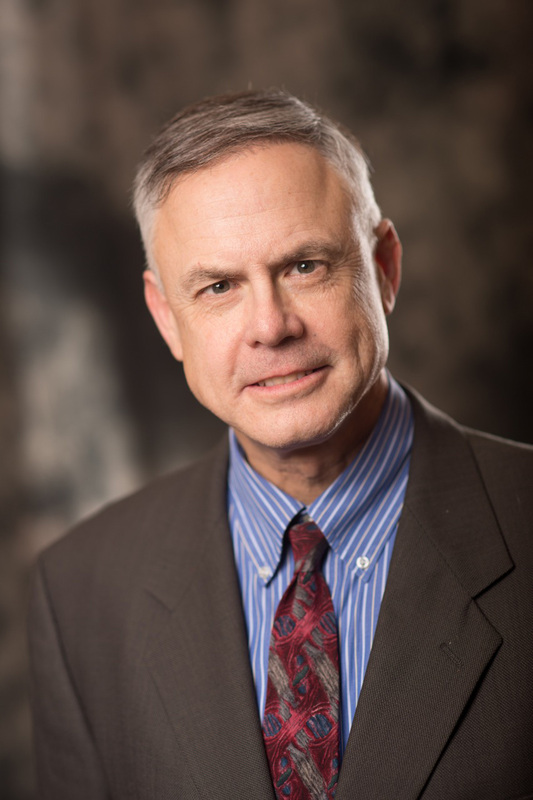 R. Todd Ashby (BS 1992 Community & Regional Planning), executive director of the Des Moines Area Metropolitan Planning Organization, received the Walter Scheiber Leadership Award at the National Association of Regional Councils 50th Annual Conference in Salt Lake City, Utah, in June. The award recognizes the significant impacts an executive director has made at the local, state and national levels. 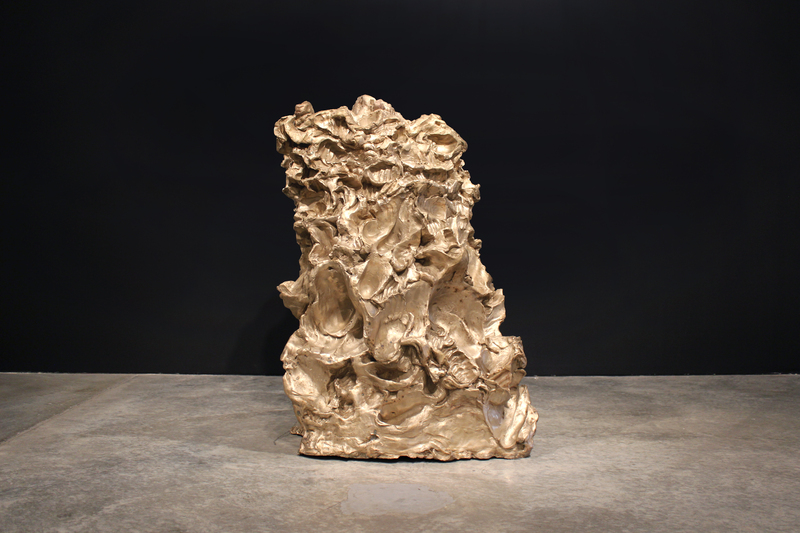 Chiaroscuro: Material Modalities and Immaterial Harmonics, an exhibition of work by Peter Goché (BArch 1991 / MArch 2005 Architecture), assistant professor of architecture at Iowa State University, will be exhibited Sept. 1-8 at the University of Florida School of Architecture Gallery. An opening reception will be from 5 to 7 p.m. Thursday, Sept. 1, with a gallery talk by Goché at 5:30 p.m.
“Black Contemporary,” an article by architecture Assistant Professor Peter Goché (BArch 1991 / MArch 2005 Architecture), has been published in “Material Vocabularies,” the International Journal of Interior Architecture and Spatial Design (ii journal), Vol. IV. Lee Rainboth: Epicenters, an exhibition by Lee Rainboth (BFA 2007 Integrated Studio Arts), founder and executive director of Living Media International, is on display July through December 2016 in the Multicultural Center at the Iowa State Memorial Union. Rainboth has spent his career traveling, researching and experimenting with global artistic traditions to see how people find ways to express what emanates from their spiritual core. Using friends in Haiti, he placed his subjects in iconic poses that reference representations of saints. Patterned sequin designs inspired by Haitian voudun flags and mandala art originating from Buddhist and Hindu practices surround each figure. Rainboth’s intention is to go beyond the stereotypes and to share a single, yet multi-layered story about who the people in the paintings really are. 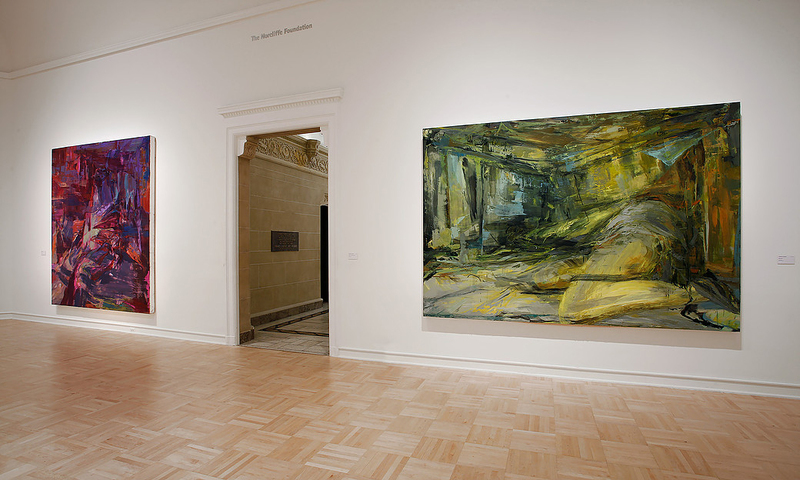 Matthew Corones: Hyperreal Spectacular, an exhibition of paintings by Matthew Corones (MFA 2012 Integrated Visual Arts), Ames, is on display July 7 through Oct. 24 in the Iowa State Memorial Union Pioneer Room. Using a fusion of nonrepresentational brushstrokes and stenciled shapes, Corones painted on a clear film surface. The painted film shows detailed textures, interesting transparency and the artist’s bold color relationships. Viewers can find shapes inspired by Henri Matisse, Jean-Michel Basquiat and Paul Klee and experience the overlay of ideas from a range of sources. Kathryn Finney (BA 1983 Art & Design), creative director of Live Happy magazine, received the top honor for Art Direction – Single Article/Feature in min’s Magazine Media Awards for “A Joyful Juggling Act,” a feature on actor Anthony Anderson. Comedy for All, Tragedy for None, an exhibition curated by Alex Priest (BLA 2011 Landscape Architecture), will run from Sept. 2 through Oct. 28 at the Nebraska Arts Council’s Fred Simon Gallery in Omaha, Neb. Priest, the exhibition manager at the Bemis Center for Contemporary Arts in Omaha, is the first curator to be awarded an exhibition at the Nebraska Arts Council. 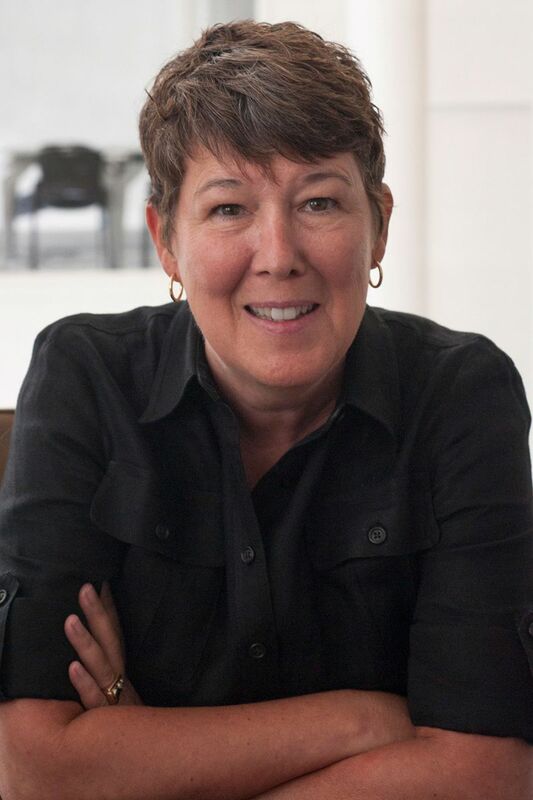 Kate Schwennsen (BA 1978 / MArch 1980 Architecture), FAIA, director and professor of the Clemson University School of Architecture in Clemson, S.C., is the recipient of the 2016 Christian Petersen Design Award presented by the ISU College of Design. 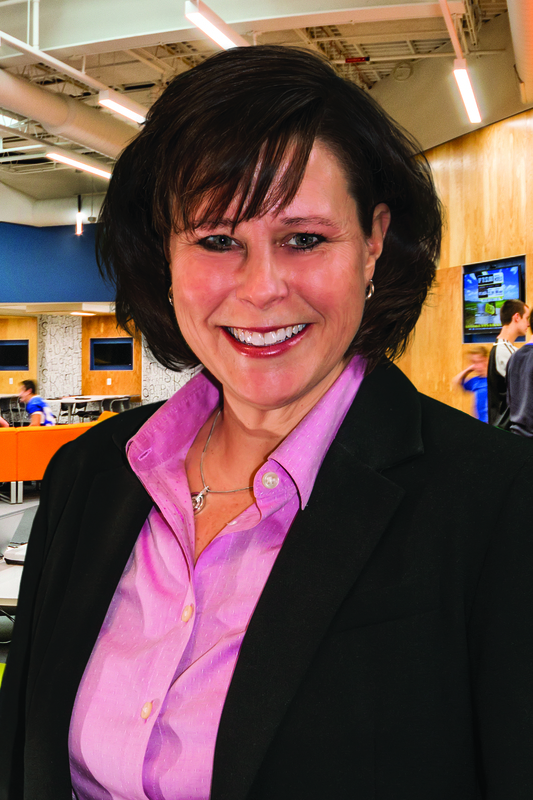 She will be honored during Homecoming Oct. 28 at the ISU Alumni Association’s 85th Honors and Awards Ceremony. Michael C. Ludwig (BFA 2000 Art & Design – Drawing/Painting/Printmaking) is now the art director and project manager at I Work & Play in Clive, Iowa. He had been with Image Sport in Waukee. 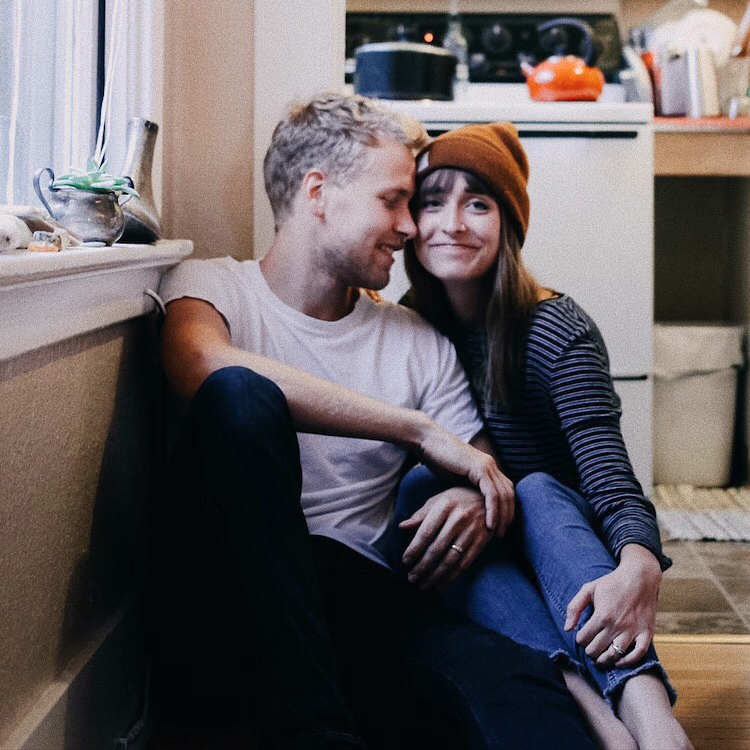 Paulina (Coursey) Colton (BFA 2015 Interior Design) and Ben Colton (BS 2015 Mechanical Engineering) were married May 7 in Burlington, Iowa, and now live in the Kansas City area. Courtney Long (BLA 2010 Landscape Architecture / MS 2012 Sustainable Agriculture), a research associate with the ISU Community Design Lab, received the Second Runner-Up for Outstanding Partnership Award in the 2016 Farm Credit MarketMaker Innovation Awards for the Agricultural Urbanism Toolkit program at Iowa State. Long leads a team that conducts food systems and health assessments for communities in Iowa. MarketMaker was the tool used to identify food-system gaps and assets around the state and identify opportunities for innovative projects that are complementary to existing agricultural enterprises. Long was recognized at the 18th annual National Value Added Agriculture Conference in Madison, Wis.
Becky (Murphy) Simpson (BFA 2010 Graphic Design) will be a featured speaker for the Adobe MAX 2016 Creative Careers Track Nov. 2-4 in San Diego. Meghan Flynn (BFA 2011 Integrated Studio Arts) will join the faculty at Yakima Valley Community College, Yakima, Wash., as an art instructor in September. She will teach drawing and design. Matthew Schultz (BArch 2012 Architecture), Assoc. AIA, an architectural intern with OPN Architects in Des Moines, is a member of the Greater Des Moines Leadership Institute’s Community Leadership Program Class of 2017. Each year, 50 emerging and existing leaders from the private, public and nonprofit sectors of the community are selected to participate in this nine-month program, which offers a view of Greater Des Moines from different vantage points, heightens participant awareness of current conditions and issues, enhances individual and group leadership skills and helps class members see themselves as partners for change. 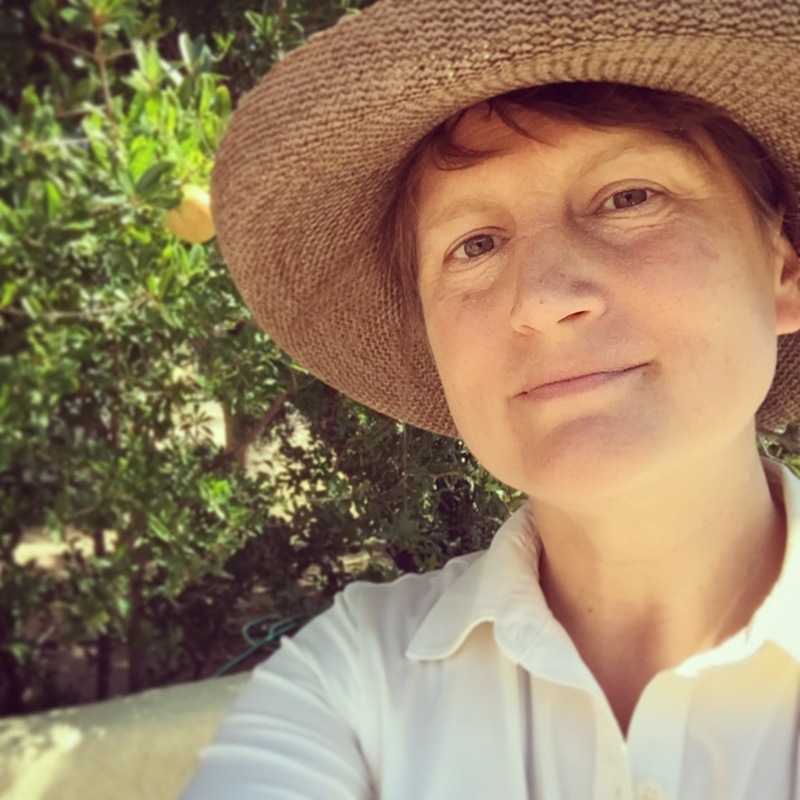 Lisa Orgler (BLA 1992 / MLA 2000 Landscape Architecture), a lecturer in horticulture at Iowa State University, will receive the 2016 ISU Award for Early Achievement in Teaching for non-tenure-eligible faculty Sept. 26 at the University Awards Ceremony. 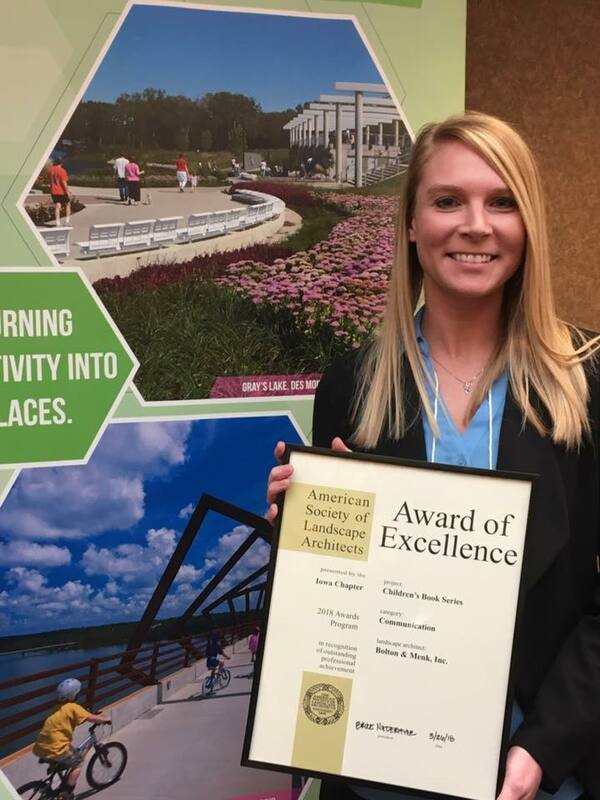 Samantha (Abkes) Price (BLA 2009 Landscape Architecture) passed the Landscape Architecture Registration Examination (LARE) and is now a licensed landscape architect with Ritland + Kuiper Landscape Architects in Waterloo, Iowa. She has been a design professional with RKLA since May 2011. She has remained involved with Iowa State University through her participation in the Iowa’s Living Roadways Community Visioning Program, a partnership of ISU landscape architecture extension, the Iowa Department of Transportation, Trees Forever and local design professionals. 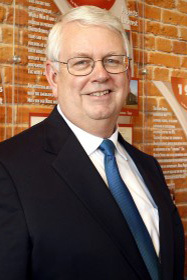 Tom Gerend (BS 2000 Community & Regional Planning), executive director of the Kansas City Streetcar Authority in Kansas City, Mo., is a recipient of the 2016 Design Achievement Award presented by the ISU College of Design. He will be honored during Homecoming Oct. 28 at the ISU Alumni Association’s 85th Honors and Awards Ceremony. 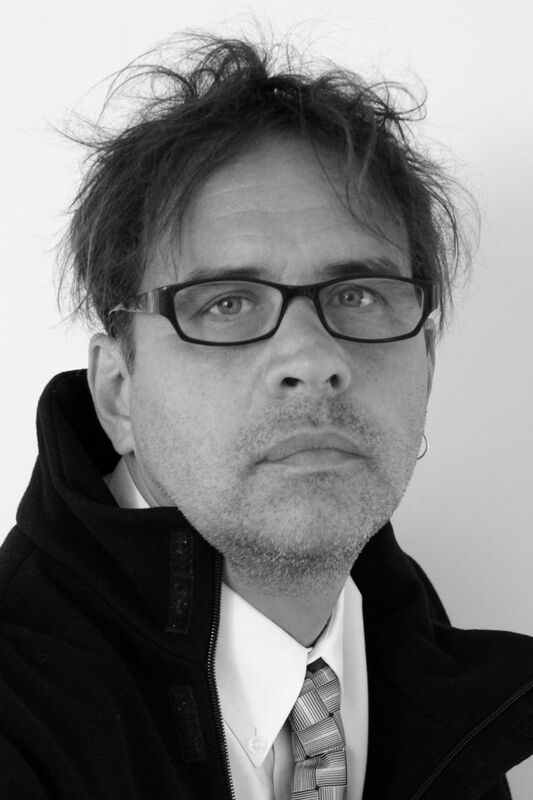 Michael Braley (BFA 1993 Graphic Design), creative director of Braley Design in Lexington, Ky., is a recipient of the 2016 Design Achievement Award presented by the ISU College of Design. He will be honored during Homecoming Oct. 28 at the ISU Alumni Association’s 85th Honors and Awards Ceremony.